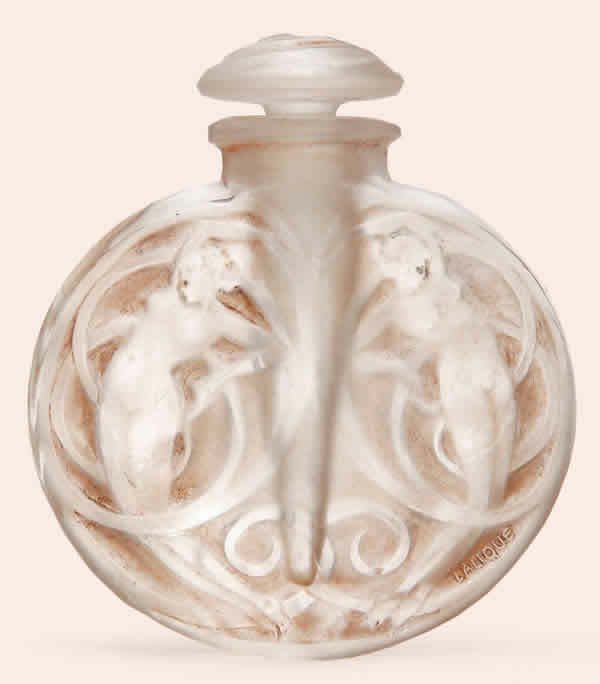 Here are all of the R. Lalique Perfume Bottles in our database sorted by the company for which they were created. 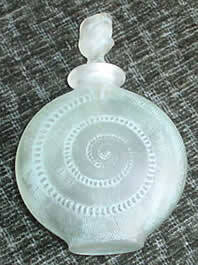 Testers are included here, but not Boxes or glass hang tags which are essentially Pendants. 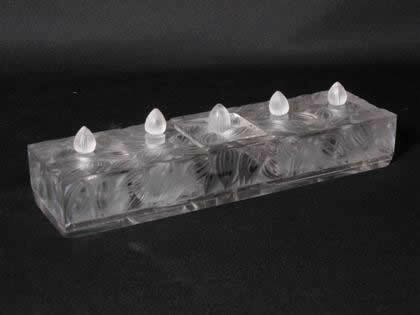 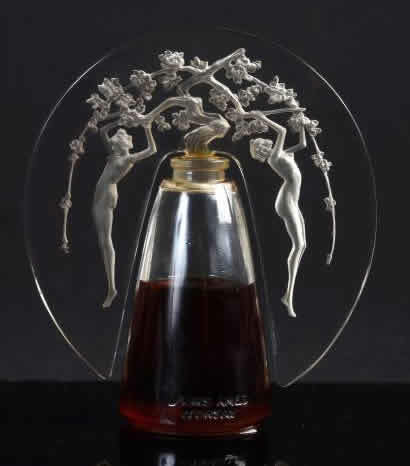 There are a small number of publicity plaques or signs designed or made by Lalique for different perfumers. 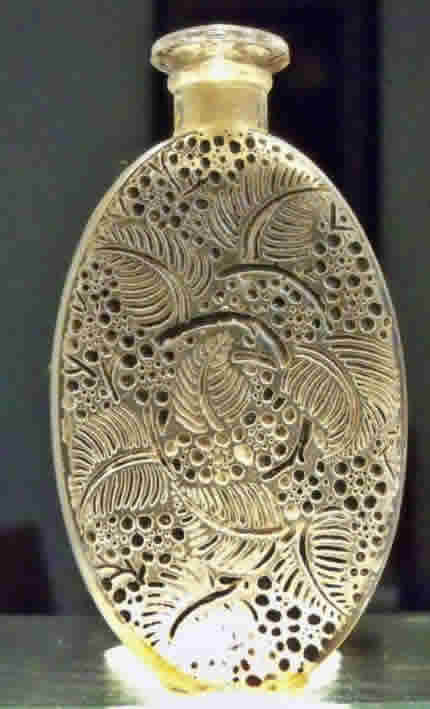 These plaques are found in the Signs section of the catalogue. 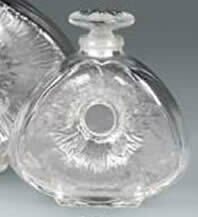 If you don't see your perfume bottle here, also look in Vases for the couple of stoppered vases, or in Decanters. 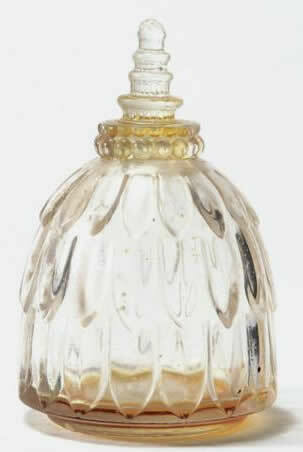 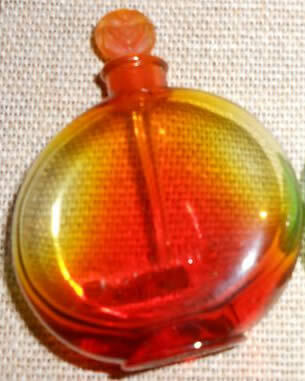 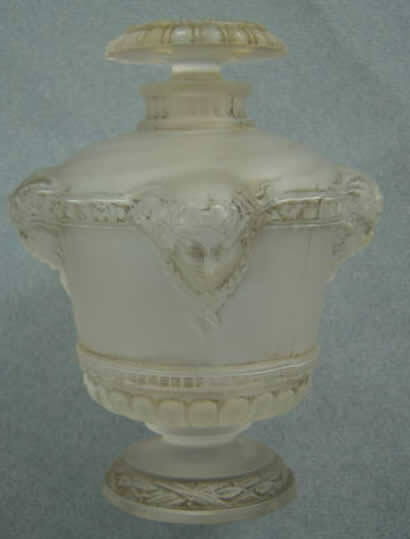 There are also a few Cire Perdue Perfume Bottles and stoppers that are found on the Cire Perdue Page. 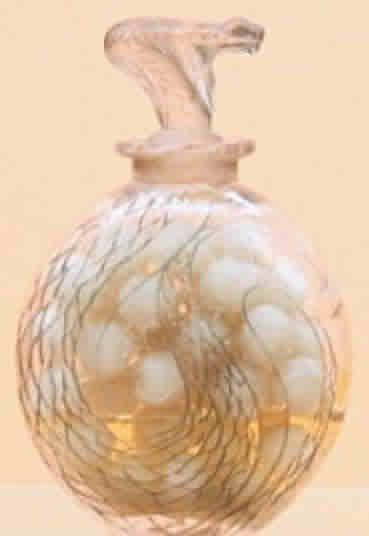 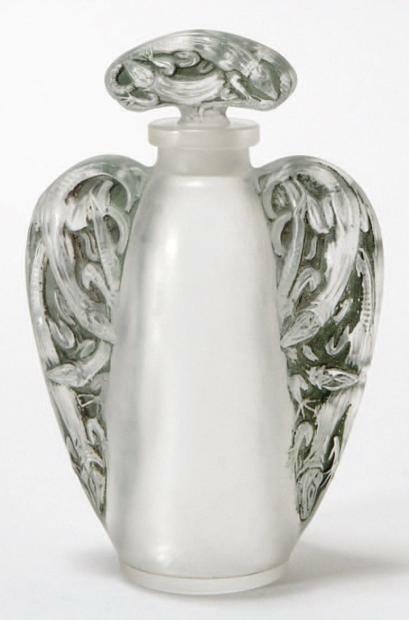 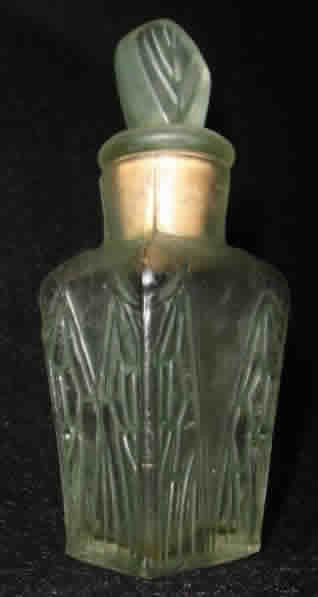 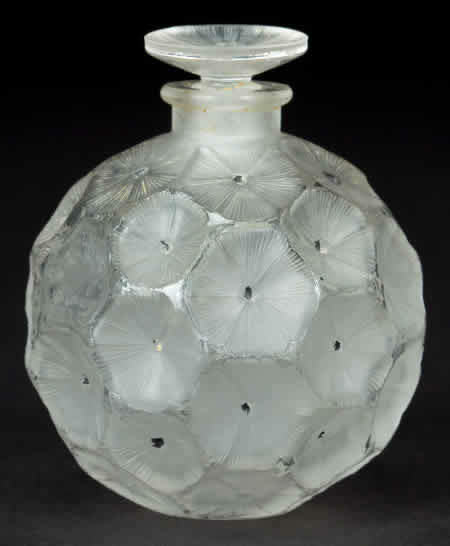 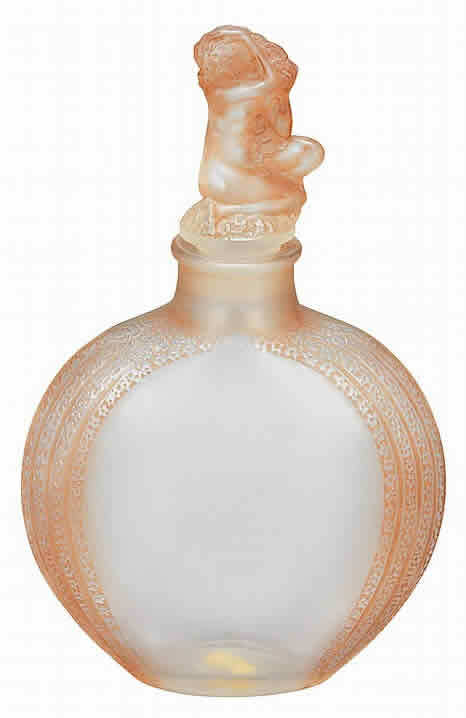 About 374 R. Lalique Perfume Bottles Are Shown Out Of Approximately 400 Models. 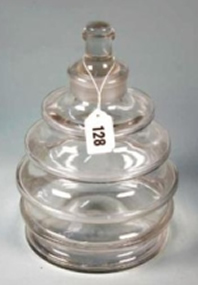 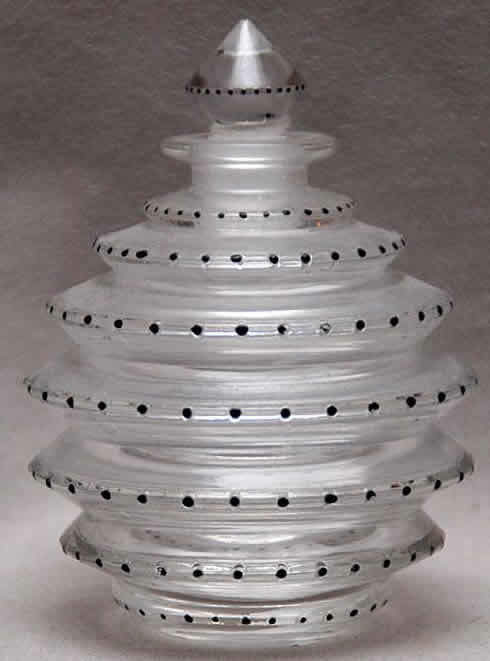 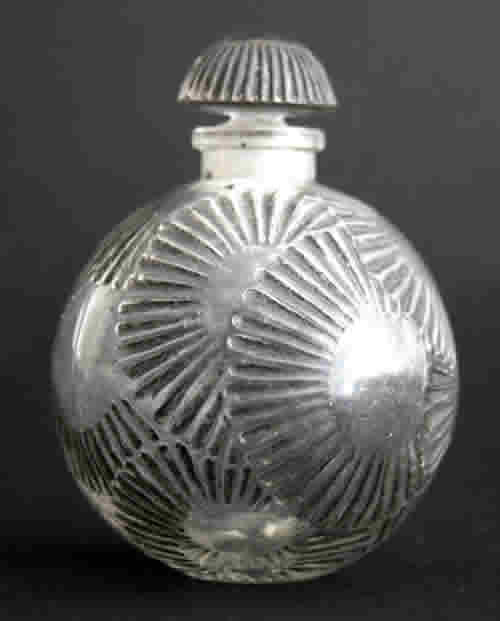 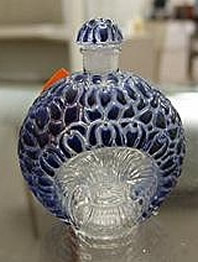 There are also an unknown number of likely unique or extremely rare non-cire perdue perfume bottles such as prototypes and models. 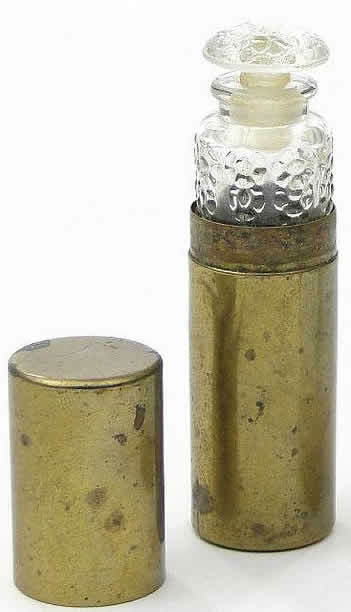 Those are included here. 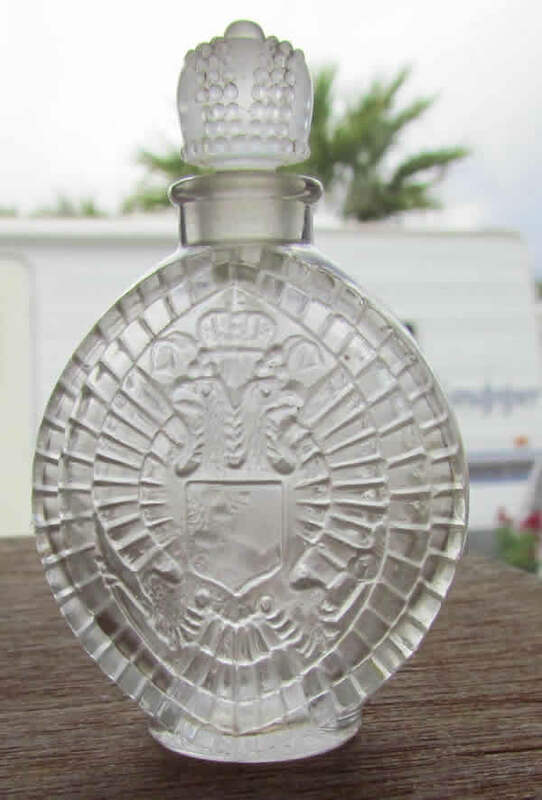 The Alpy bottles are a bit of a mystery. 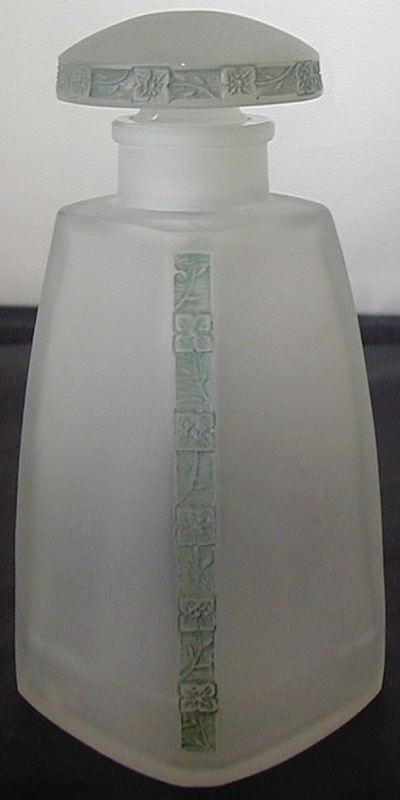 There is a Rene Lalique et Cie record indicating a run of 5 different lavender bottles just after the crash in November of 1929. 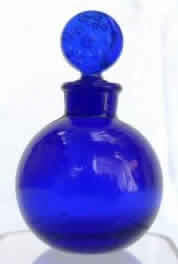 And 5 sizes of very similar lavender decorated bottles have appeared. 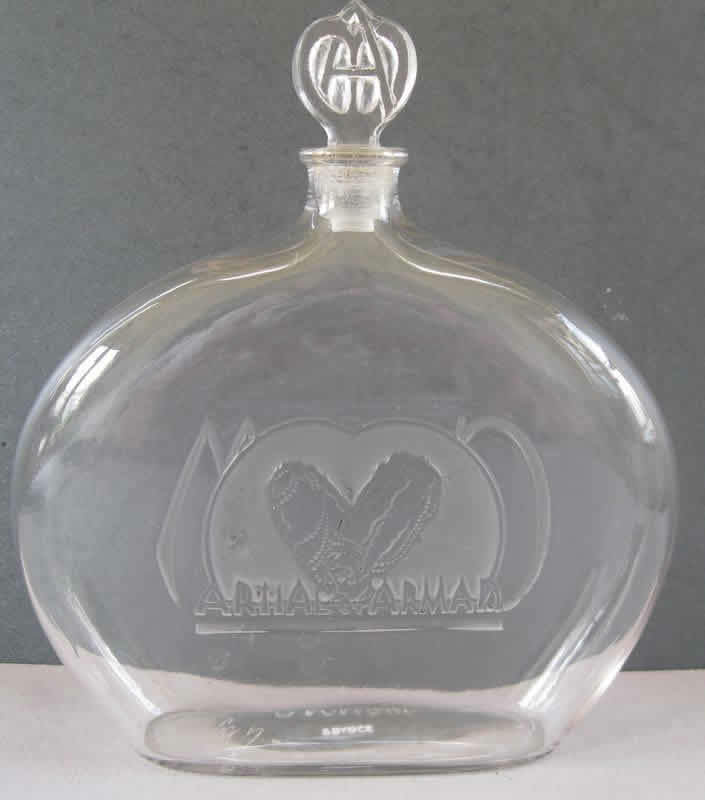 Some of the bottles have the molded lettering Lavande Alpy and Apt_Vaucluse. 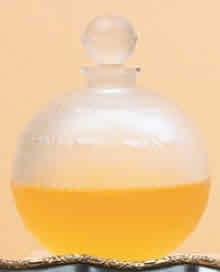 Lavande (Lavender) is well known in the area of Apt Vaucluse in France. 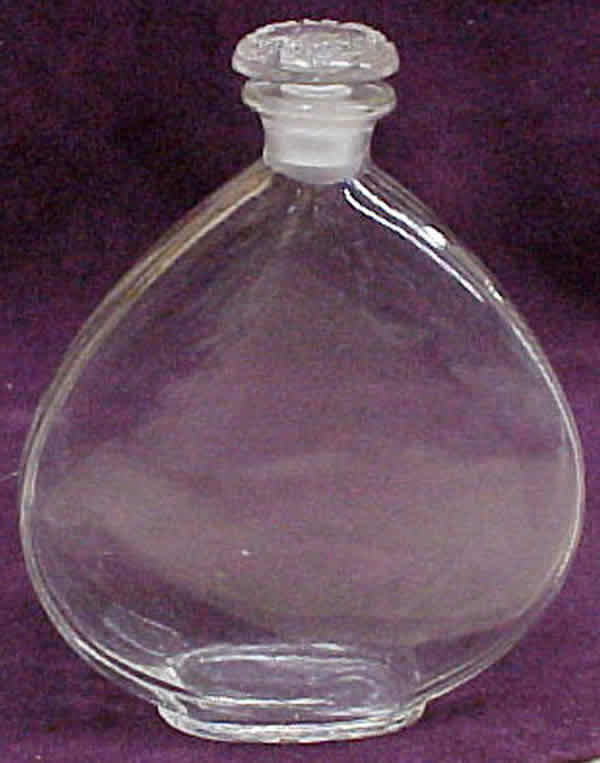 But after that it's a blank. 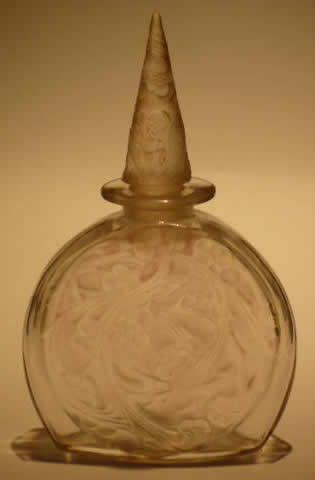 And that blank includes Alpy, which we assume is a name but we don't know. 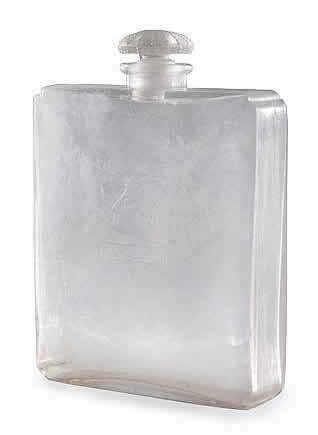 We have never seen a bottle with an applied label, still sealed, with any contents, with tags, or with a box. 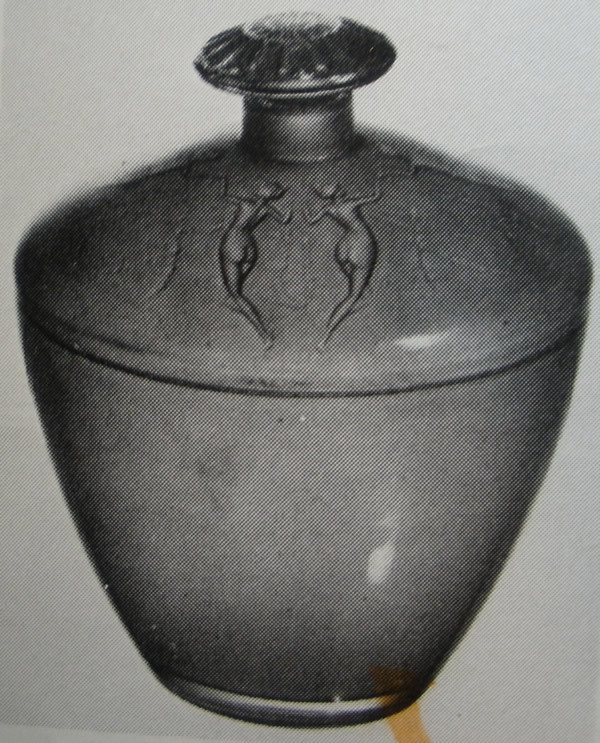 The luxury goods shop Madeleine et Madeleine (that had as one of its principals Jeanne Hallée, the sister of legendary French fashion designer and perfumer Paul Poiret) was located on the Champs-Elysées in Paris. 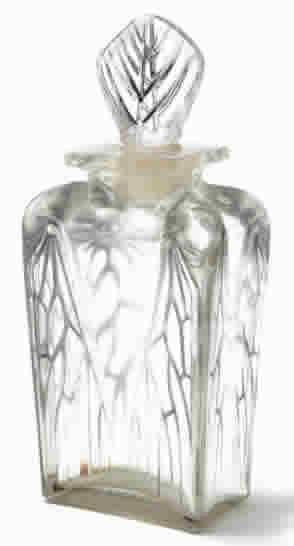 In 1927 they ordered their first and only bottle design from Rene Lalique for their inaugural fragrance. 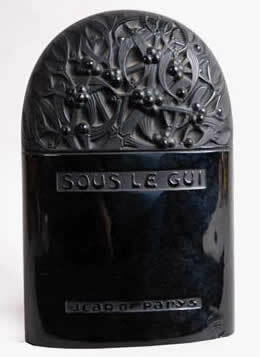 French perfumer Dr. Lucien Graux, founder of the Arys brands became a customer of Rene Lalique in 1916. 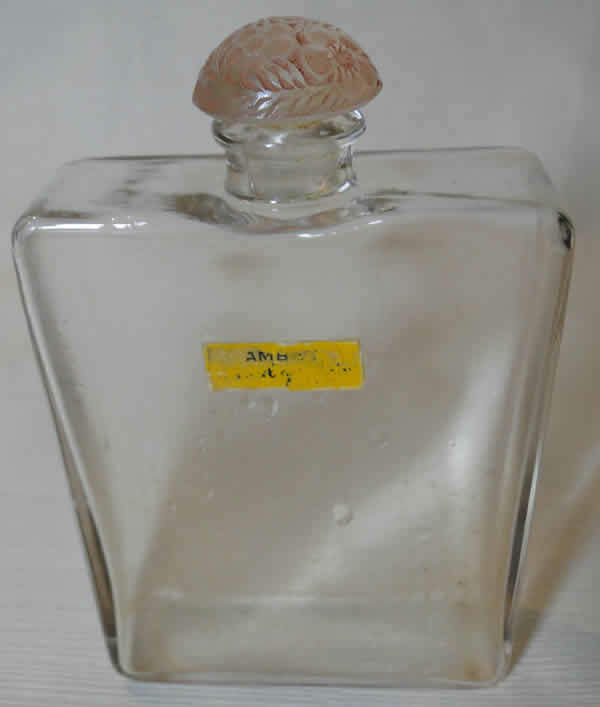 By the early 1920's Arys was an international brand selling in many countries, and by 1925 he was known as an expert and innovator in the field. 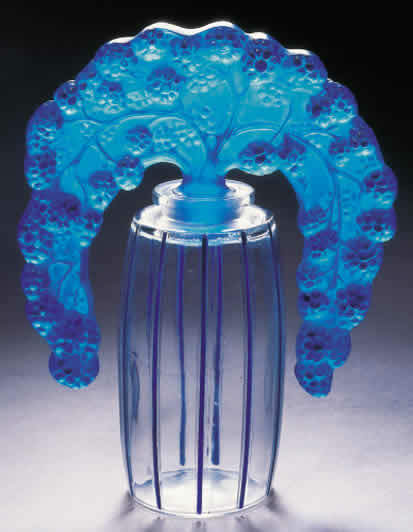 Lalique would eventually create over 20 different flacons for Arys, the last one coming in 1929 just before the start of the great depression. 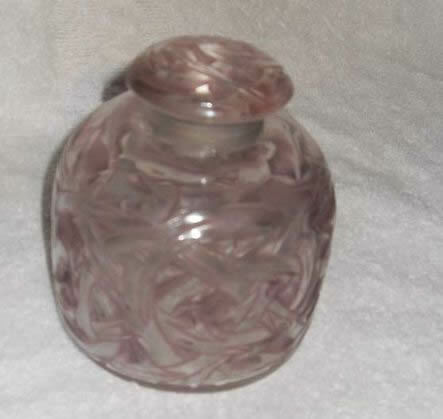 Graux died at the hands of the Nazis at Dachau in 1944. 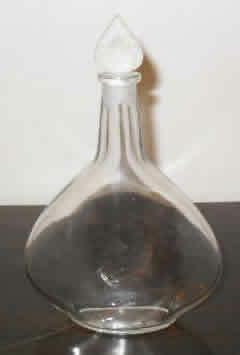 A. Bertelli & Co. was a Milan Italy based pharmaceutical company founded in 1898. 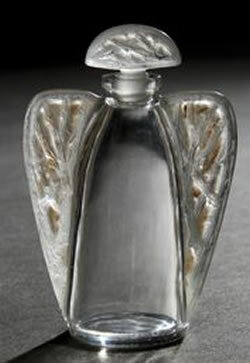 No later than 1904 they were in the perfume business and were creating fragrances in France. 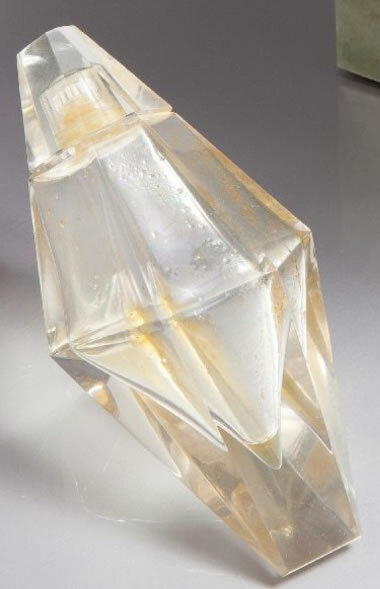 The fragrance Eva was created in 1912 and was presented in bottles by at least 2 other glassmakers prior to 1926, when Rene Lalique created his only known bottle for Bertelli. 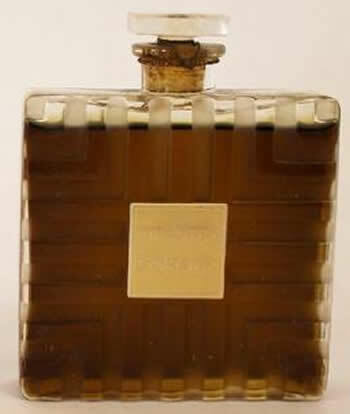 We don't know what became of Bertelli, but we have seen reports that they marketed roughly 80 different fragrances stretching all the way into the 1950's. 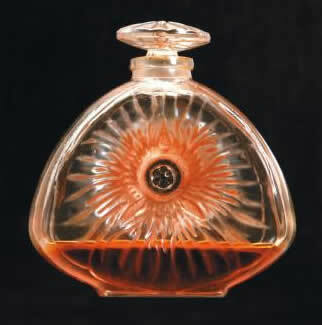 Burmann (also de Burmann and Parums de Burmann) was started in 1934 by Stephani Burdin and Andre Baumann. 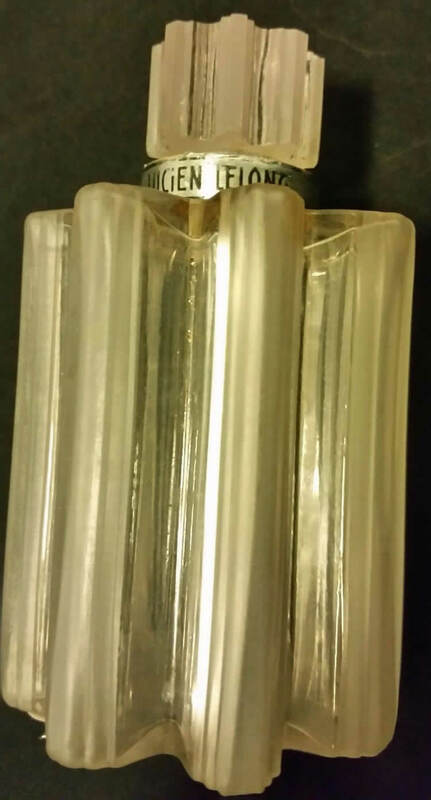 The company name is a conflation of the founders last names. 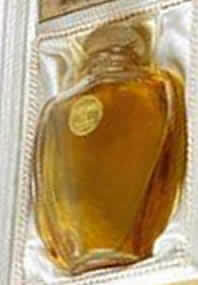 They created about 7 scents and are known to have used three different flacons from Rene Lalique. 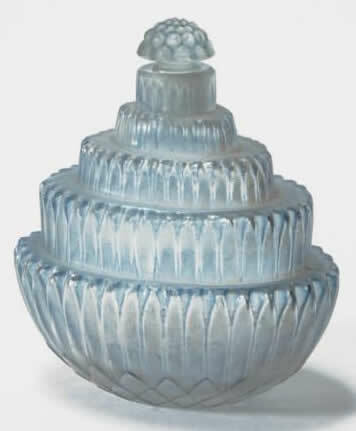 They have been reported to have worked at various times out of Paris locations at 4 Rue De La Verrerie (possibly before forming Burmann) and also from a shop on the Champs-Elysées. 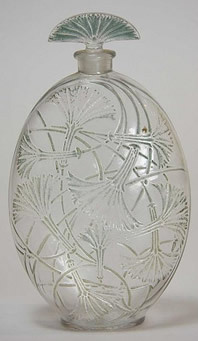 The Rene Lalique et Cie records indicate a single flacon and stopper for Canarina in 1928. 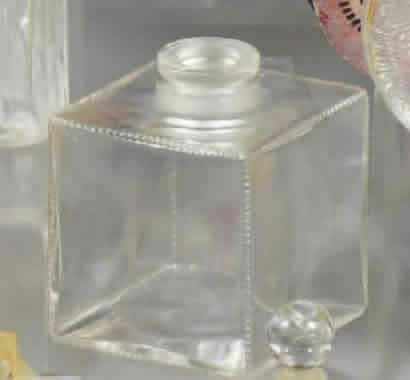 The boxes it has been found in say Canarina. 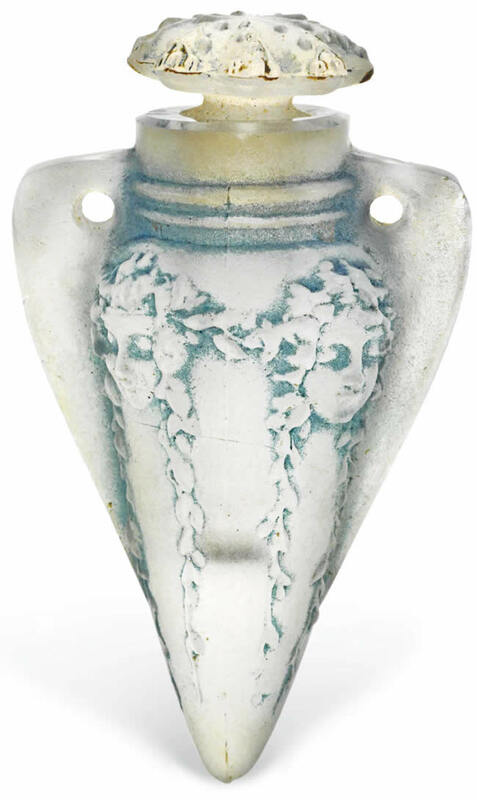 And Canarina is also molded into the side of the dauber stopper. 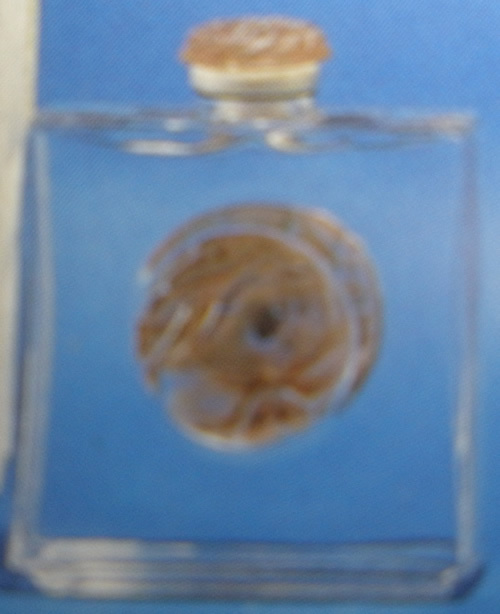 But if this is the name of the "unknown" perfumer or the name of the fragrance (or both) we cannot say. 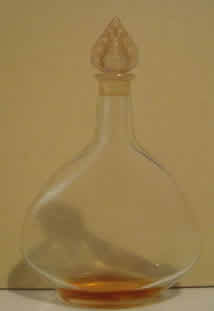 We don't know of any documentation to support any assumption. 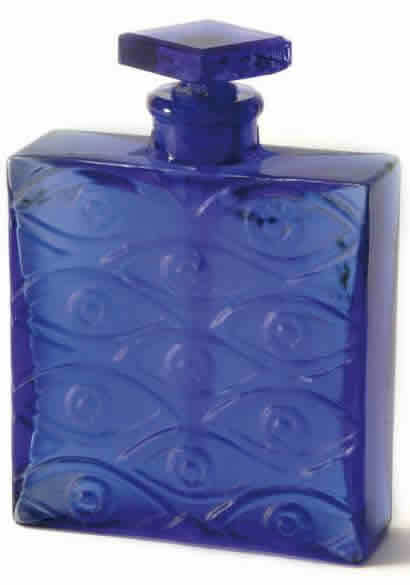 And so naturally the name given for the fragrance Les Yeux Bleus (The Blue Eyes) is just made-up as far as we know. 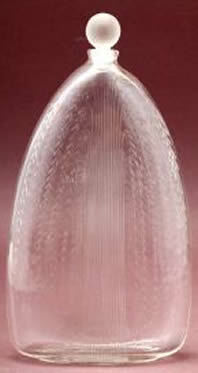 Ever hear of Colgate-Palmolive? 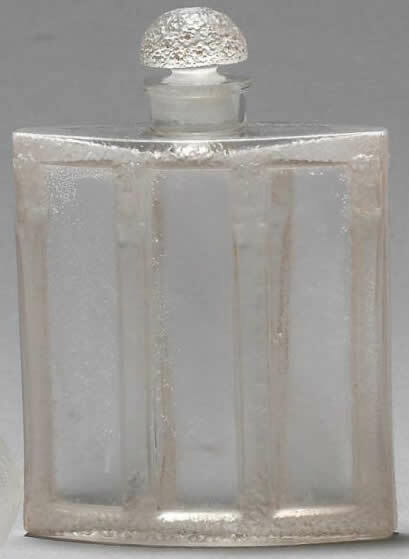 In 1806 William Colgate went into business in New York City making soap and candles and other consumer items. 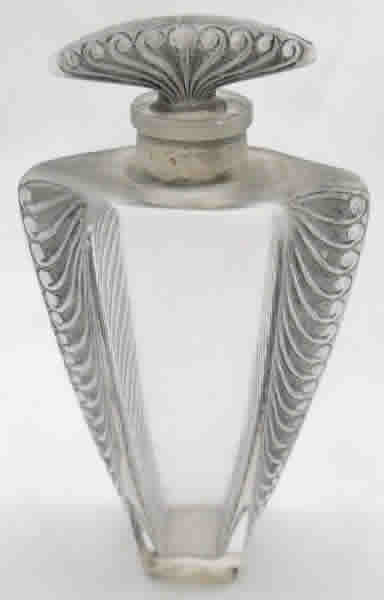 He died in 1857 and the business was taken over by his son Samuel and the name was changed to Colgate and Company. 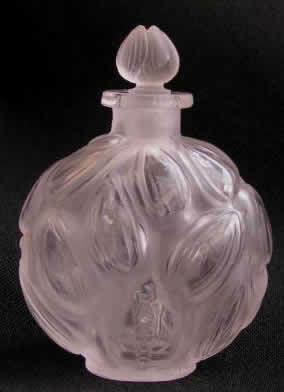 By 1866 they were making perfumed soaps and perfumes. 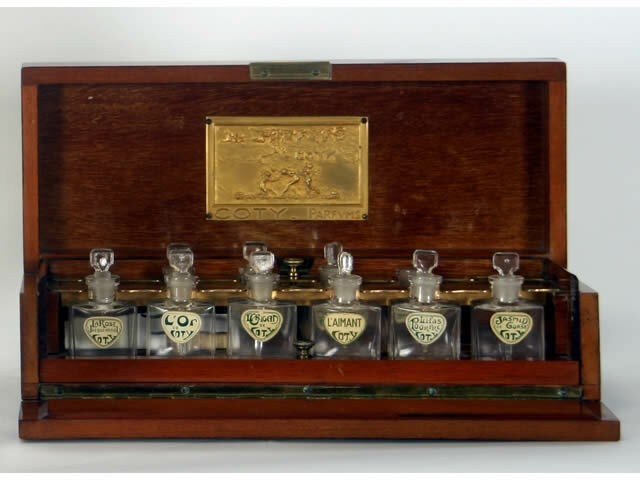 1873 brought on toothpaste in jars and 1896 rang-in toothpaste in tubes. 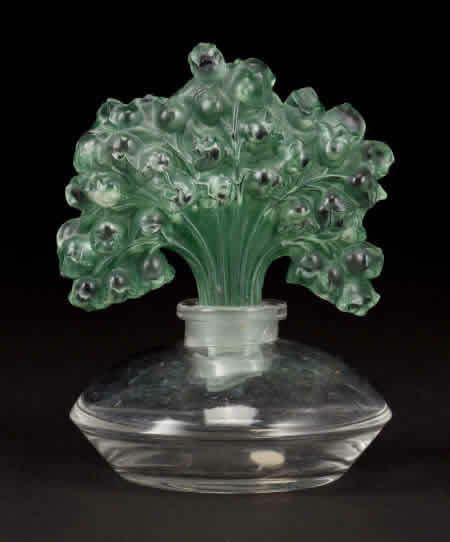 By 1906 they are reported to have had over 600 varieties of perfumes and over 800 total products with the soaps and dental related business. 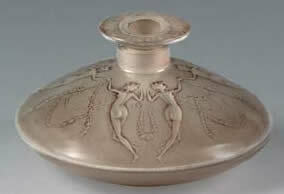 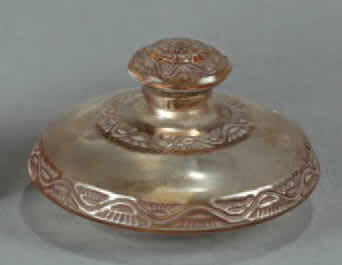 In 1913 Lalique created a disk shaped squat bottle for Colgate as they sought to market a newly created luxury fragrance. 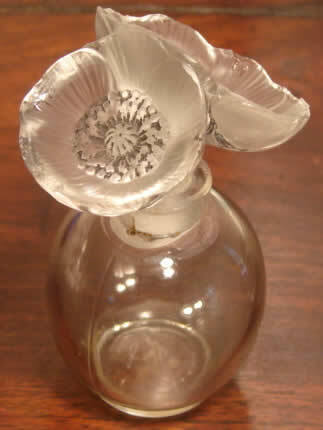 The Unknown Flower bottle was followed 12 and 14 years later by two more. 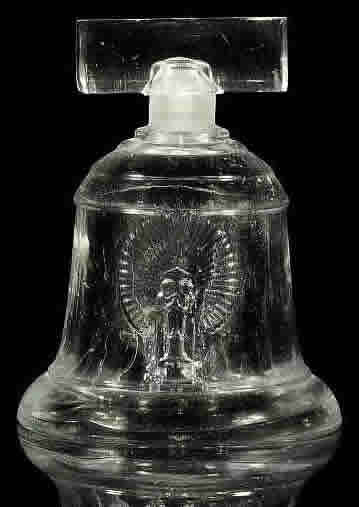 All three are shown below. 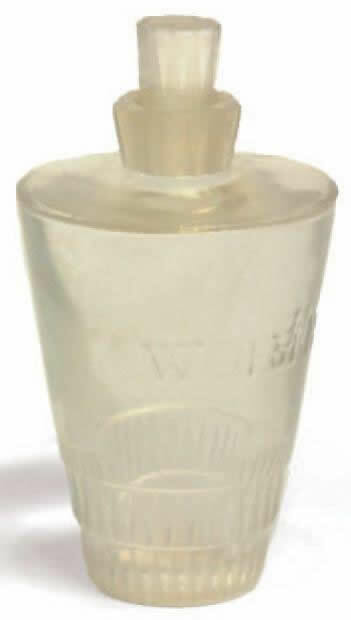 In 1928 the Wisconsin soap maker made famous by selling a soap that contained palm oil and olive oil that was so popular they changed the name of the company, bought out Colgate. 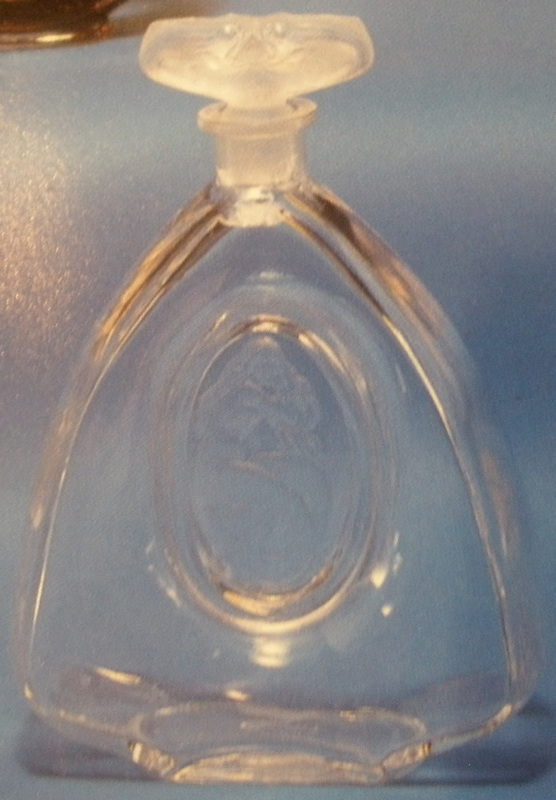 Today, Colgate-Palmolive employs nearly 40,000 people and is known worldwide for its name brand dental products, cleaning products, and soaps. 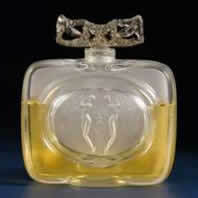 The old perfume business is an historical footnote. 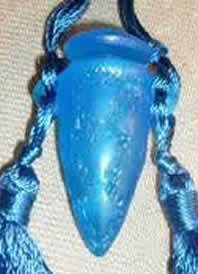 And even if you weren't wondering, it's true. 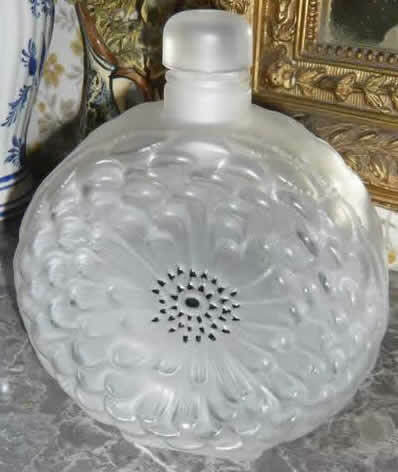 Colgate-Palmolive and a couple other soap companies ran so many advertisements on radio broadcasts and later television series for these never ending daytime drama shows directed at women, that the shows came to be known as Soap Operas! 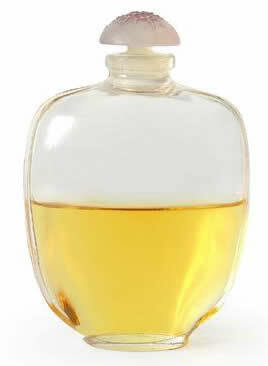 Corday is said to have been named after Charlotte Corday, who was famous for her participation in the French revolution. 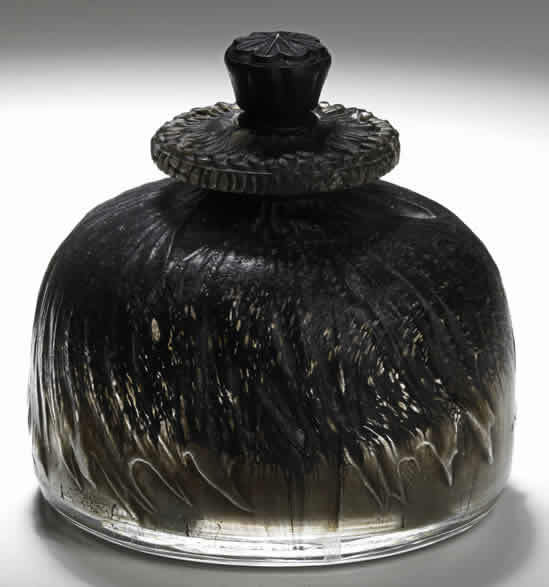 She is best known for having stabbed to death Jean-Paul Marat, one of the more radical Jacobin leaders. 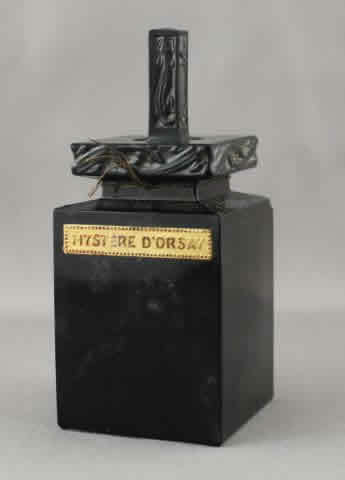 She was executed by guillotine just 4 days after the stabbing and only 10 days before her 25th birthday. 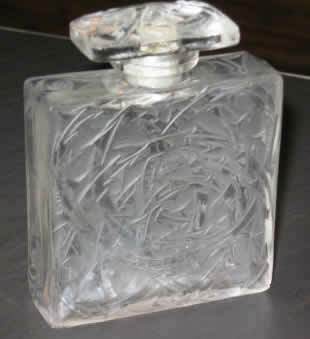 Corday was founded in 1924 by Blanche Arvoy. 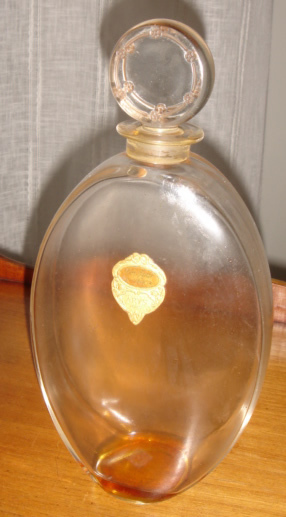 Blanche was also the owner of the perfumer Javoy. 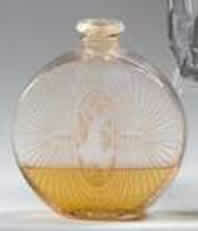 It was 14 years after the founding that Rene Lalique would design and produce his one bottle for Corday. 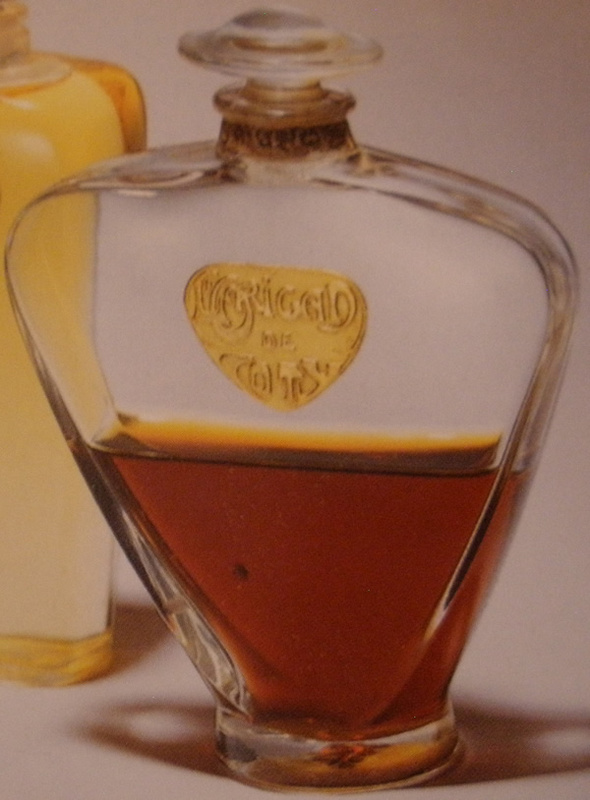 That distinctive bottle was for the 1938 fragrance Tzigane. 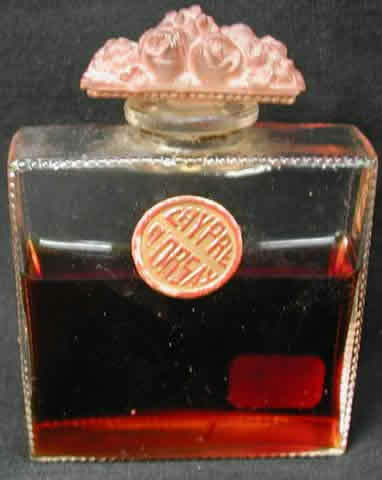 Corysé was founded by Maurice Blanchet in 1919 at 64 Rue De La Chaussée-d'Antin in Paris. 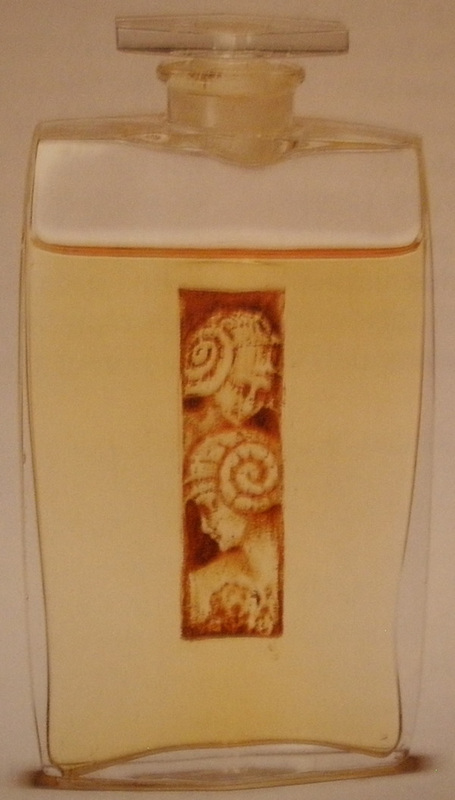 10 years later it merged (or acquired) the perfumer Salomé and the name was changed to Corysé-Salomé. 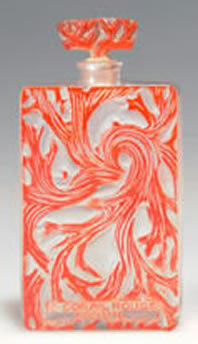 Lalique created one bottle in 2 sizes with a couple of variations for Corysé. 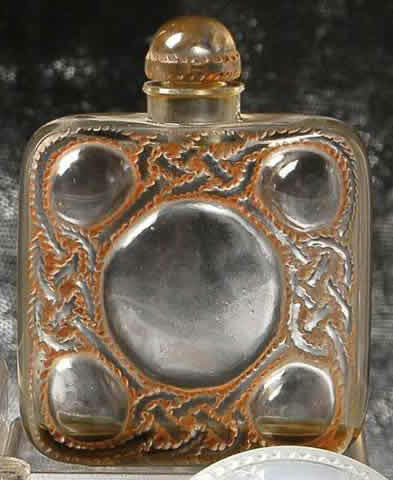 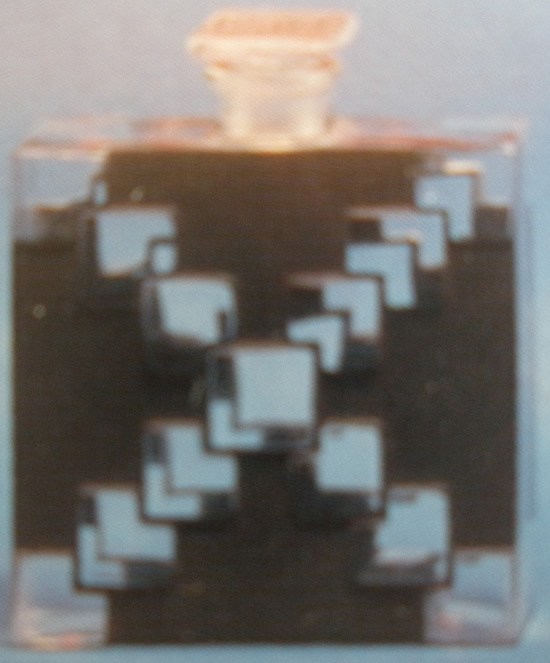 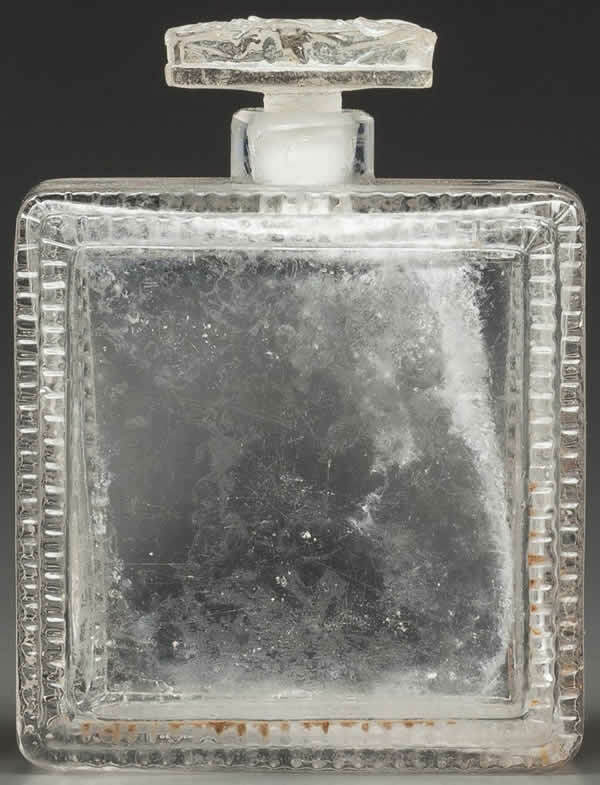 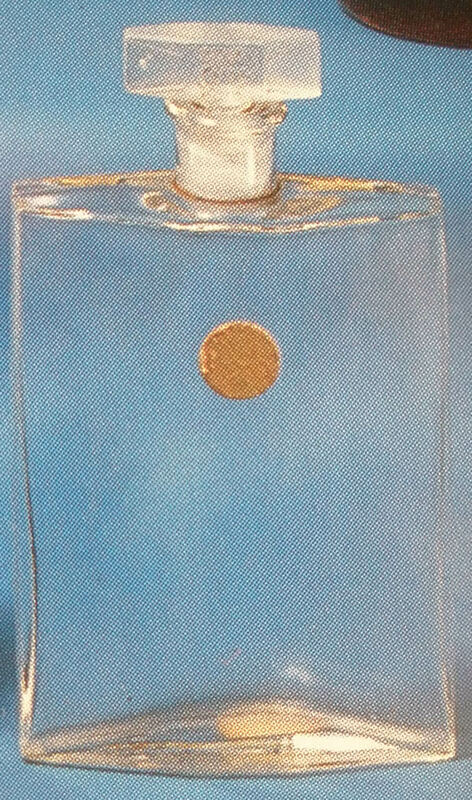 The 1926 bottle for the fragrance Vinca was a square container, some of which were made with canted corners. 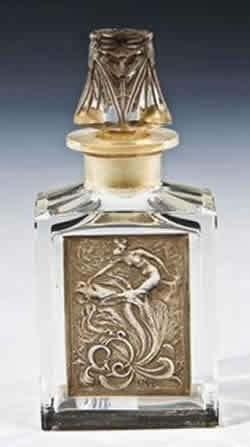 The canted corners version was also later used in 1929 for the Corysé-Salomé fragrance Opéra. 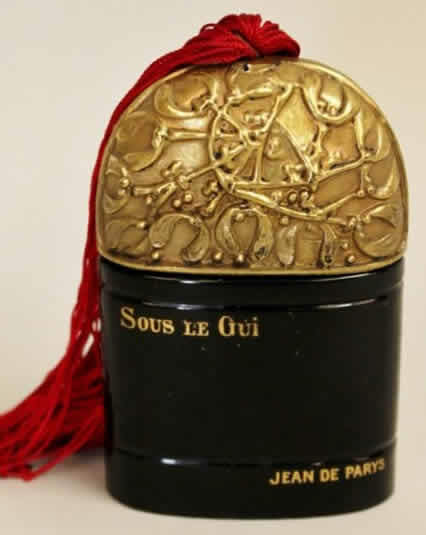 In 1904, following his legendary success in selling La Rose Jaqueminot at the Grand Magasins du Louvre, 30 year old perfumer François Coty opened his own fragrance shop in Paris. 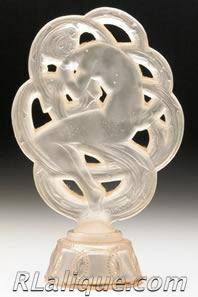 Beginning in 1907 he commissioned Rene Lalique to work on various elements of his presentations including labels and glass plaques. 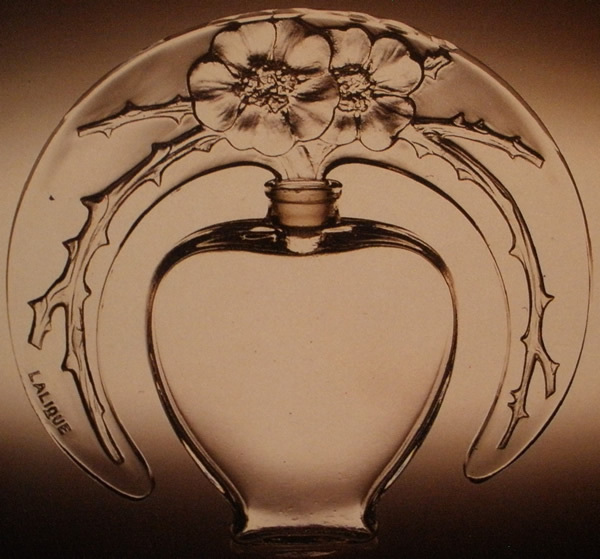 By 1909, Lalique designed and produced his first complete bottle (Cyclamen) for Coty. 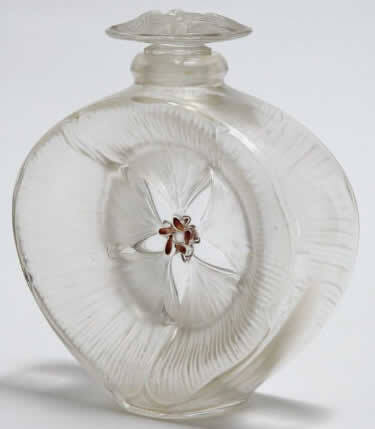 Luxury perfume had never before been accessible or affordable to the masses, and these commissions were intended to assist in Coty's efforts to make this possible. 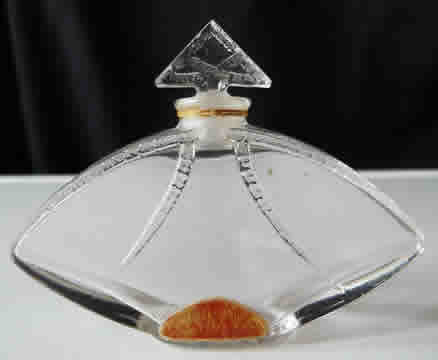 Coty was a marketing visionary, and his insight into the importance of bottle design for the purpose of expanding perfume sales was spot on. 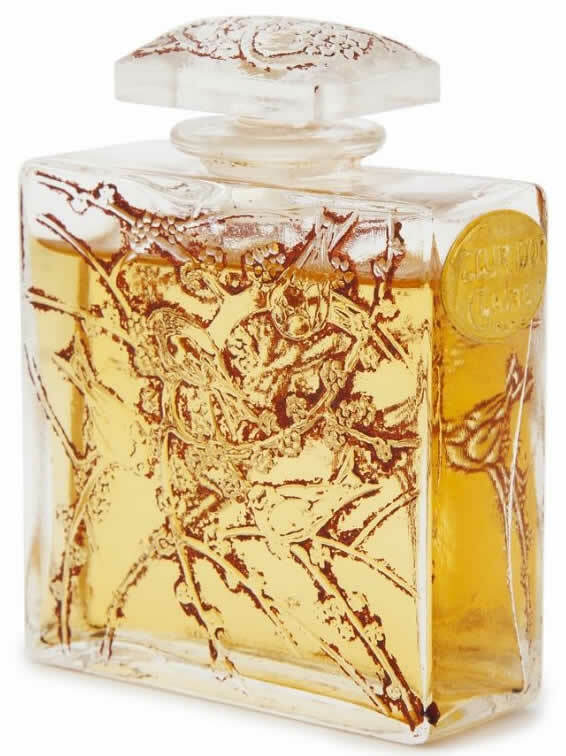 His strategy and his fortunate collaboration with Rene Lalique proved immediately successful, revolutionizing the fragrance industry and leading the drive to make perfume a mass-market luxury product available across the globe. 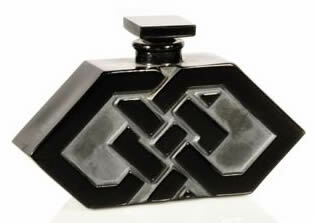 Coty fell on hard times after the crash of 1929, and scandalously lost control of his company to his ex-wife. 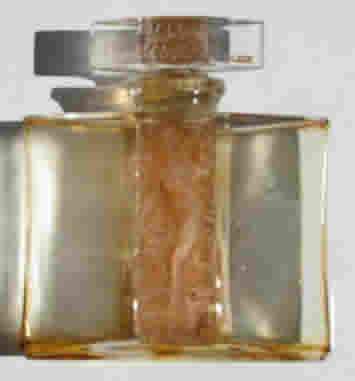 She hung on in one form or another until the early 1960's, when she sold her shares in Coty to the big international company Pfizer. 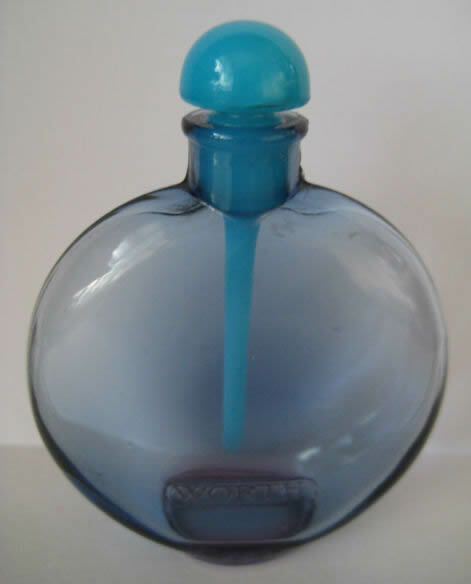 30 years later Pfizer sold Coty to a subsidiary of the German company Joh. 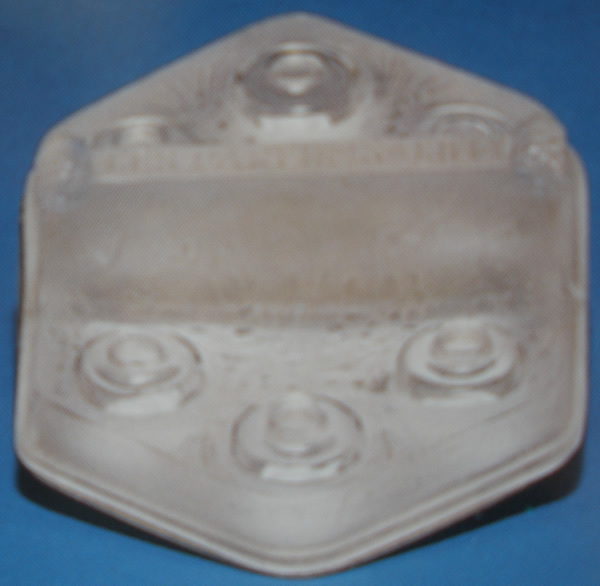 A. Benckiser GmbH. 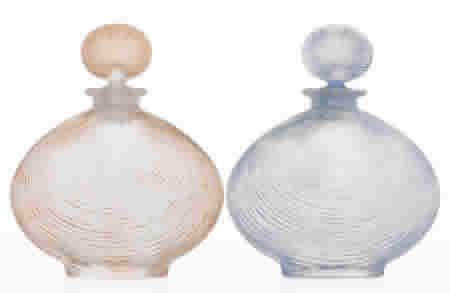 Mainly owing to corporate consolidations and additions, today Coty sales are measured in the billions of dollars annually and it is a "global leader in beauty". 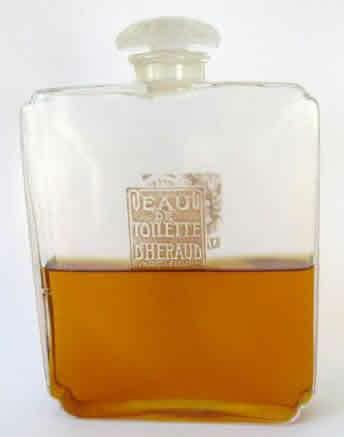 D'Héraud was started in the period around 1913 by Delphin Héraud, who formerly worked for the 100+ years old perfume company Lenthéric. 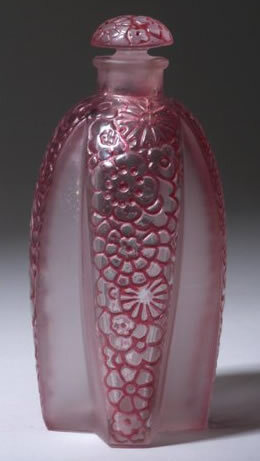 The first bottle created by Lalique for him was Le Lilas in 1913. 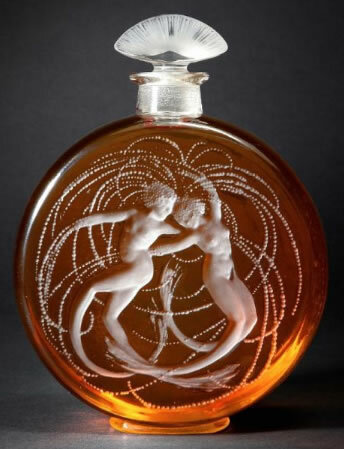 In the ensuing 10 years, Héraud would use around 18 bottles designed by Rene Lalique, not including variations such as the couple later tweaks for the wonderful butterfly woman design Phalène which was originally created within a year or so of Le Lilas. 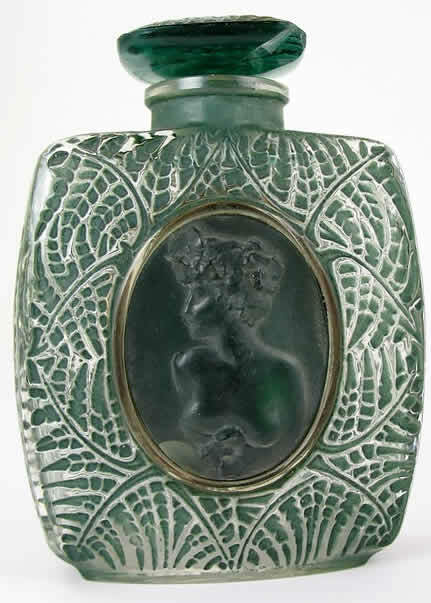 After a 3rd bottle in 1914, there was a six year break, and then an outpouring of new designs were created in the period 1920 to 1923 after Héraud incorporated his company under the name Parfums D'Héraud. 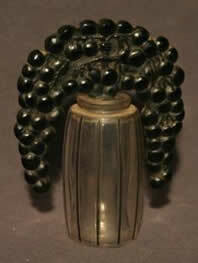 His headquarters and plant were located about 5 miles from the center of Paris in Courbevoie. 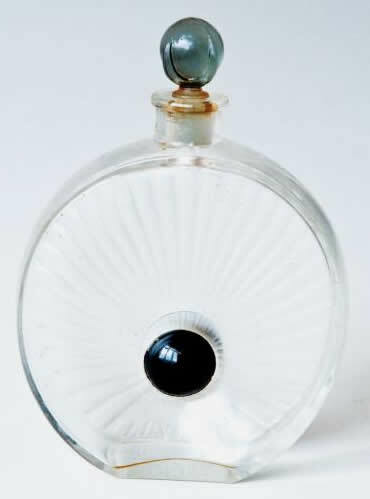 The last bottles made for D'Héraud were 2 bottles created in 1926 just before the demise of Parfums D'Héraud that same year. 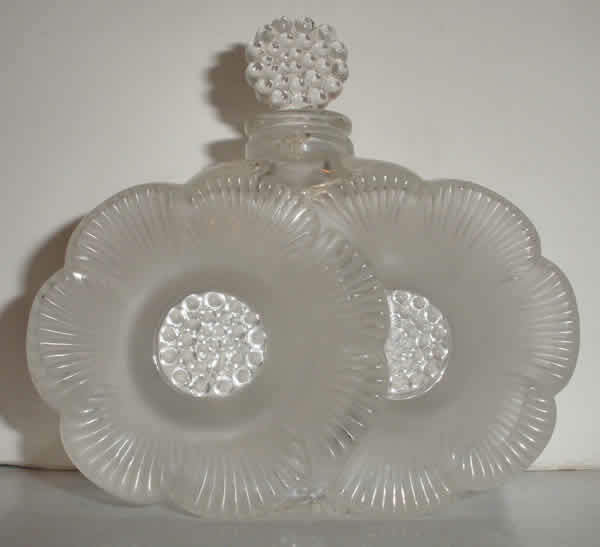 One of those bottles was surely based on the 1925 draped (bunting style) garlands of pearls design of the Maison Lalique Perles Vase. 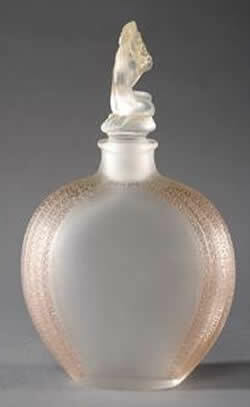 This same bottle was then marketed directly by Maison Lalique with the model named Palerme. 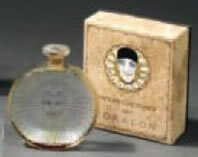 Parfums D'Orsay was founded in 1908 in Paris by a small group of 4 well capitalized and experienced participants. 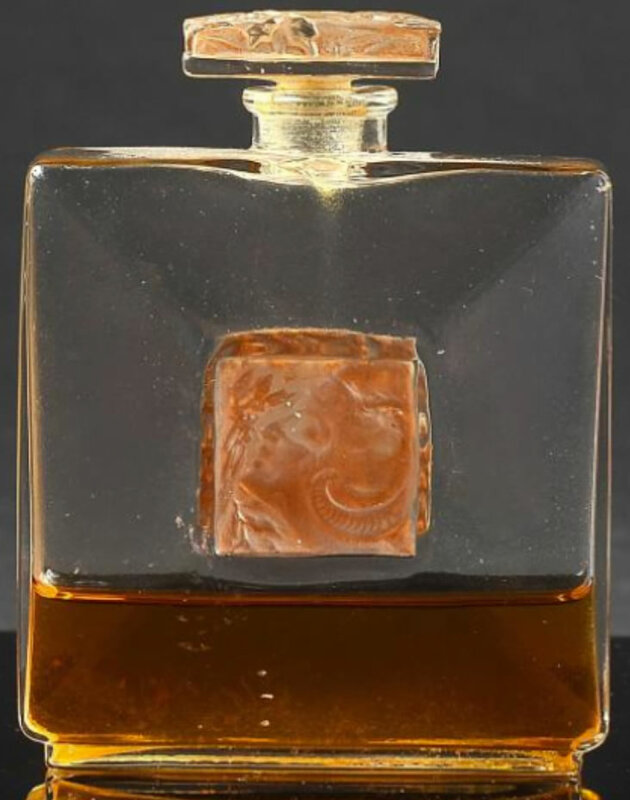 They purchased the name and likeness of the somewhat infamous Count D'Orsay who had died in 1852 to legitimize and market their new perfume creations. 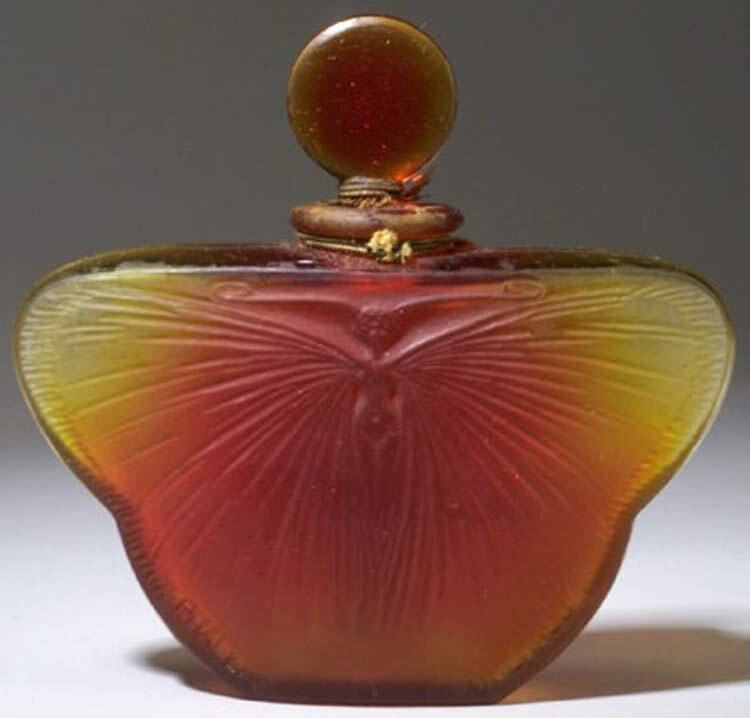 The company became one of the first five perfumer clients of Rene Lalique and he eventually created over 2 dozen different flacons for various D'Orsay fragrances in the period from 1914 to 1929. 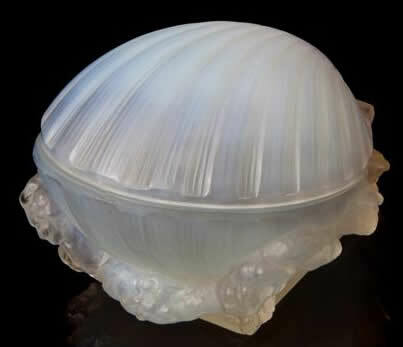 Delettrez was founded 25 years before Rene Lalique was born. 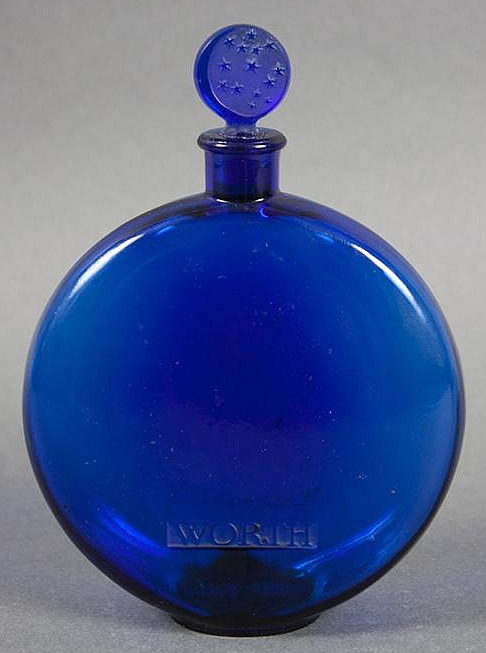 The company slogan was: La Parfumerie du Monde Elégant. 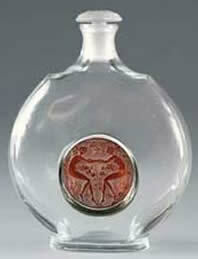 Roughly in English it's: Perfumer to the Elegant World (High Society). 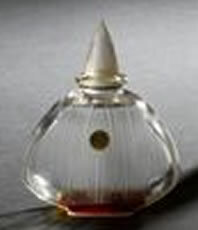 As a perfumer they were known and well regarded worldwide. 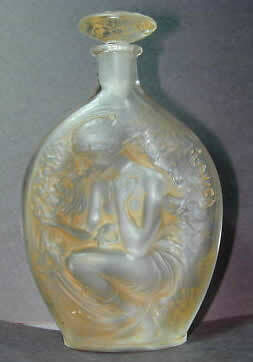 But it was not until after Delettrez was acquired in 1927 by an American company that it utilized a Rene Lalique bottle. 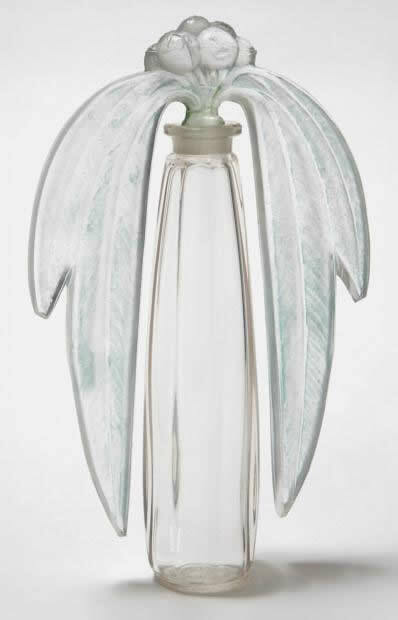 In 1930 Lalique sold them the Inalda bottle with the blown out tiered edges highlighted by enamel that you see below. 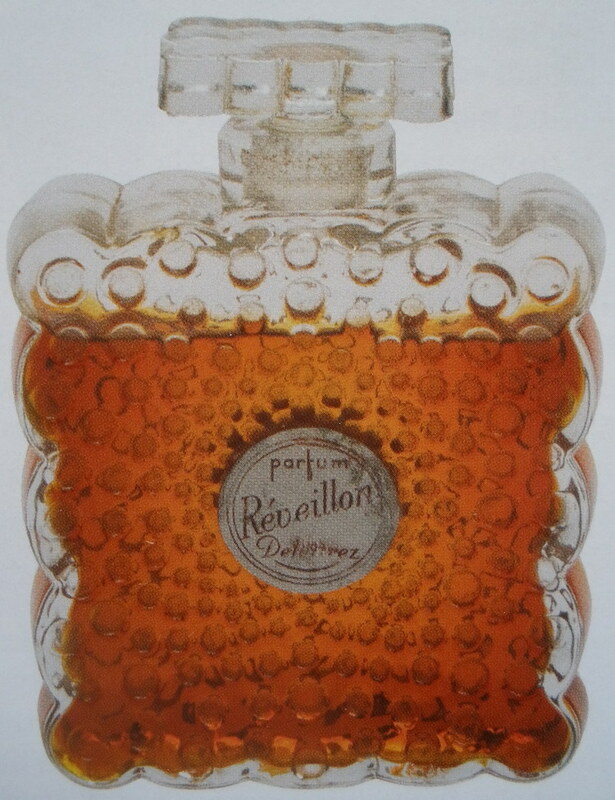 And it wasn't until 5 years later that he would create the 2nd and last bottle for Delettrez, the super modern Réveillon you see here that was also used for Inalda and possibly other Delettrez fragrances. 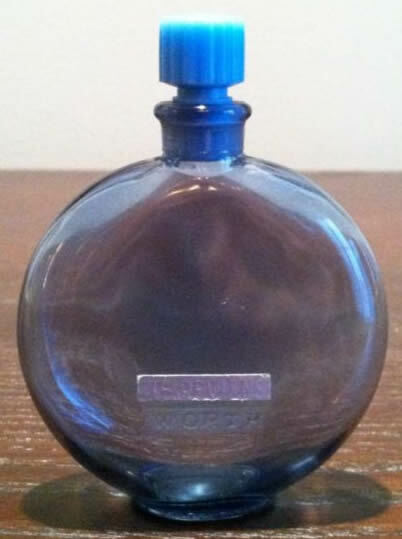 We have seen a 1935 Gimbels ad for their New York Department Store showing both of these bottles containing Inalda, the Réveillon for $7.50 and the Inalda for $25.00. 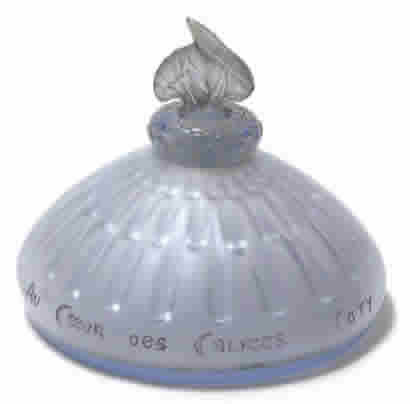 Of course the ad mentions "Flacons by Lalique". 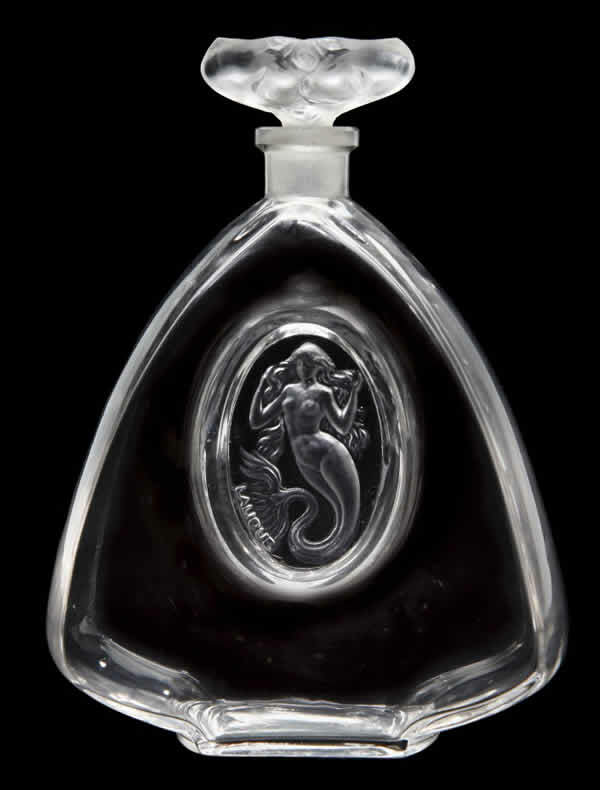 Delettrez continued to create new fragrances at least into the early 1940's and is reported to have stopped doing business about 1955. 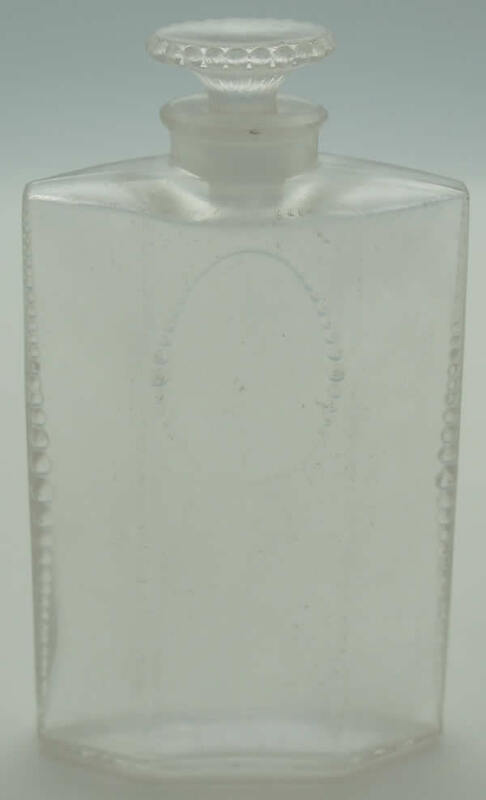 Erasmic was founded around 1890 by J. Crossfield and Sons Ltd, a highly successful British maker of soaps, candles, household cleaning products, and chemicals that had been in the soap business since around 1815. 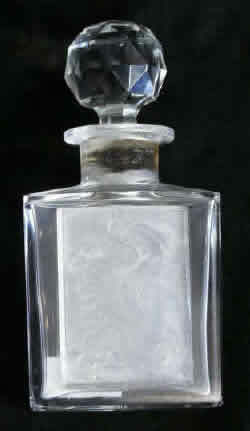 Erasmic was created to facilitate Crossfield's entry into the market for personal goods such as toiletries, powders, and perfumes as a luxury brand. 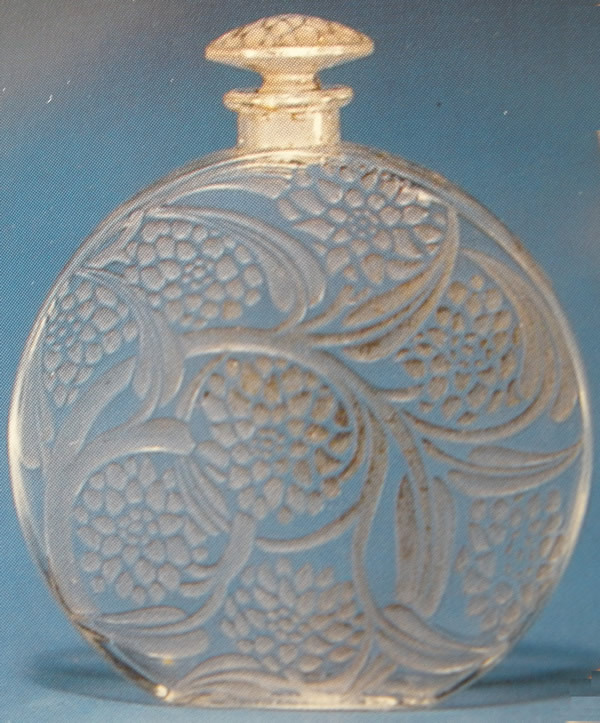 They had showrooms in London, Paris, and Brussels. 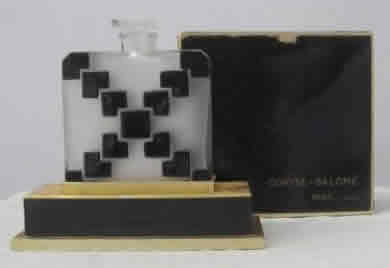 They even created their own box making facility, sawmill, and what today would be called the graphics department to make and print their own designs for their presentations. 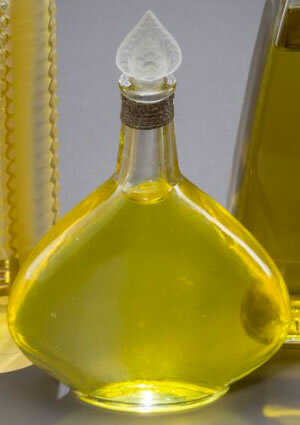 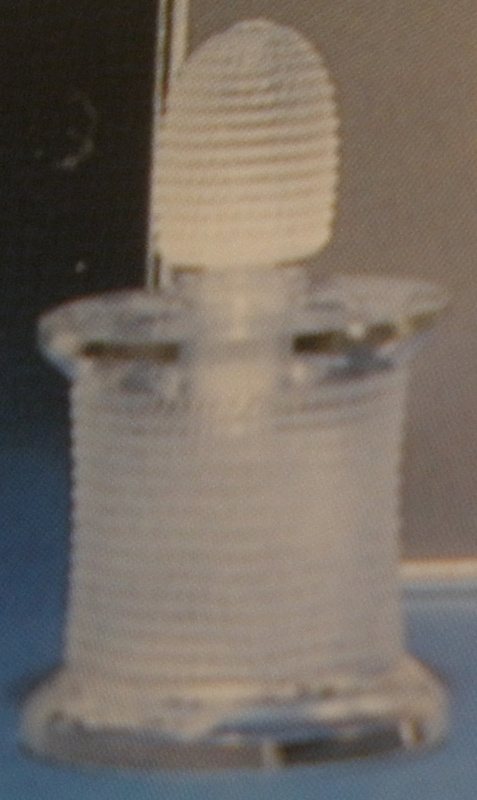 They used bottles made by Dépinoix, Daillet, and possibly others. 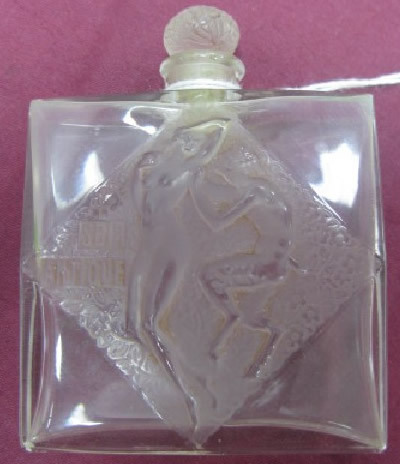 It was not until 1925 that they turned to Rene Lalique to create just the one bottle, with the Egyptian dancer encircled by the 2 facing butterflies design that you see here, for their new scent De Lui ( From Him). 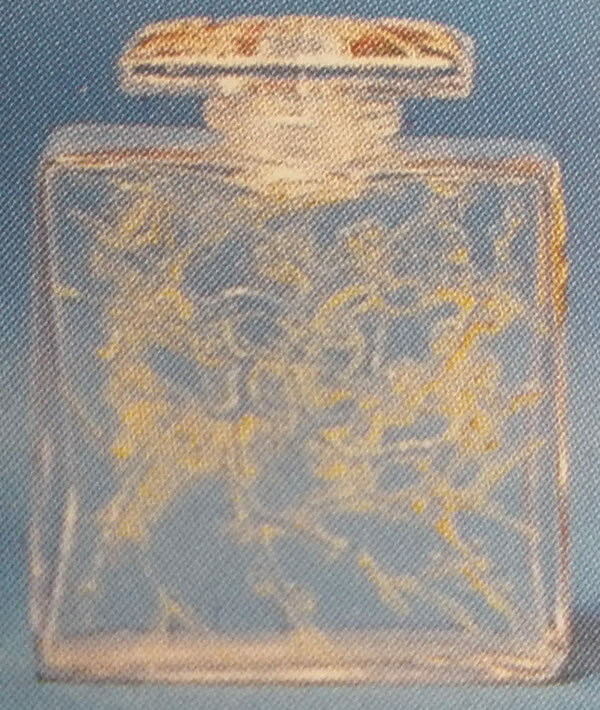 This fragrance with this bottle was also reported to have been marketed under the names Parfum di Lui and Danseuse et Phalenes. 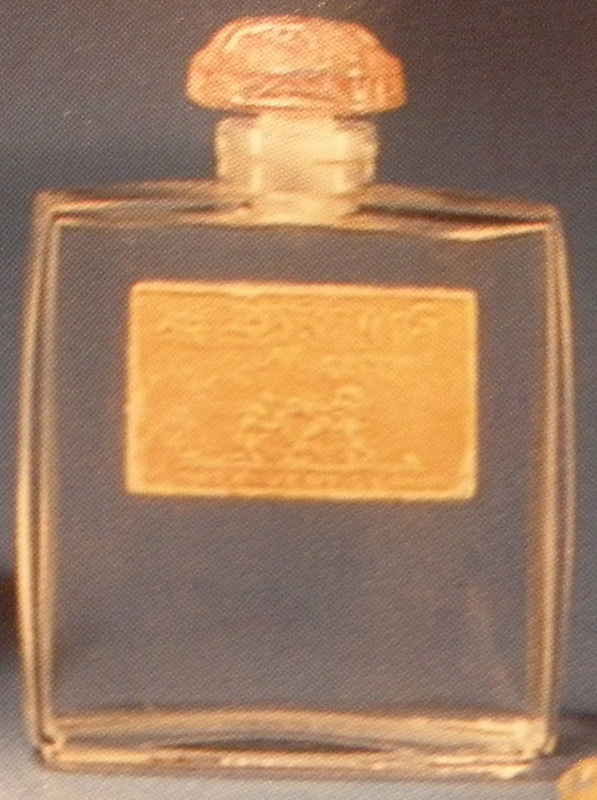 A. Euzière was founded in Grasse France in 1920. 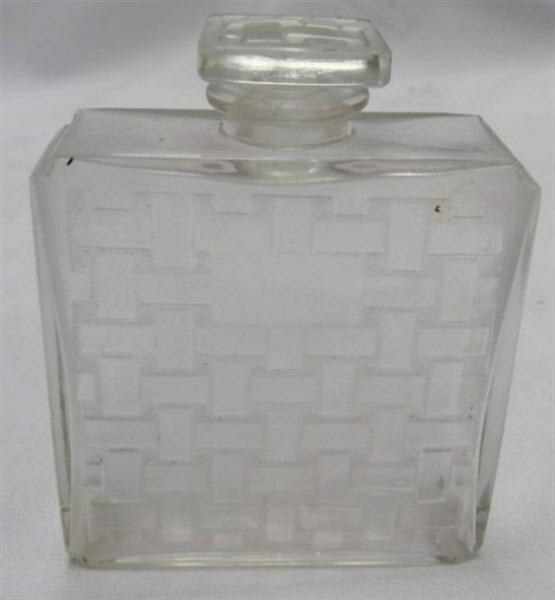 They sold over 15 fragrances between 1920 and 1925. 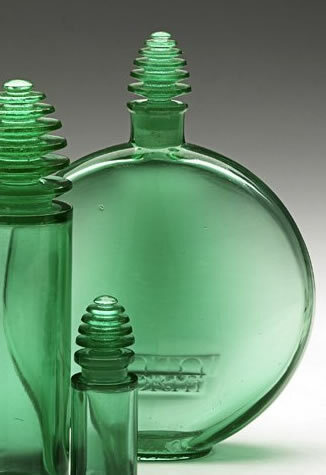 They used bottles designed from different sources including Julien Viard and George Dumoulin. 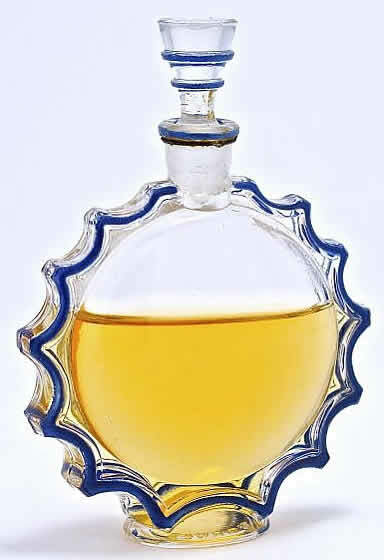 Euzière may be the successor company to a string of previous perfumers that began in 1887 but that is unclear (at least to us). 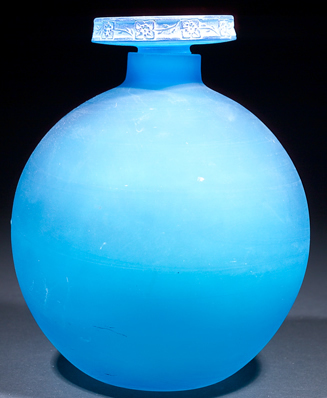 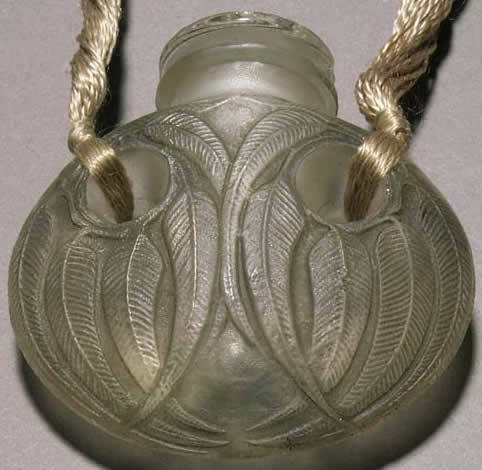 What we do know is that Lalique did not design any bottle for Euzière. 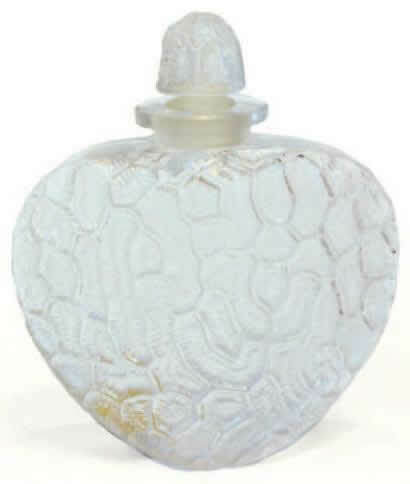 The one R. Lalique bottle they used that you see here was almost certainly left-over and in-stock from the late 1920's / early 1930'a financial issues. 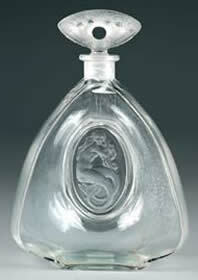 In any event it's the same as the Persana bottle for Roger & Gallet. 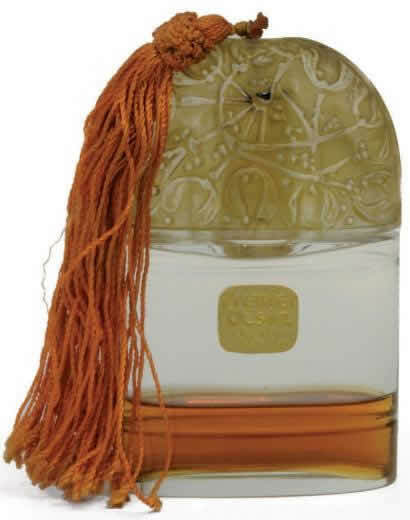 Fioret was founded in 1919 by Simon Jaroslawski as Les Parfums Des Jardins De Fioret. 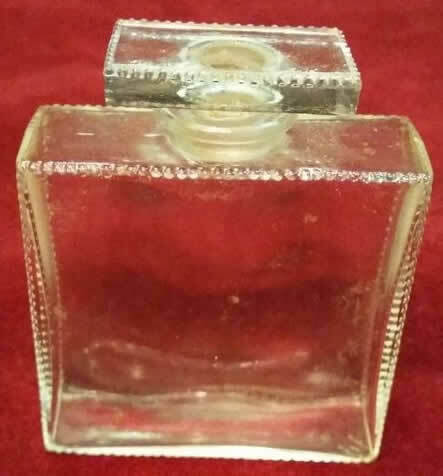 No later than 1924 they had a boutique in New York City at 677 Fifth Avenue in the 2nd floor of the Cammeyer Building and had created over 20 different fragrances. 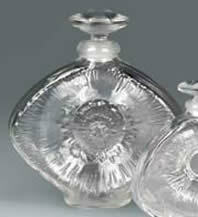 Fioret purchased bottles from Baccarat and Cristalleries de Nancy and maybe others. 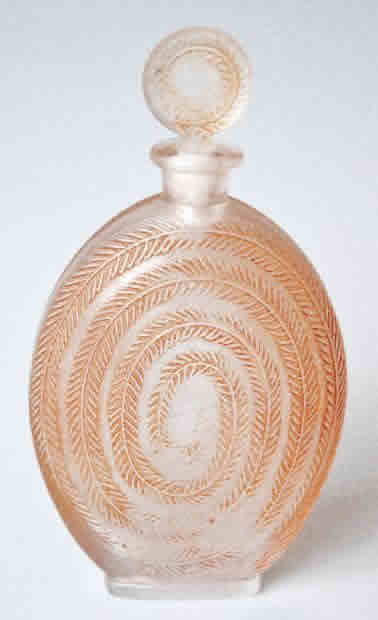 In 1924 Rene Lalique created his only bottle for Fioret for their fragrance Chose Promise seen here. 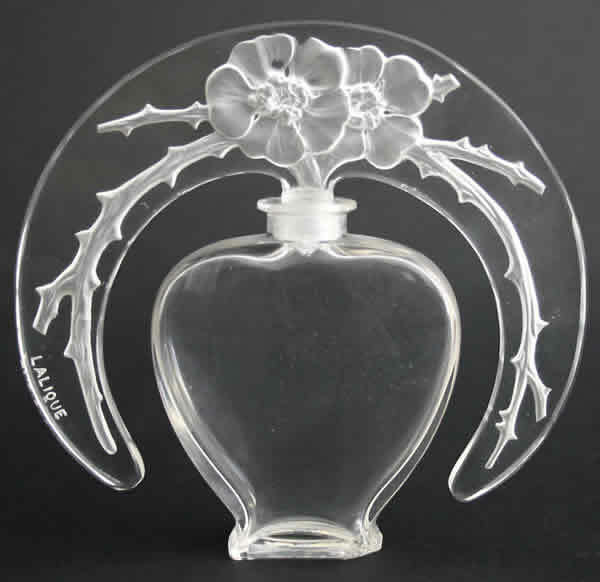 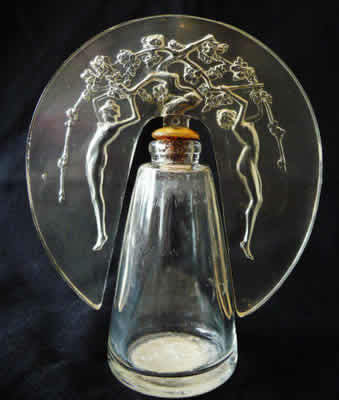 Fioret also commissioned Lalique to make a small glass medallion as an outside the box hang-tag for Chose Promise Perfume Presentations, but it was used in the presentation for the fragrance with Baccarat Bottles and did not accompany the presentation for the Lalique bottles. 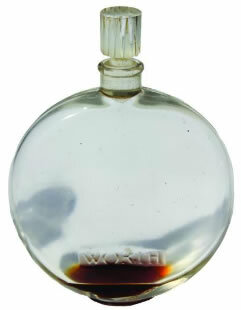 That ubiquitous hang-tag is seen today re-purposed as a pendant and many other items. 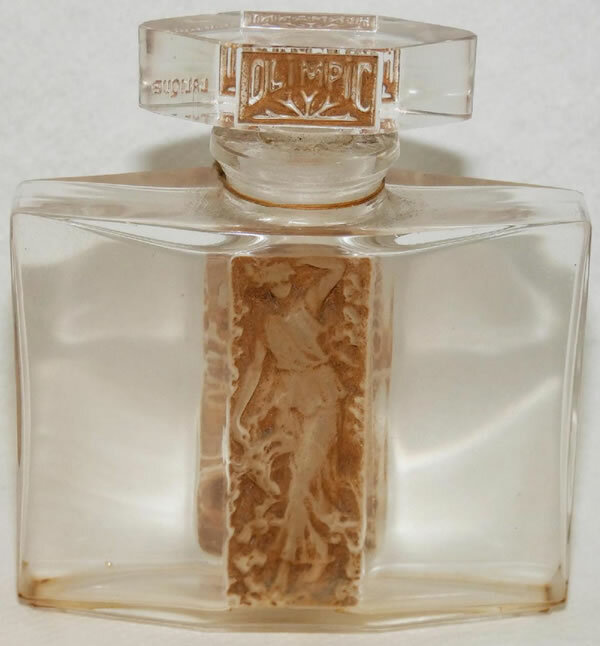 Jaroslawski also founded the perfume and fashion house Ybry in 1925 that was in business until at least the early 1960's based on some newspaper ads we have seen, though under whose ownership we don't know because Jaroslawski filed for personal bankruptcy in 1932 following the crash. 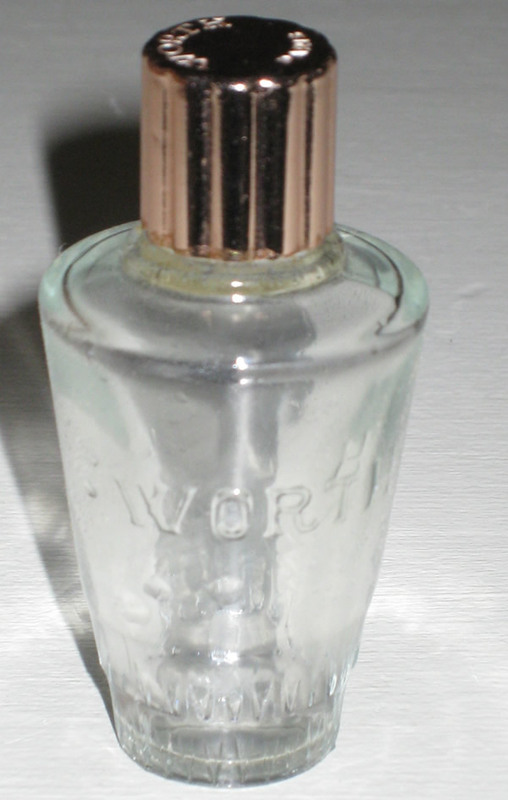 Fioret continued in business until at least the 1940's. 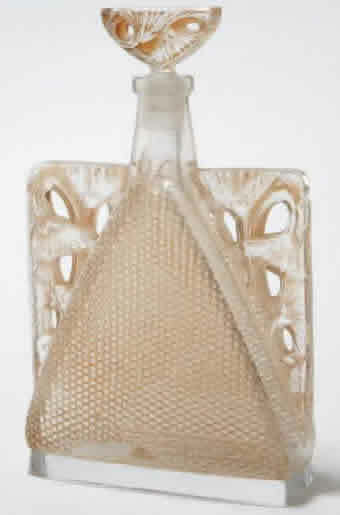 Forvil was founded in 1922 by Leon Fink. 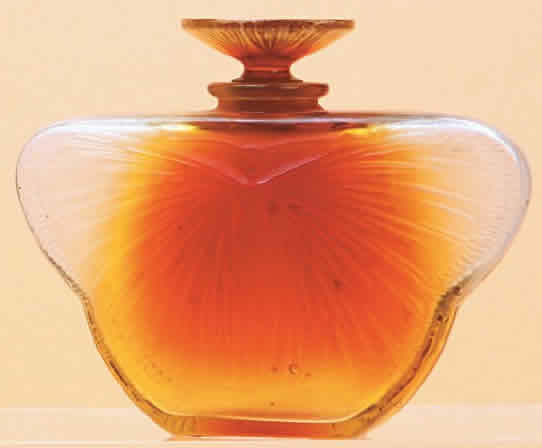 He had previously been one of the founders of Parfums D'Orsay back in 1908. 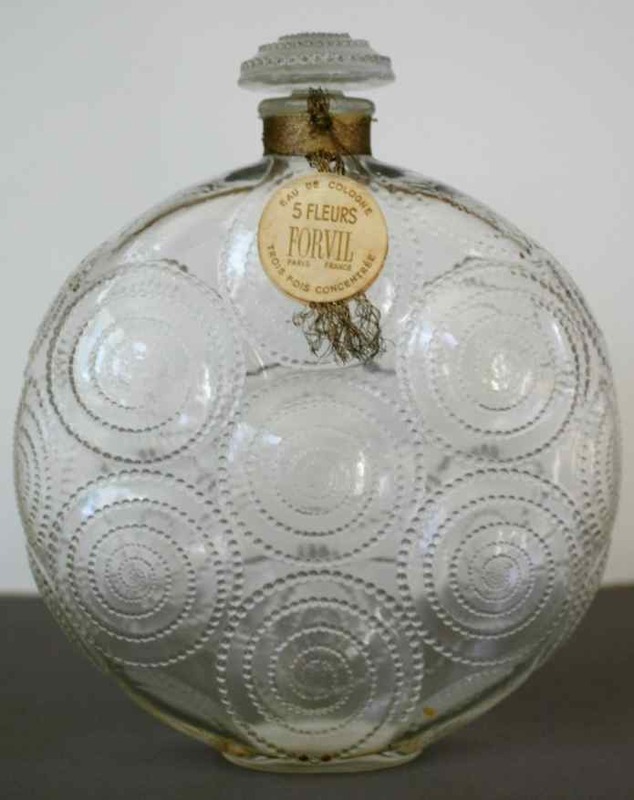 The original name he chose was Forval, but it was changed after the first year. 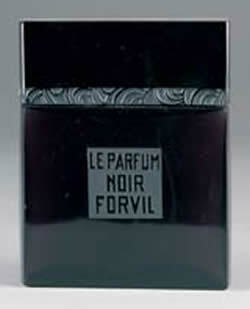 In 1924 at the corner of Rue De Castiglione and Rue De Rivoli in Paris, Fink opened the Parfums Forvil store. 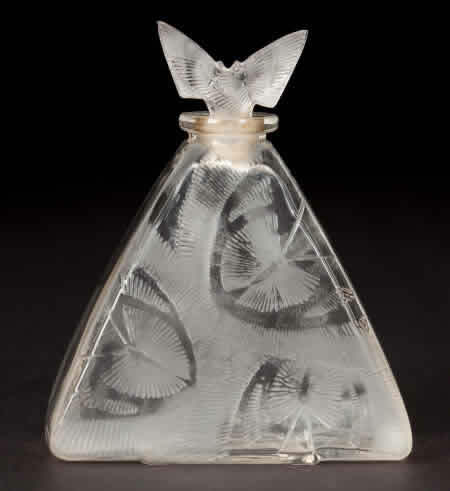 He became a consistent customer of Rene Lalique not just for bottles, but for the design of the overall presentation. 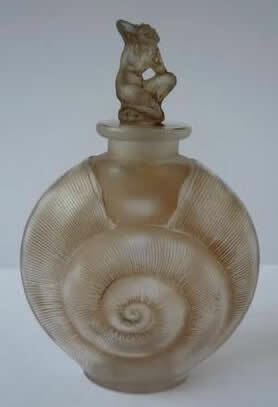 His business with Lalique continued and grew throughout the roaring 20's, but dropped off the cliff after 1929. 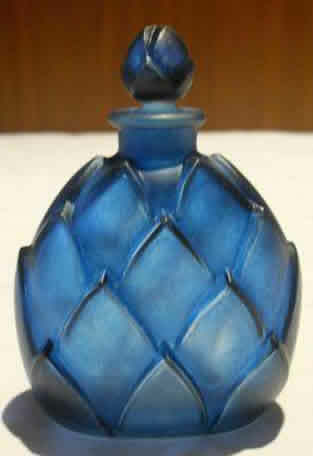 Forvil came under the ownership of Bristol-Meyers in the 1960's and was closed by them in 1969. 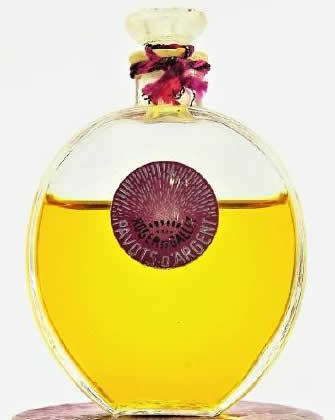 Perfumerie Fragronard, named after the famous 18th century French Grasse painter, was started in 1926 by Eugène Fuchs when he moved from Paris to Grasse and bought a small perfumery there. 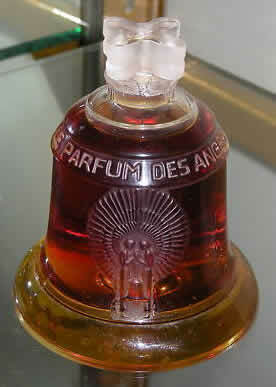 His first boutique in Paris was opened in 1936 on the Rue Scribe. 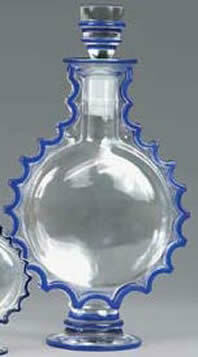 Today the company is run by Fuchs' great-granddaughters and has multiple shops in Paris and Provence. 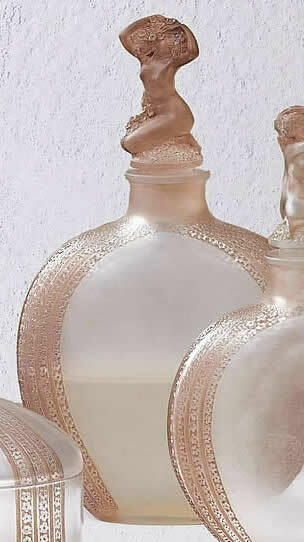 In total the company has created around 100 fragrances. 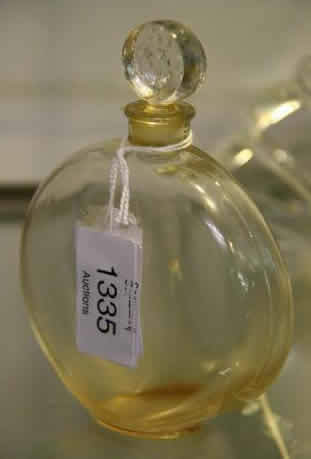 The perfumery and a company created museum in Grasse are both open for tours to the general public. 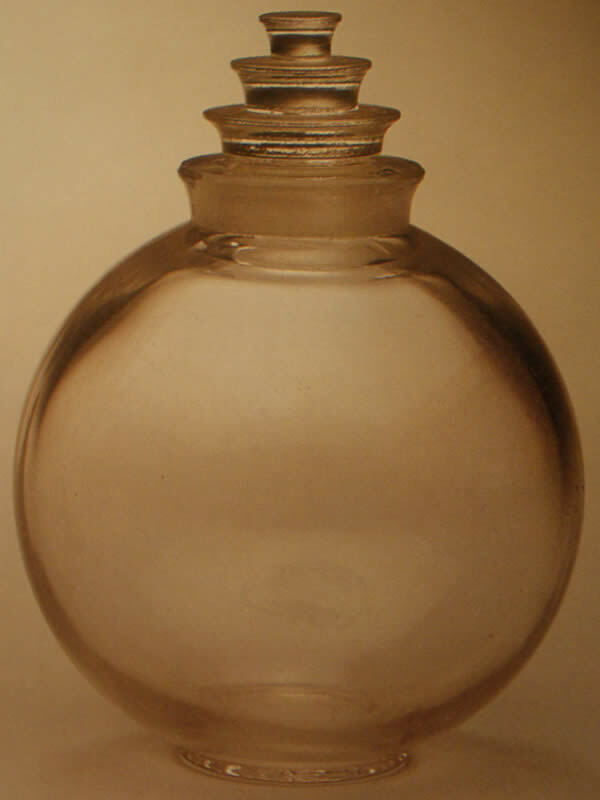 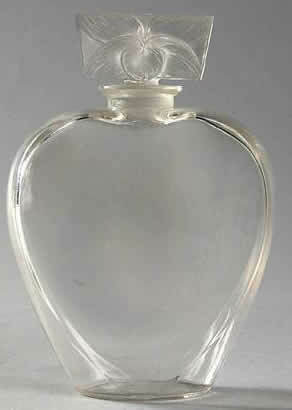 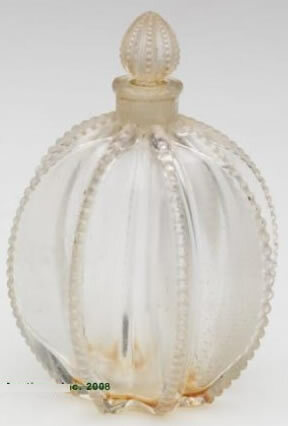 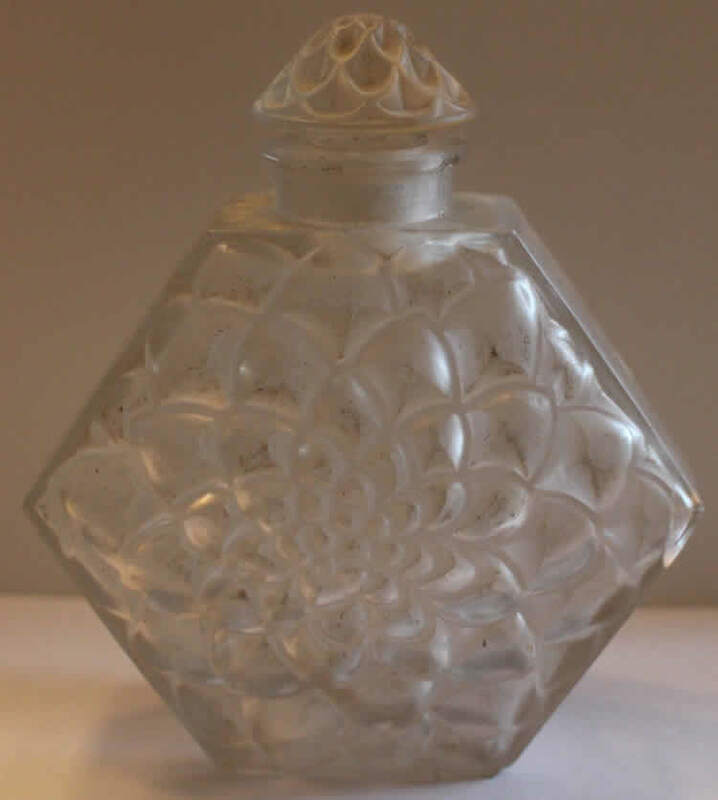 There is only one model bottle known to have been sold by Lalique to Fragronard. 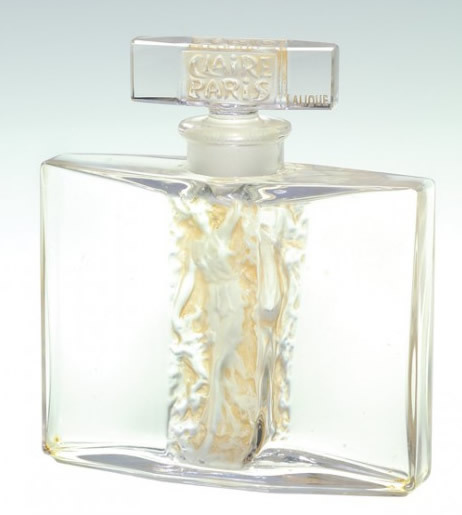 As one of the first female perfumers, Syria born Madame Henriette Gabilla established the perfume and cosmetics house Les Parfumeries De Gabilla in Paris in 1910. 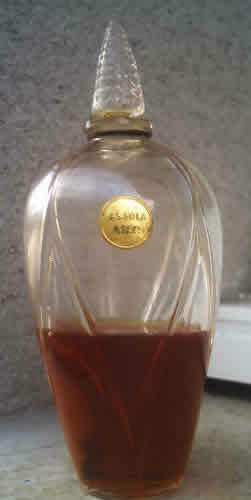 Inspired by Coty, Gabilla created and sold 86 unique perfumes worldwide over the course of 12 years. 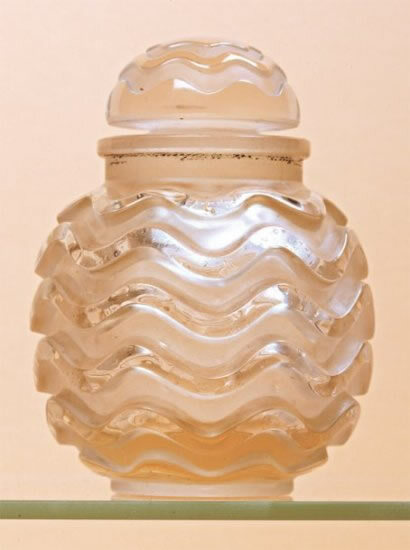 Having worked with Baccarat from early on, Gabilla turned to Rene Lalique in 1925 to create four different flacons for her fragrances. 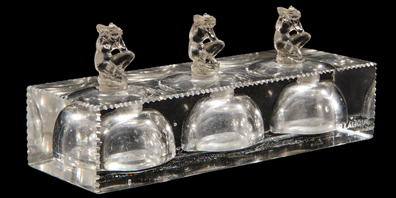 All four are shown here. 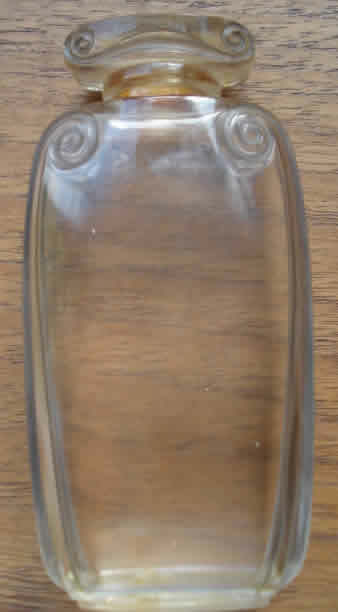 Gabilla shut its doors in 1969. 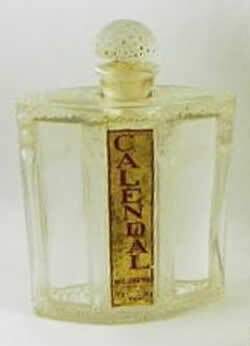 Perfumeria Gal was founded in 1898 in Madrid, Spain by Lesmes Sainz de Vicuna and the perfumist Salvador Echeandia Gal. 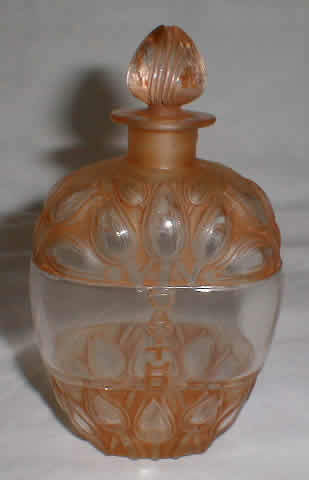 They made soaps, perfumes, and a scented vaseline product as a balm that is still sold in many varieties today. 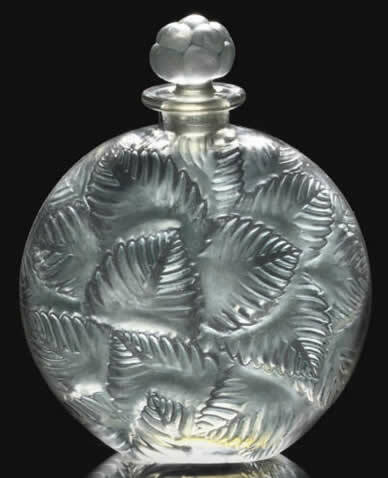 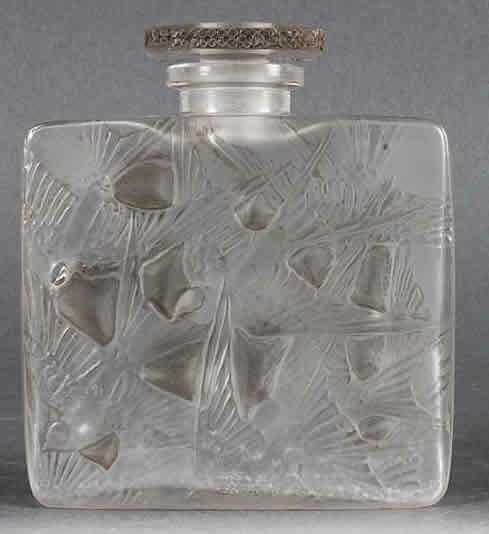 Gal ordered just one perfume bottle from Rene Lalique, the 1927 palm leaves motif bottle you see here. 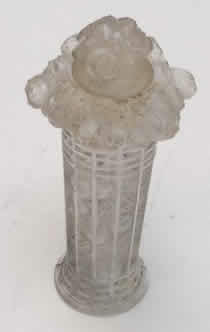 Les Galeries Lafayette was a department store. 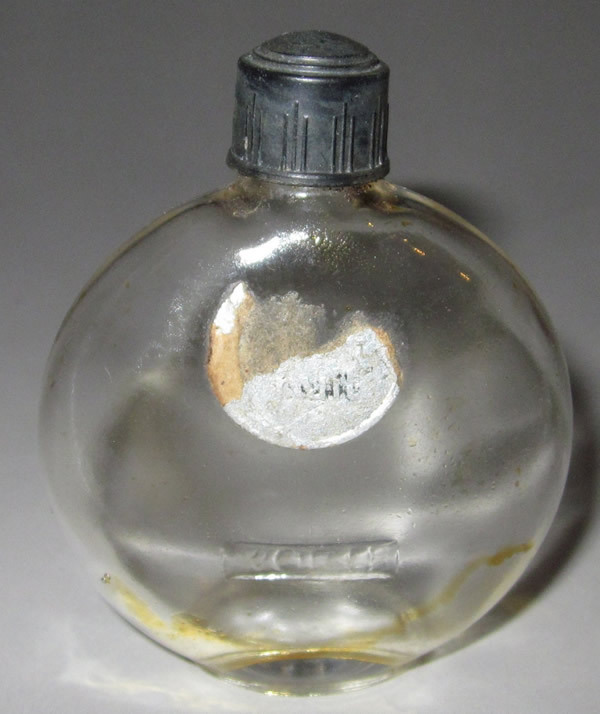 It was supplied by Coty and possibly Volnay with bottles labeled for the store. 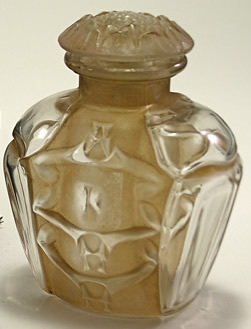 Many bottles that were supplied by Lalique for these private label arrangements by perfumers to stores were unsigned, likely so as not to have these bottles at the lower price points associated with him. 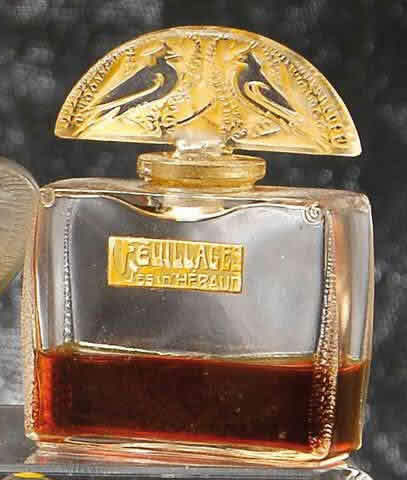 However the bottles for La Feuillaison and Chypre both have the original old long-tail L LALIQUE signature. 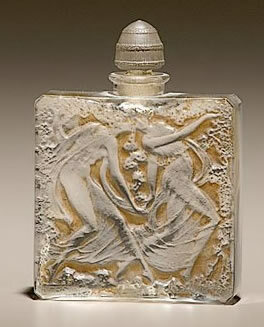 Georges Lemoine et Cie made perfumes, toiletries, and cosmetics. 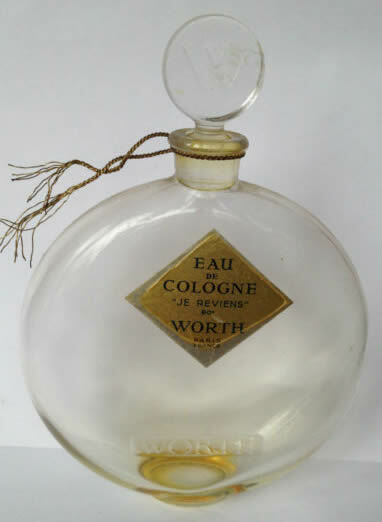 It was founded in the 1800's by Georges Lemoine as Parfumerie du Globe on Rue Saint-Lazar in Paris. 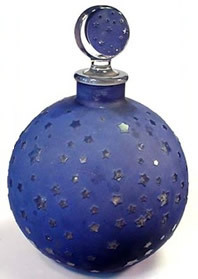 In 1925 a related company Pierre Lemoine et Cie (later just Pierre Lemoine) opened a branch at 294 Pearl Street in New York. 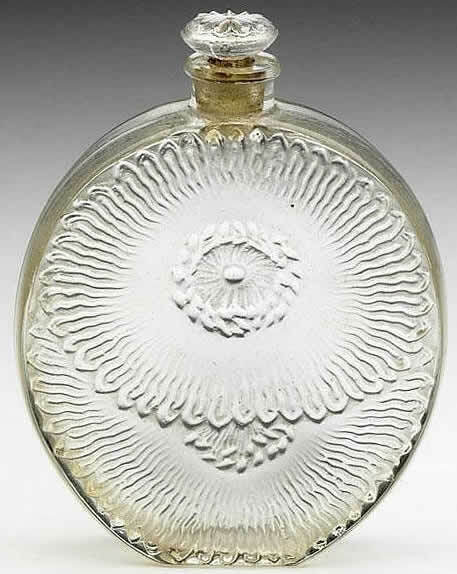 Lemoine used different glassmakers and designers for their bottles including Depinoix, Viard, and Saumount. 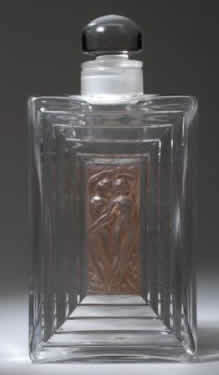 Of course they used Rene Lalique for at at least the one bottle shown here. 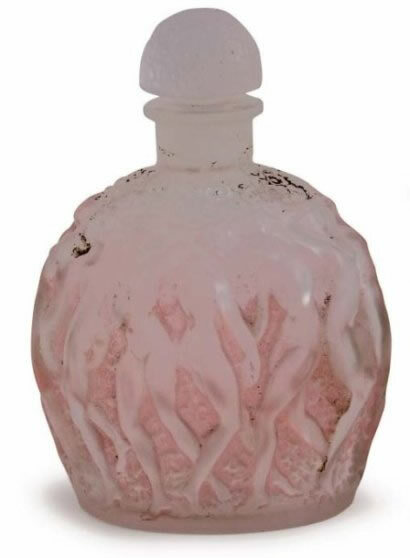 We've seen lists of near 20 different fragrances they created between 1895 and 1935, but the Jolyane fragrance is not on any of those lists and there is no record we can find of this obviously authentic bottle. 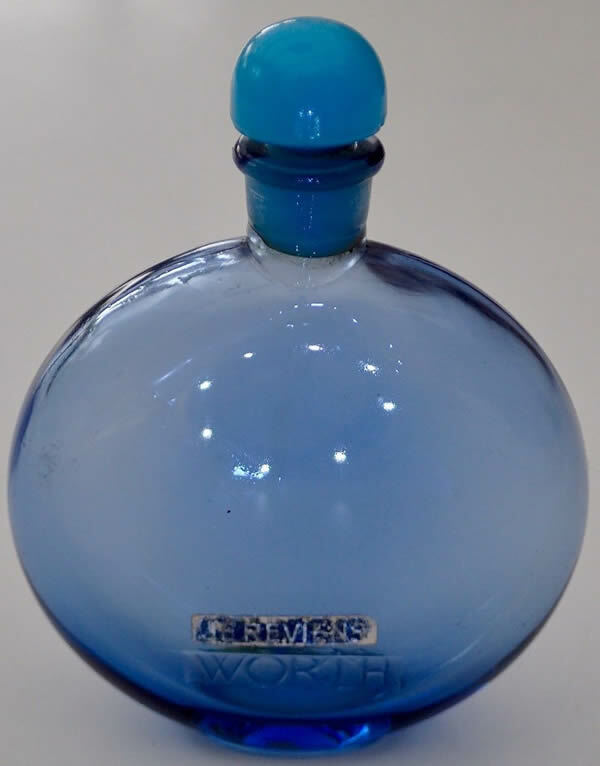 Lemoine merged with another company in 1939 and was later acquired by Lever Brothers in 1950. 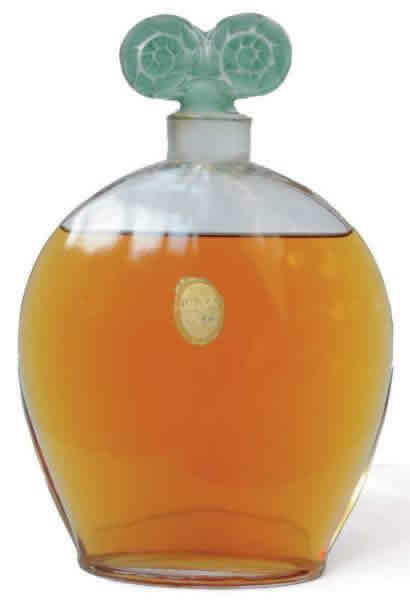 La Grande Maison de Blanc began as a Brussels department store in 1864. 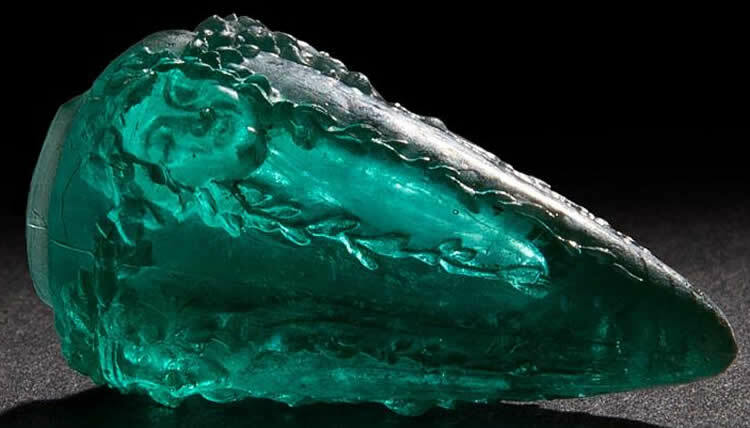 It was found by E. Lefebre. 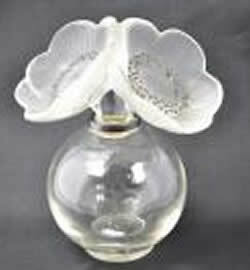 They sold all kinds of stuff including table linens, lingerie, clothing, hosiery, perfumes, flowers, gloves, etc. 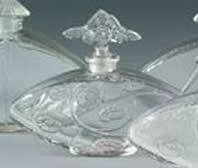 They were a supplier of "whites" as was so much of the table and bed linens and other items at that time. 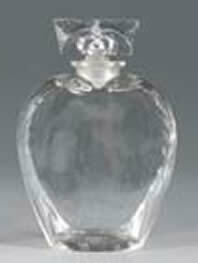 They had a branch in Paris on the Boulevard Des Capucines that offered many of the same things. 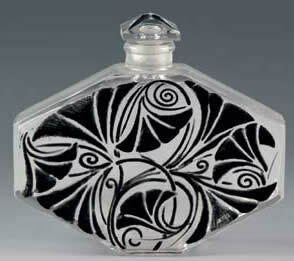 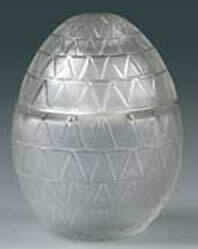 In 1927 they commissioned Rene Lalique to create the single geometric motif bottle you see here. 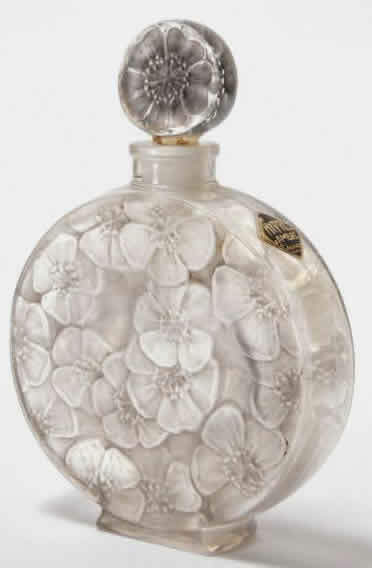 Guerlain was founded in 1828 and was run by family members until its sale in 1994. 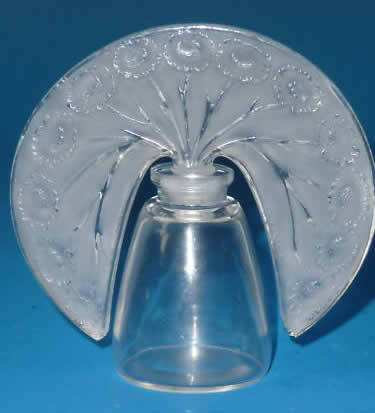 It is still in business today. 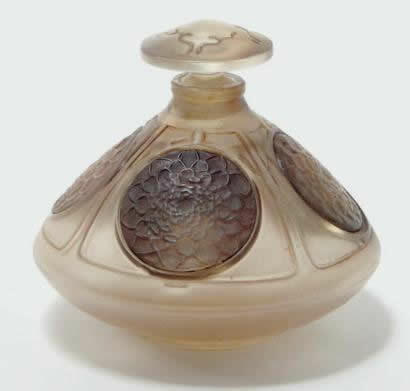 In 1925 Rene Lalique created a bottle for the fragrance Bouquet De Faunes that was developed by the 3rd generation Jacques Guerlain. 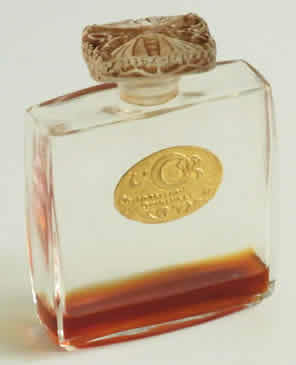 Jacques was a grandson of the founder and well known for creating many great scents including the fragrance Shalimar. 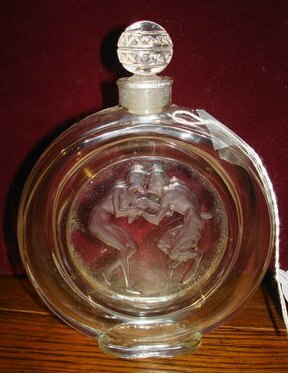 The bottle is a frosted glass Louis XVI style footed urn having 4 faun faces in relief spaced evenly around the shoulder of the bottle. 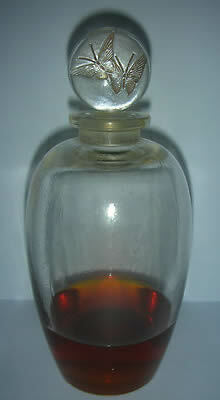 It's also known by the name Qaudrilobe. 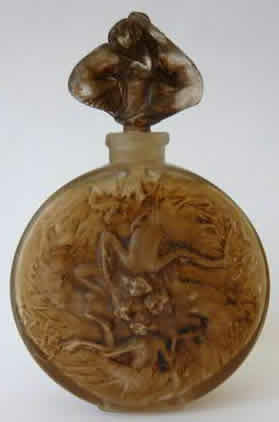 It's said that the faces of the fauns were modeled after the faces found at the entrance to the Guerlain shop on the Avenue Champs-Elysées in Paris. 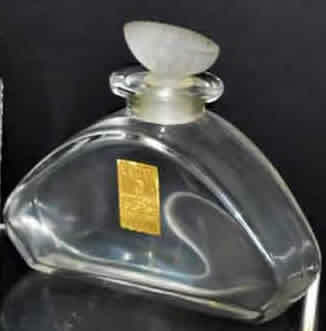 There is some evidence that a 2nd different bottle was designed for Guerlain around the time of the crash in the late 1929 - early 1930 period. 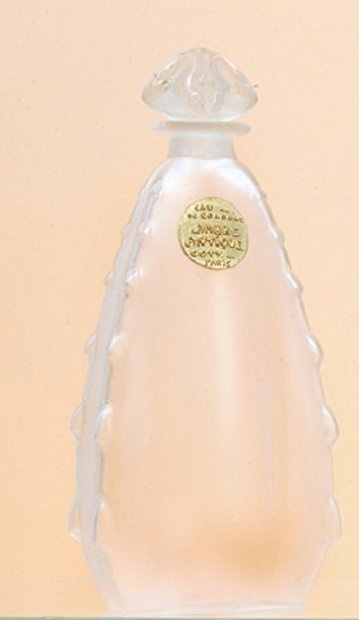 But that bottle has never been identified (at least not by us) and we don't know of any evidence that it was ever produced. 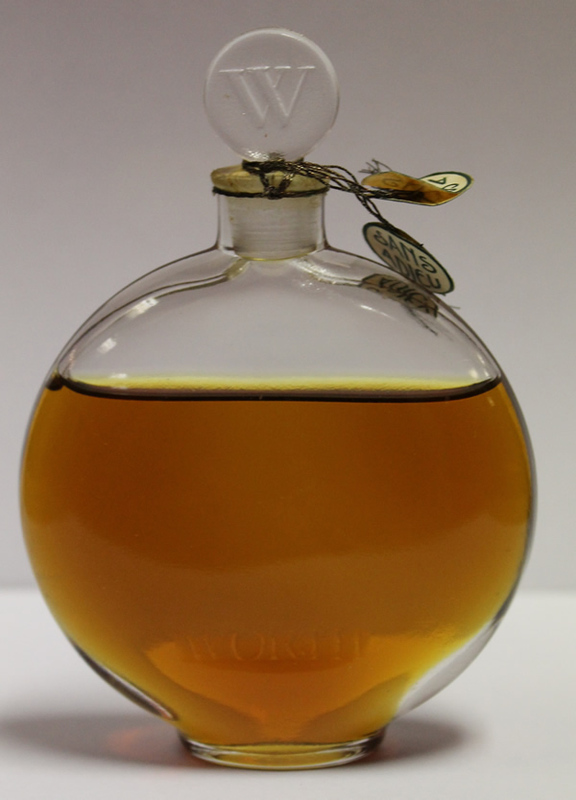 Houbigant has a long and storied history. 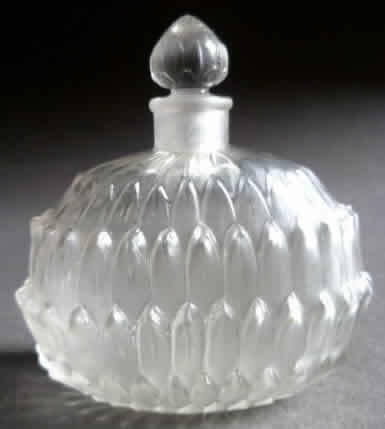 It was founded at the start of the last quarter of the 18th century. 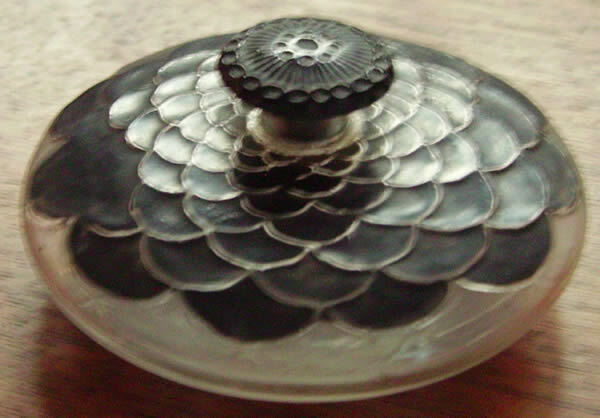 It was the perfumer to royalty long before the days of synthetic oils and mass production. 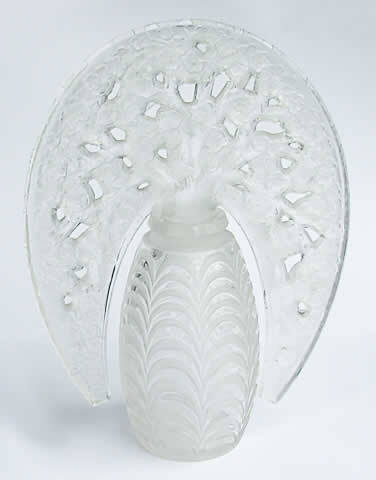 It was not until the first quarter of the 20th century that Rene Lalique received his first commission from them in 1920. 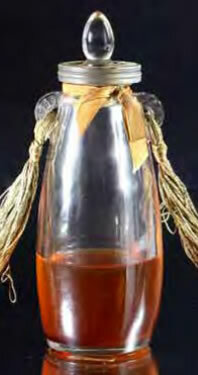 Their collaboration lasted half a dozen years and yielded only a couple of boxes and handful of bottles. 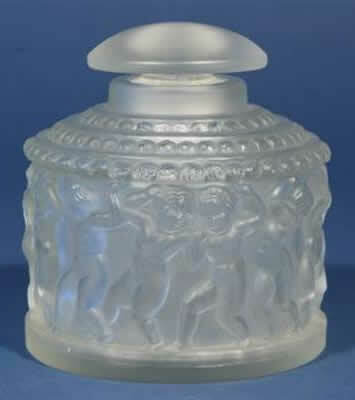 But the entire presentations for Quatre Flacons and La Belle Saison would mark highlights in both style and innovation for Lalique as he approached his coming triumphs at the Art Deco Exhibition in Paris in the year 1925. 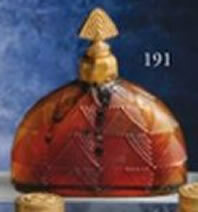 A year that would also mark the 150th anniversary of the founding of Houbigant. 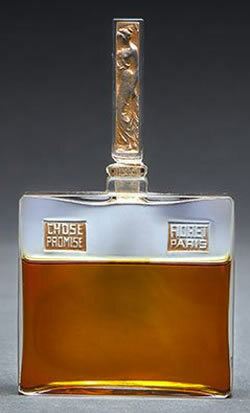 Isabey was formed as a partnership between the wealthy Baron Henri De Rothschild and the perfume creator (the "nose") Maurice Loewé in 1923. 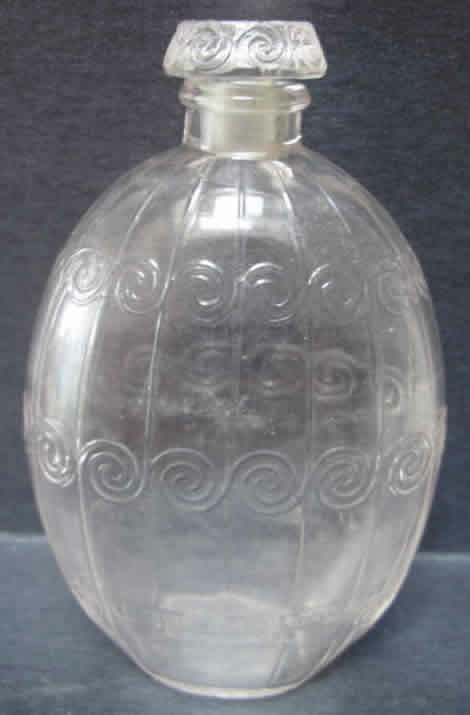 They opened stores in Paris, London, and New York. 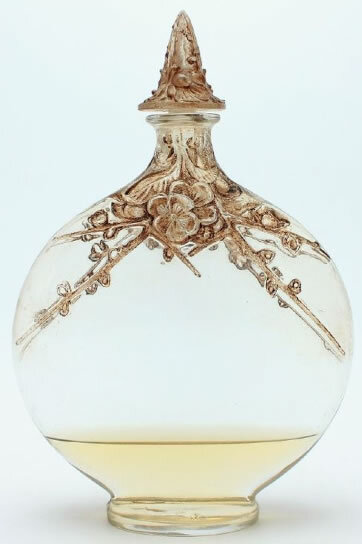 The actual name of the venture was Société Parisienne d'Essences Rares et de Parfums, but they used the trade name Isabey, thought to be inspired by the famous Isabey family painters Jean-Baptiste and Eugène Louis Gabriel. 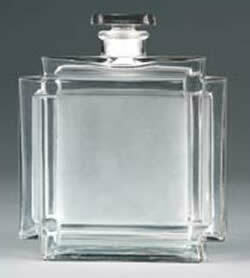 All the known bottles by Rene Lalique for Isabey are from the period 1923-1925. 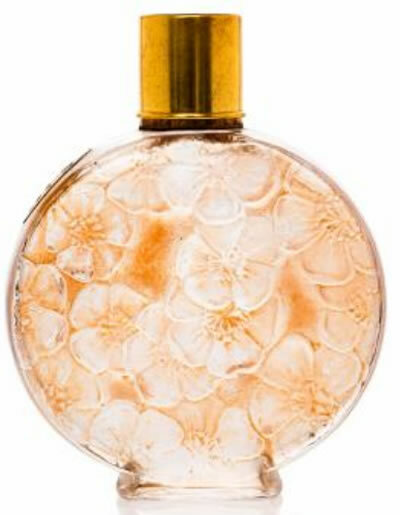 All told Isabey would create over 40 different fragrances in addition to various other toiletries such as lipsticks, powders, facial cleaners etc. 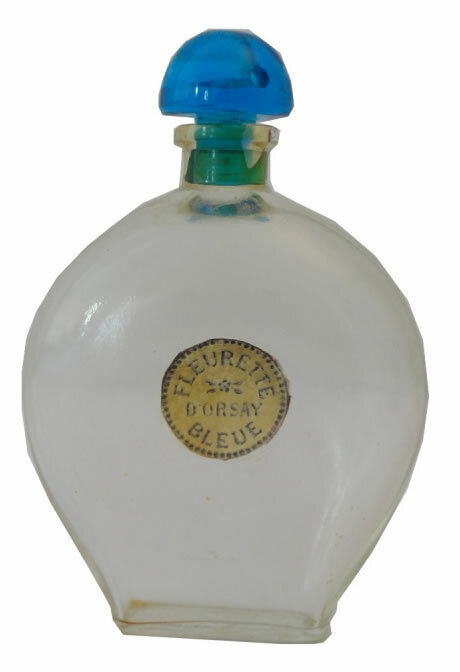 Marcel Guerlain (not the same Guerlain from the Bouquet De Faunes Perfume Bottle) is reported to have acquired Isabey or it's assets in 1941 and it appears (judging from the labeled bottle you see below) that he operated under his own name after that. 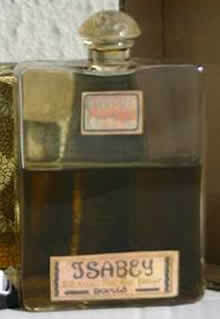 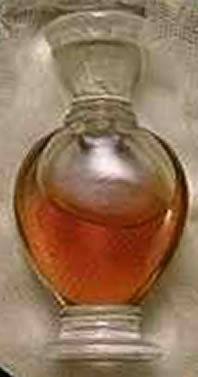 However the Isabey brand was resurrected in 2001 by the perfumer Panouge. 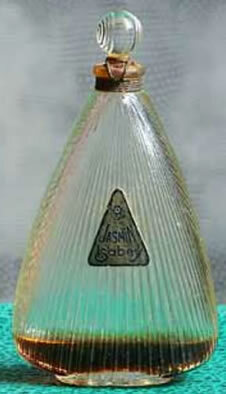 Jaytho was the brand name trademarked by Charles Jay Oppenheimer in the early 1920's. 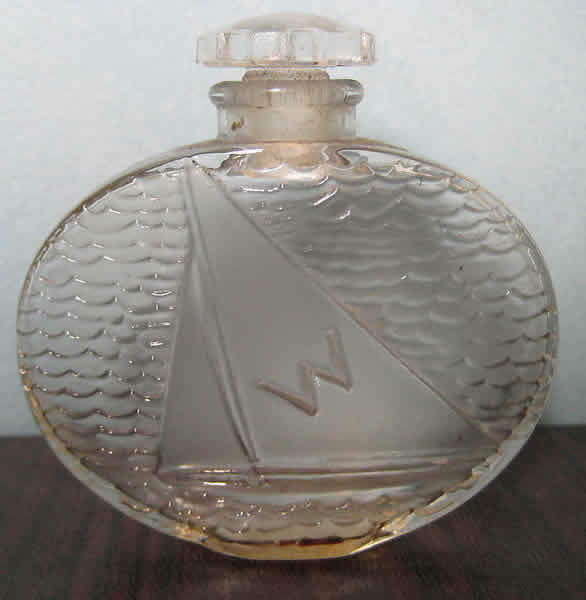 His perfumes were sold in his small specialty stores including in Newport Rhode Island and Palm Beach Florida. 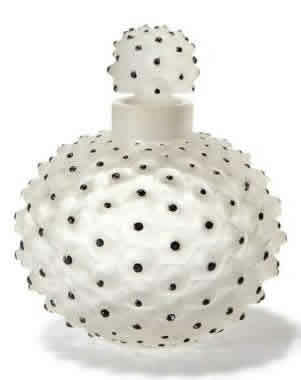 He also opened the Jay Thorpe department store in New York City at West 57th Street near Fifth Avenue. 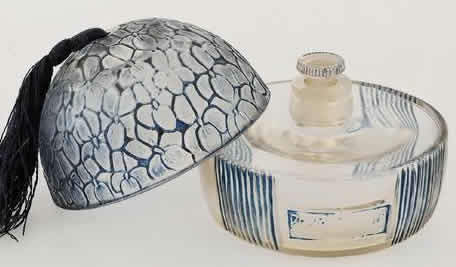 Lalique designed 6 items for the Jaytho Line but produced only 2 of those items. 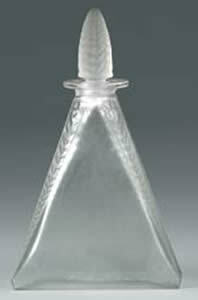 The only bottle both designed and produced is the tulip motif bottle Méchant Mais Charmant you see below. 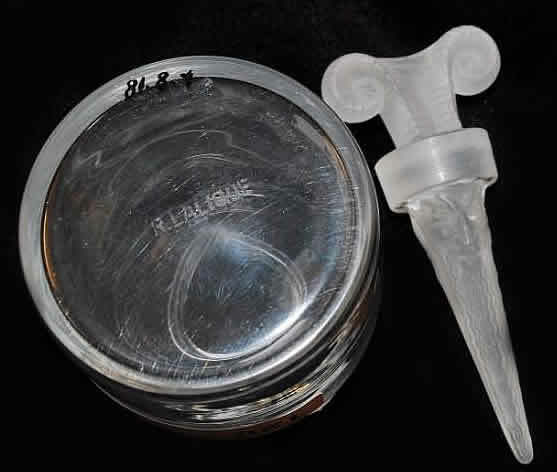 The rich tulip motif 5 compartment tester (the central compartment is for powder) was also designed and produced by Lalique. 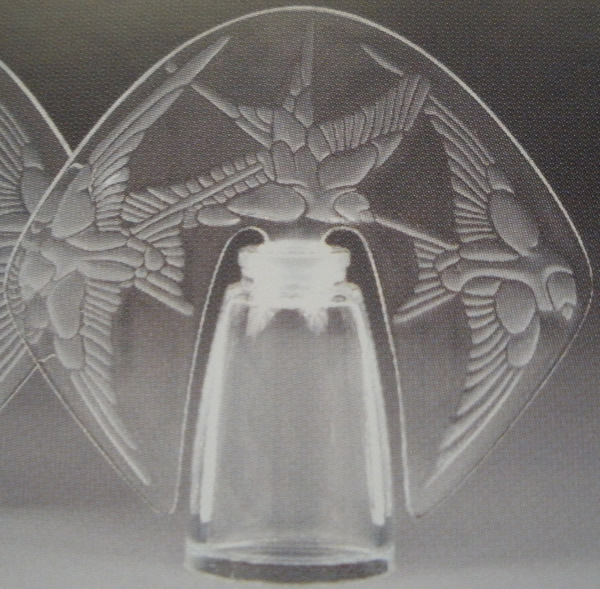 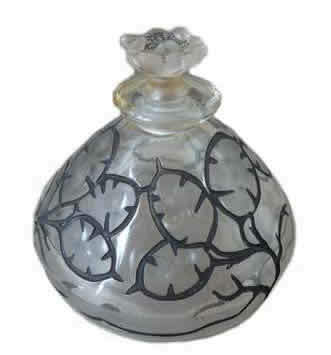 The remaining 2 bottles along with a tulip motif box and jar were designed by Lalique but produced elsewhere. 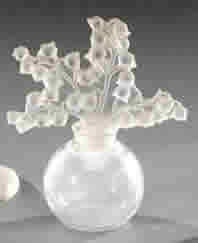 As would be expected those 4 produced elsewhere items are not signed for Lalique. 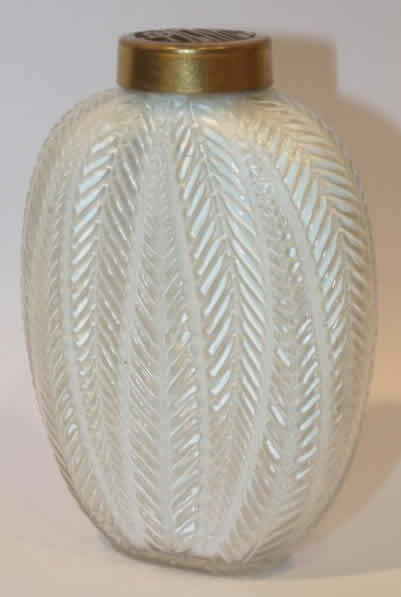 The Jay Thorpe store also sold R. Lalique glass as shown in this 1928 newspaper ad. 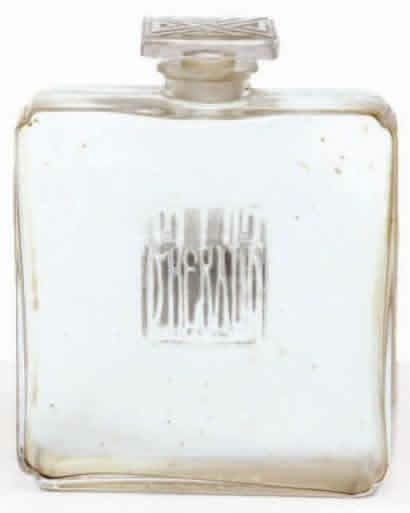 According to his New York Times obituary, Oppenheimer's company stayed in business until the 1960's and Oppenheimer himself lived until November of 1981, dying at the age of 91. 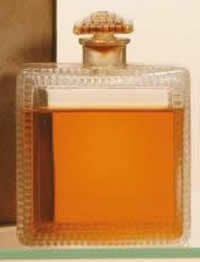 Lazlo Lengyel and his brother Georges began operations in Paris in the early 1920's under the name Les Parfums Lengyel. 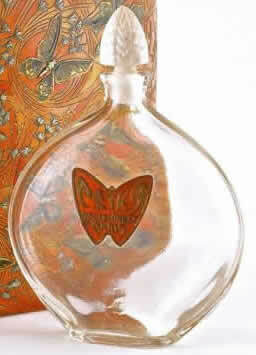 They had previous experience with perfumes in their birthplace Hungary. 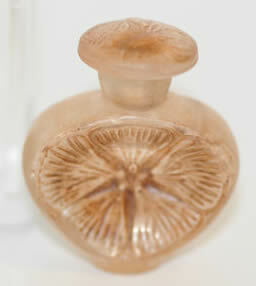 From 1917 to the late 1930's the they are reported to have created over 15 fragrances. 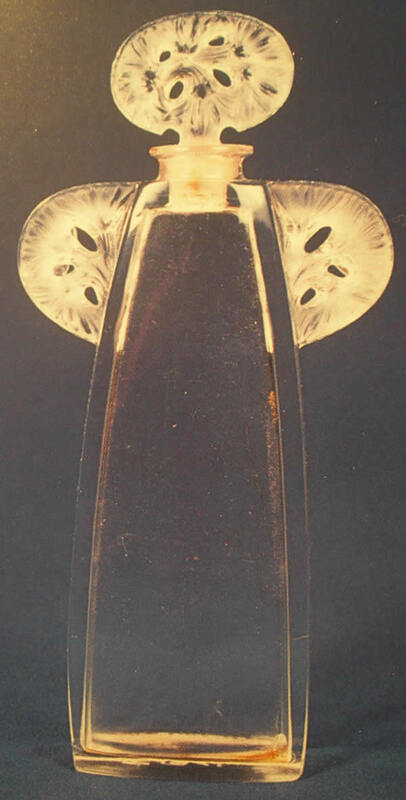 In 1936 the single bottle you see below was the first and only one created for Lengyel by Rene Lalique. 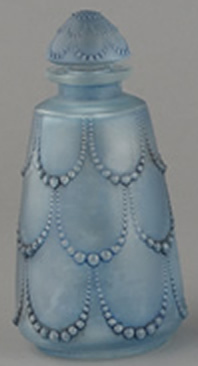 The bottle has several Russian themes including the coat of arms and the crown design stopper. 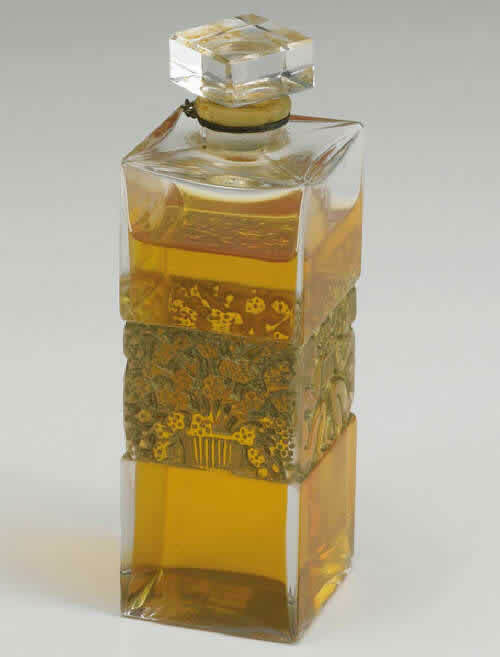 The fragrance Parfum Impérial was a derivative of their highly successful 1924 scent Essence Impériale Russe (Russian Imperial Essence), which helps explain the theme of the bottle. 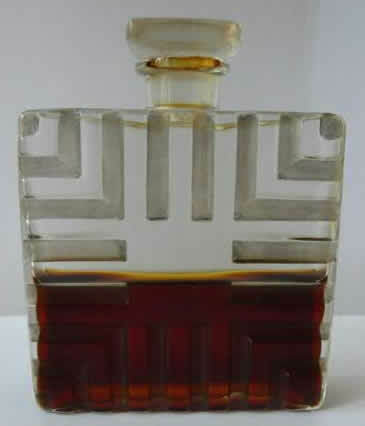 Lazlo was the nose for the company and is reported to have worked as a nose for Max Factor after the war. 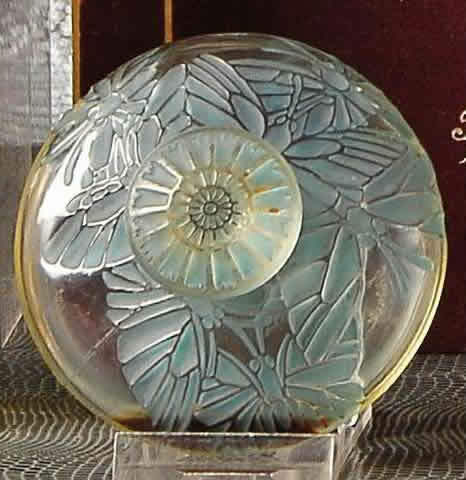 He died in 1986 just a few years short of his 100th birthday. 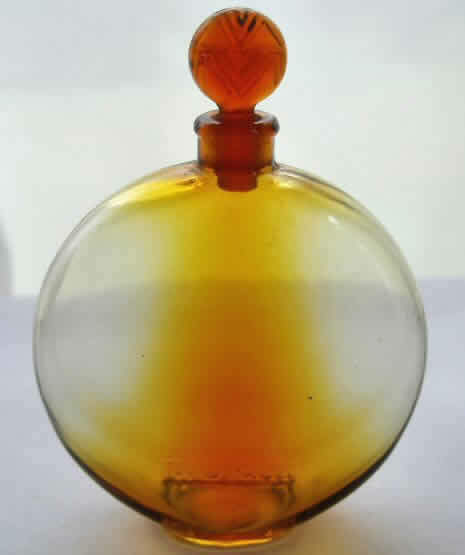 Mary Dunhill was born in 1907, the only daughter of Alfred Dunhill. 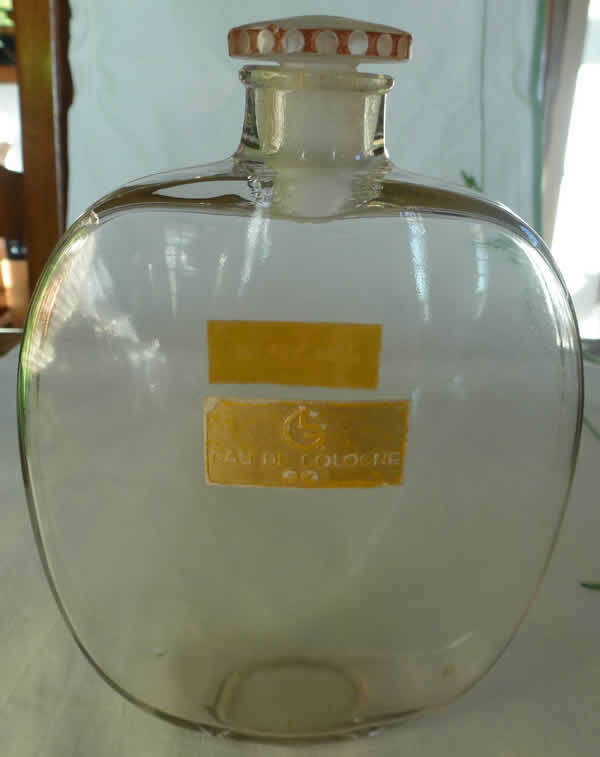 Alfred had inherited a small saddlery company from his father in the late 1800's and developed it into the luxury goods retailer Dunhill. 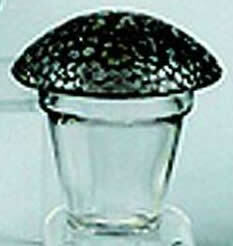 Then In 1907, he opened his first tobacco and pipe shop on Duke Street in London. 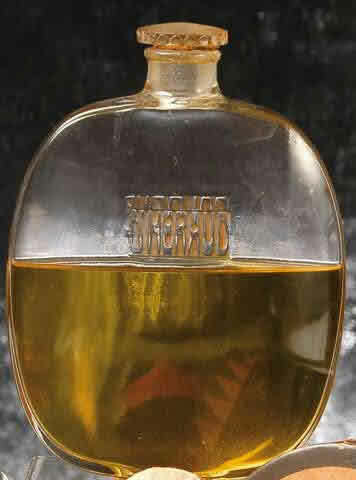 The tobacco business flourished and it is now a separate international company, having been spun off and sold in the late 1960's. 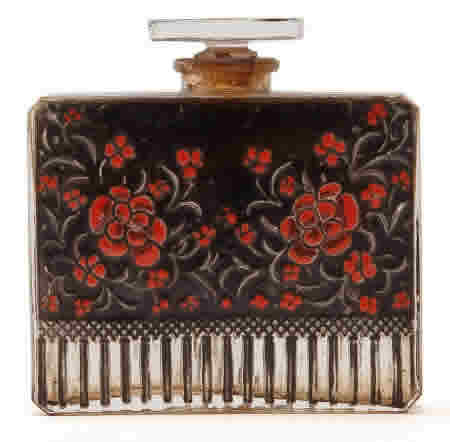 Mary was trained as a hairdresser, but ended up working in the family business and eventually became Managing Director and President of Dunhill. 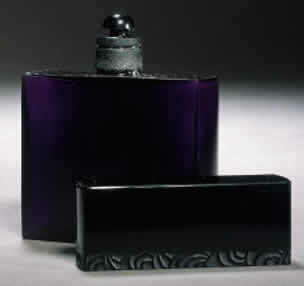 In 1934 she launched a line of fragrances for Dunhill including fragrances for men. 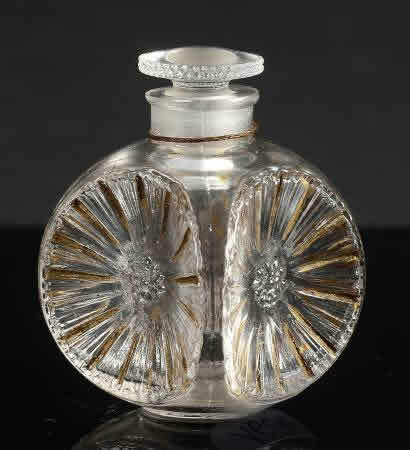 She commissioned Rene Lalique to supply a perfume bottle for her fragrance Flowers of Devonshire, a bottle that was created in 1935 and which is the Maison Lalique Gregoire bottle with the same stopper design but with the addition of a long dauber. 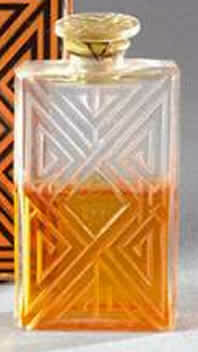 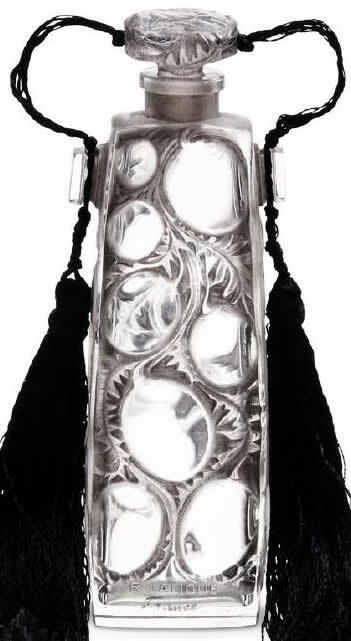 This would be the only bottle by Lalique for Dunhill. 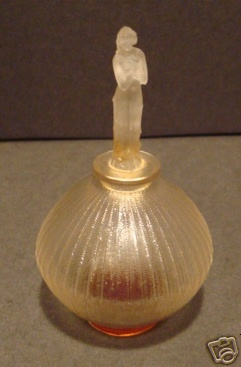 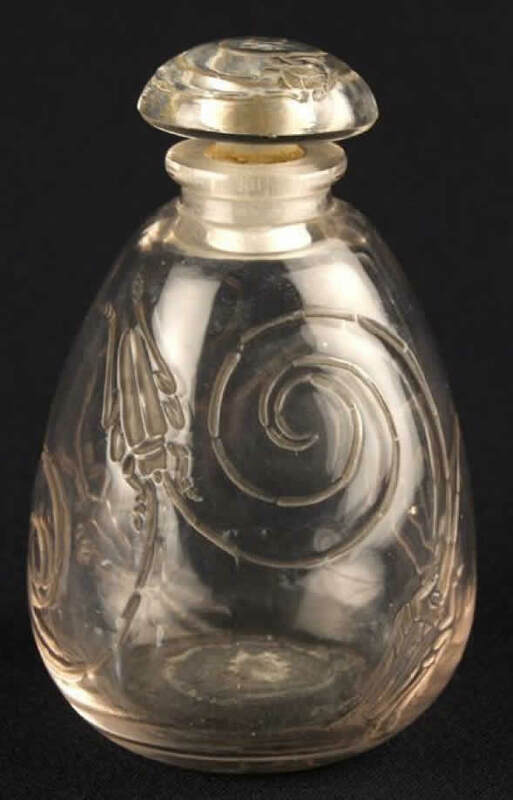 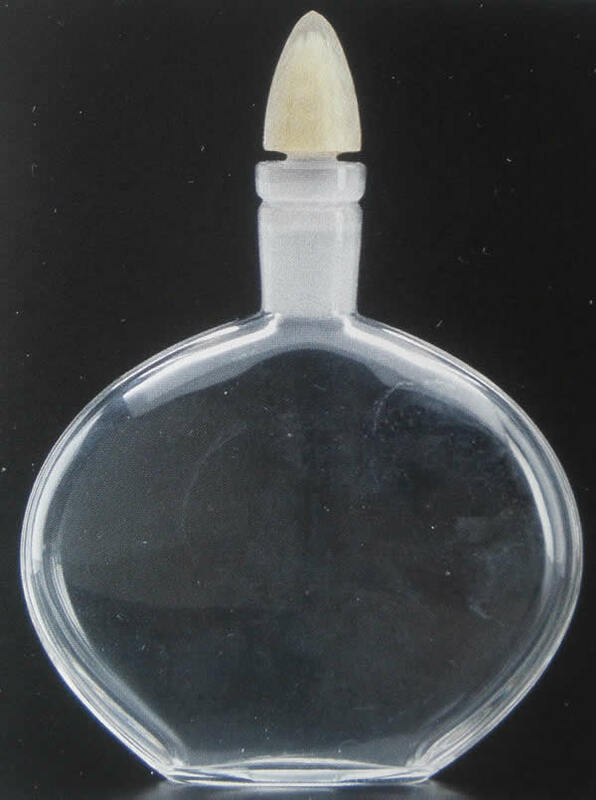 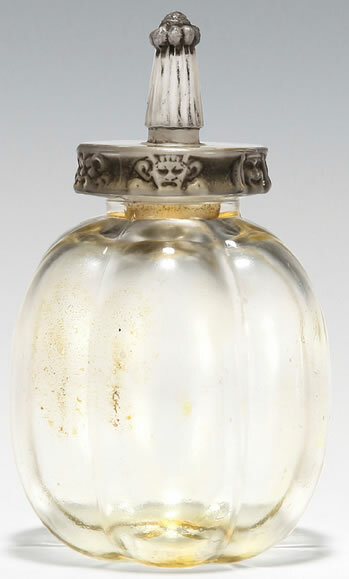 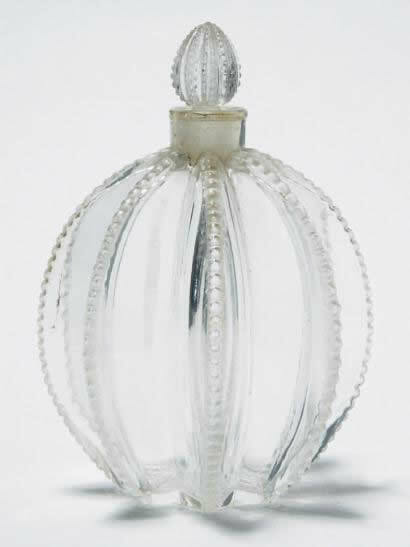 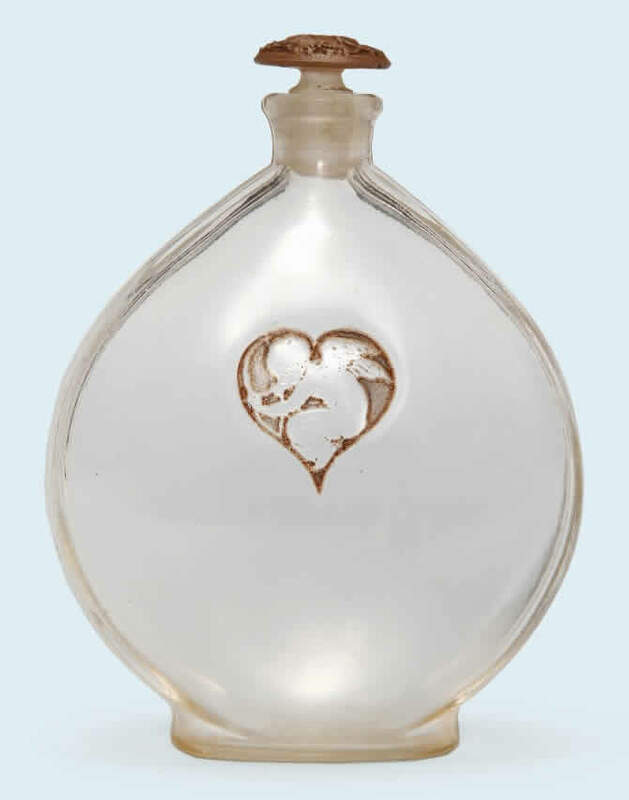 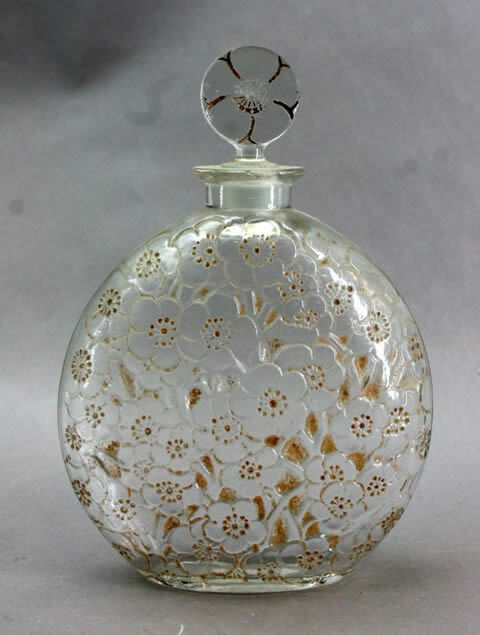 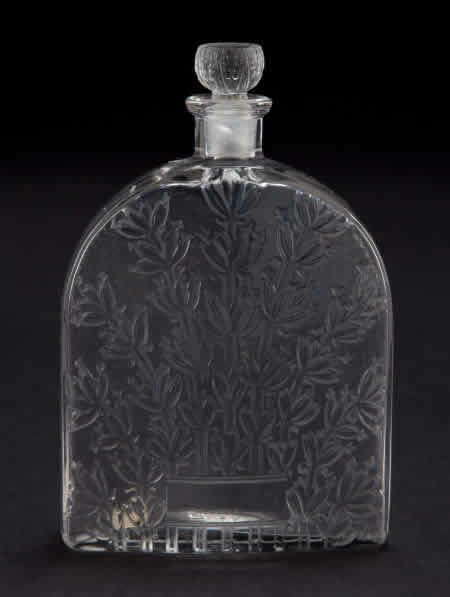 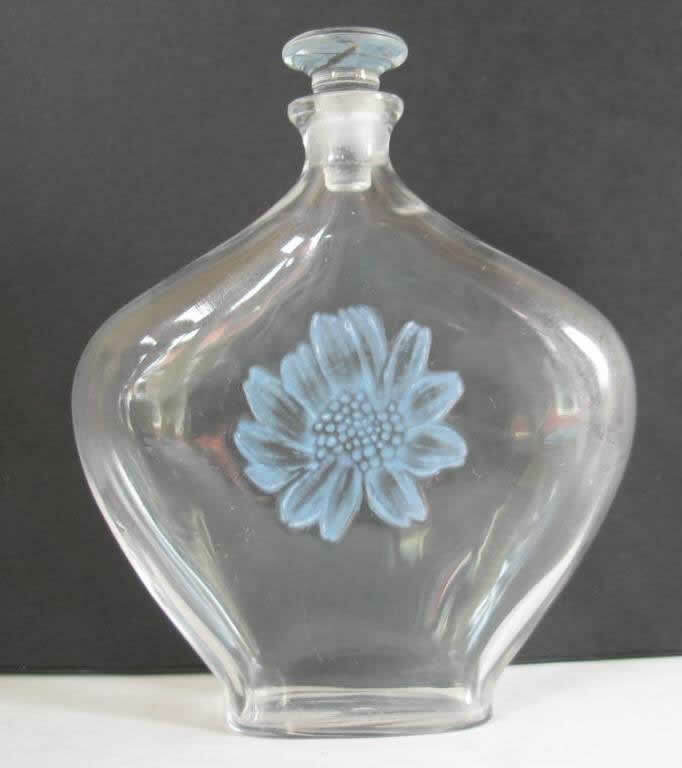 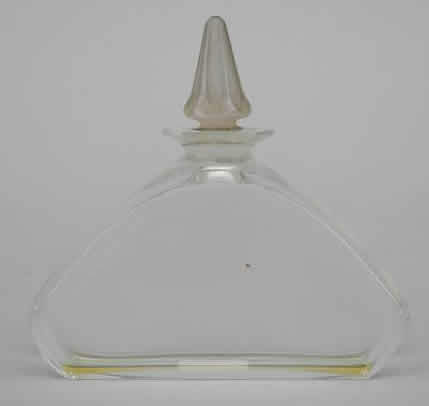 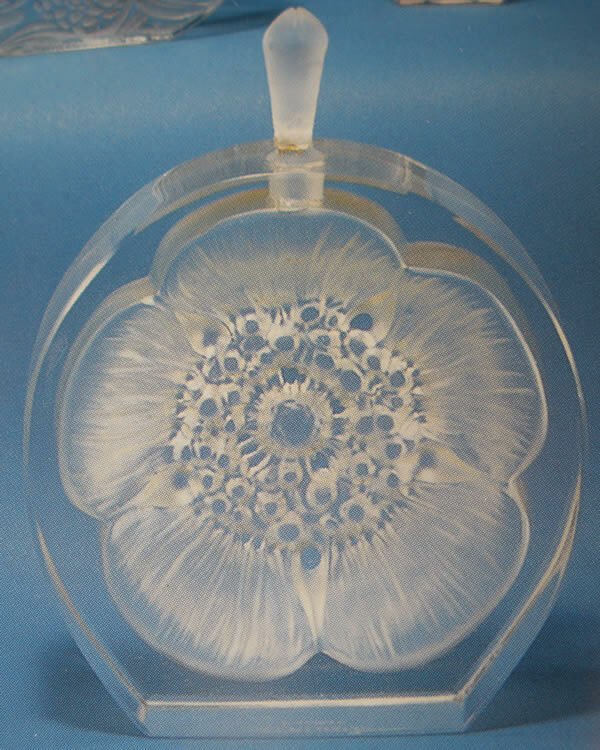 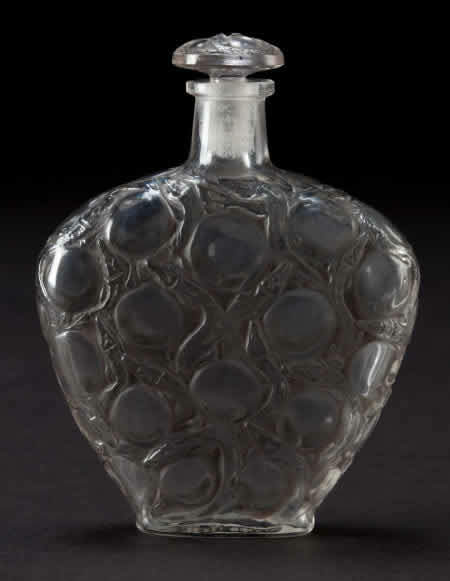 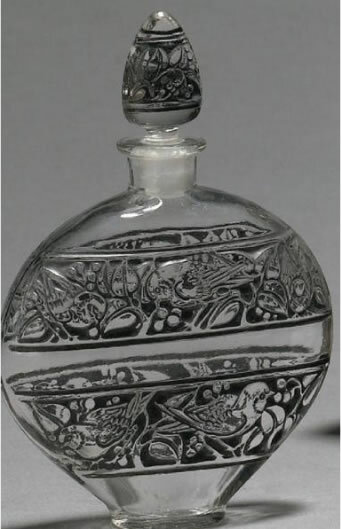 Later this Gregoire design bottle was made for Flowers of Devonshire (and possibly other Mary Dunhill fragrances) by another glassmaker using two different stoppers, neither of which resembles the original comporting Gregoire stopper. 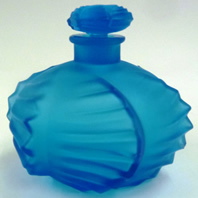 There would be a total of about half-a-dozen fragrances for women between 1934 and the early 1940's. 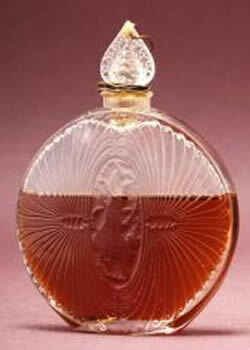 Mary died in 1988. 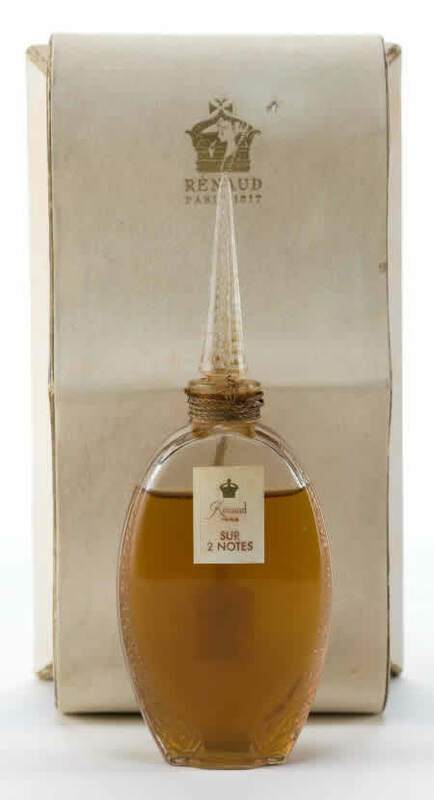 Dunhill continues in business to this day (2017) under the ownership of Compagnie Financière Richemont SA, the Swiss luxury goods company. 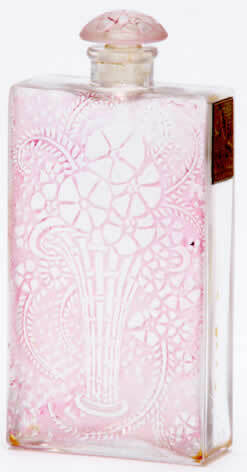 Its frgarance line still exists, but it's produced by another company under a license to use the Dunhill name. 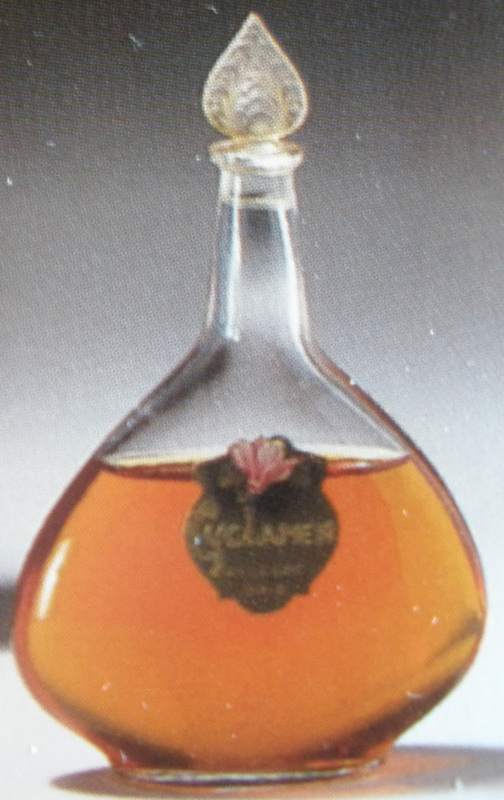 Molinard got started in 1849 in the rural town of Grasse. 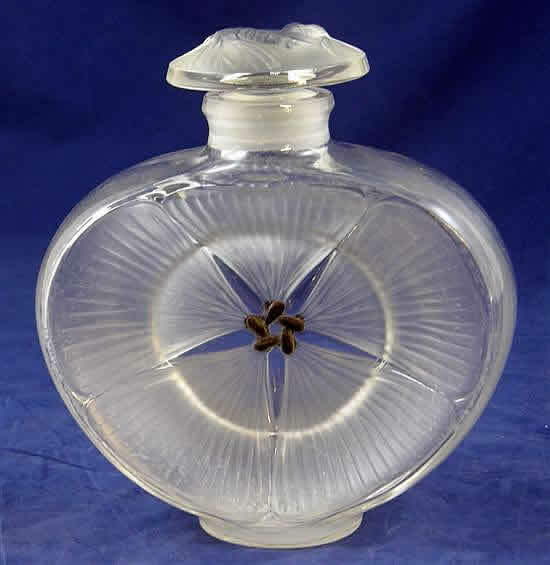 They had a world famous clientele for their scents, but did not open a shop in Paris until around 1920. 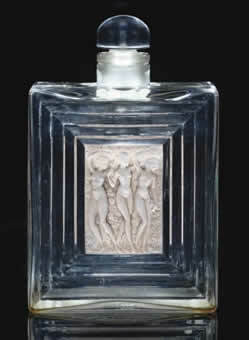 And it wasn't until 1927 that Rene Lalique designed his first of only 3 bottles for the firm, an elegant creation featuring 4 caryatids. 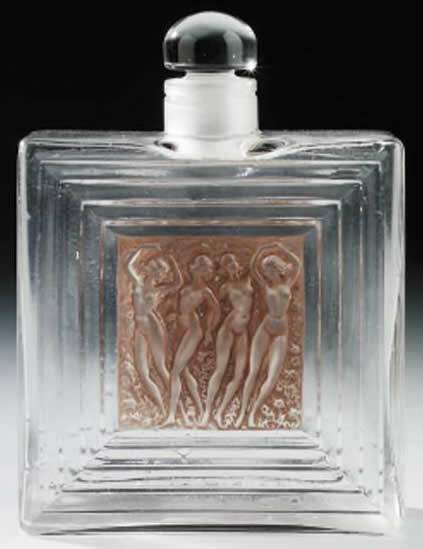 The 2nd bottle, the 1928 design Le Baiser Du Faune would win the award for the most beautiful perfume bottle in the world at the New York World's Fair in 1932. 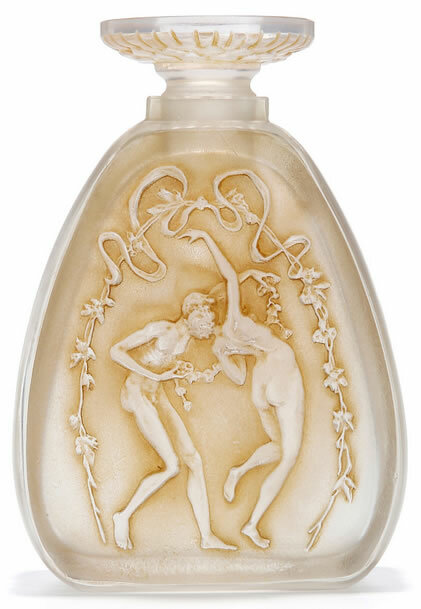 And the cavorting bacchantes style Calendal of 1930 remains a classic Art Deco design. 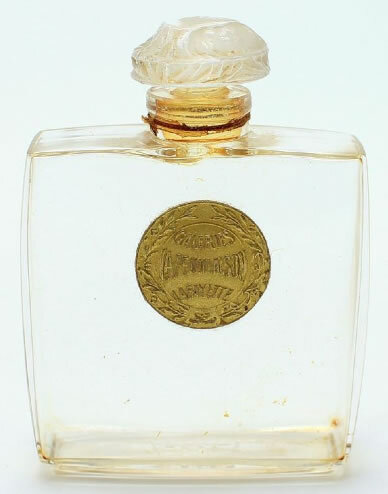 Molinard is still in business today, with a fifth generation perfumer as Managing Director that shares the family name of the man who created the scent Habanita in 1921. 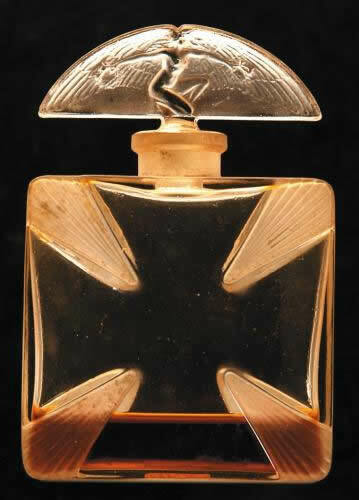 Les Parfums De Molyneux was founded by British Army veteran Edward Molyneux in 1926. 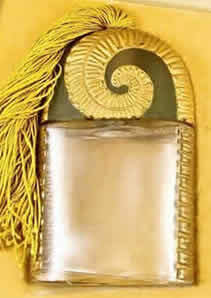 At the time, his couture shop was located at 5 Rue Royale in Paris. 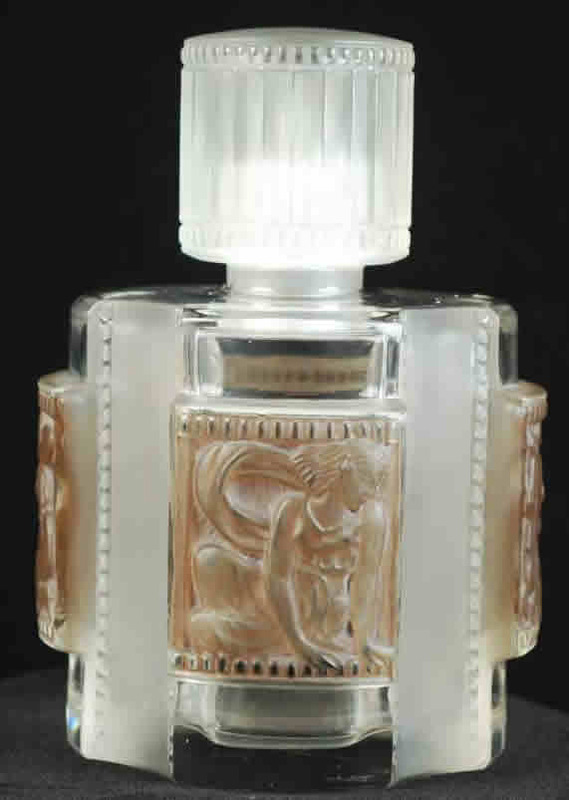 The fragrance Le Numero Cinq, whose bottle was created by Rene Lalique in that same year, was named sympathetically for the store address. 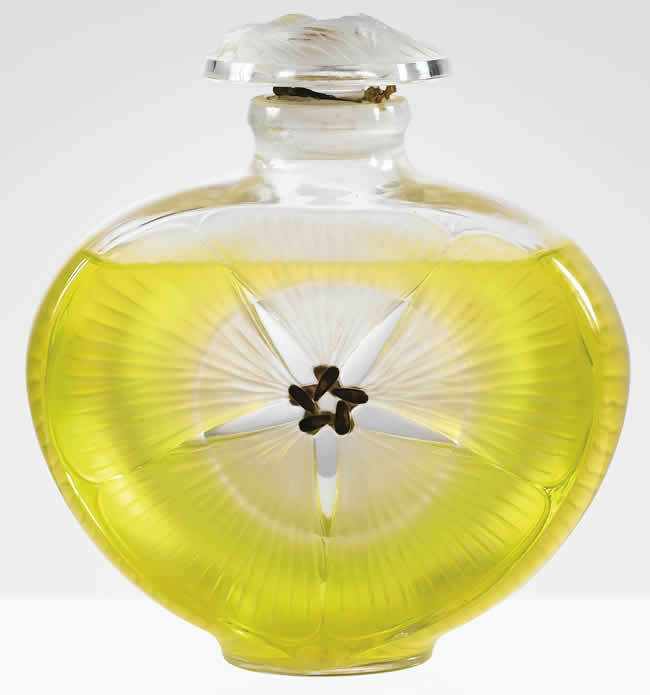 Paul Poiret founded Parfums de Rosine in 1911 naming the new venture after his daughter. 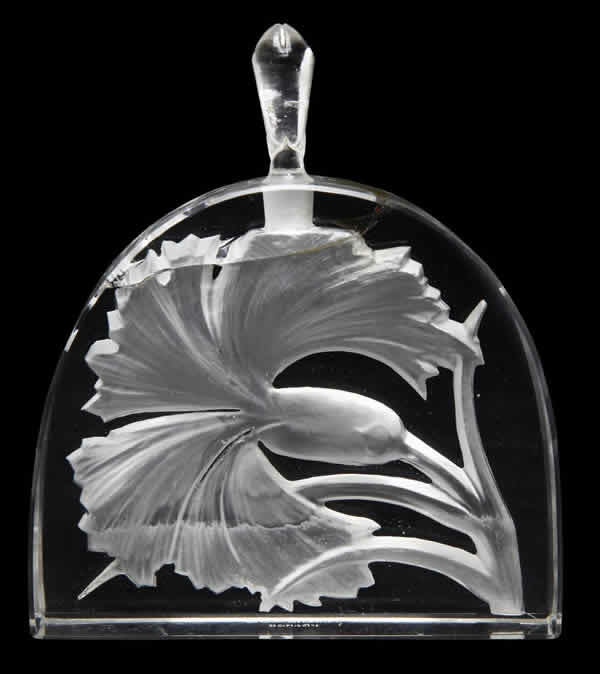 By that time he was already an internationally famous women's clothing designer having founded his own company for that purpose in 1903. 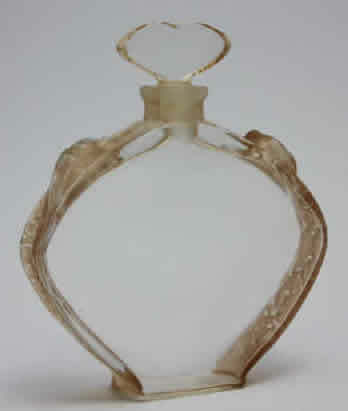 His contributions to the revolution in women's fashion early in the century cannot be overstated. 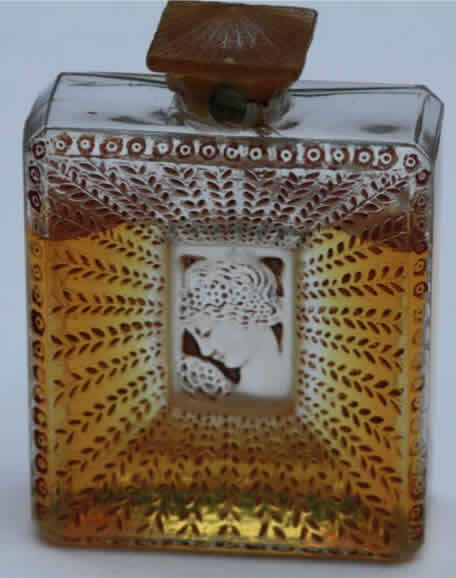 For the launch of Rosine he organized the famous party "la mille et deuxième nuit" (The Thousand and Second Night), a fantastical affair for Paris high society that included tropical birds, his wife appearing in a luxurious golden cage, and he the Sultan. 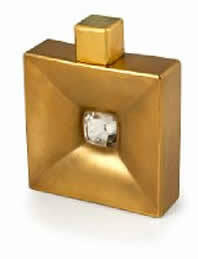 All the guests reportedly received a sample of his first fragrance "Nuit Persane" (Persian Night). 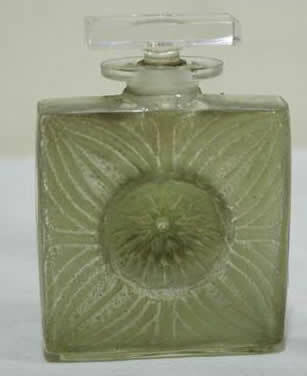 After serving in the military in World War I he was unable to get his company back on track upon his return. 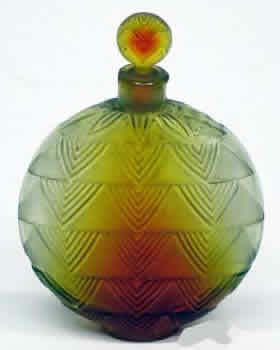 By about 1928 he had lost everything and his company was closed and liquidated in 1929. 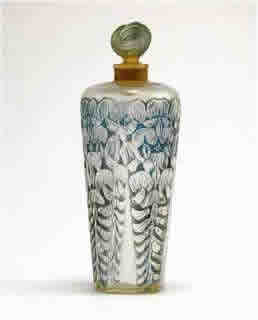 By the time of his death in 1944 he was almost totally forgotten having lived his remaining years on the edge of poverty doing odd jobs. 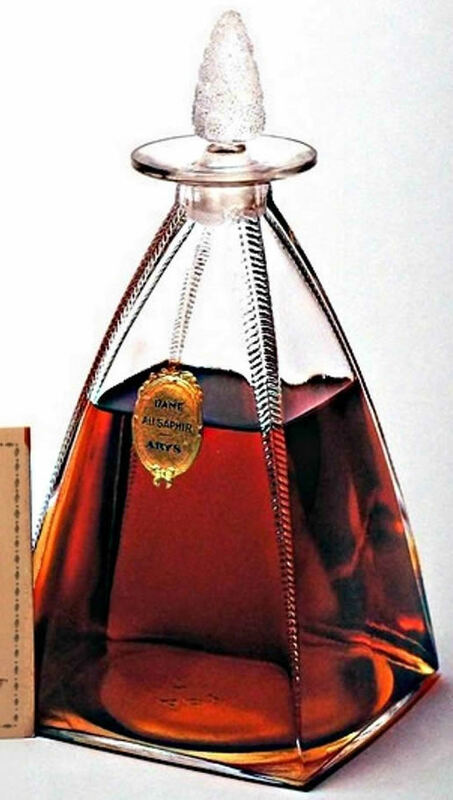 In 2005 his wife's wardrobe was auctioned off, with one coat alone selling for €110,000. 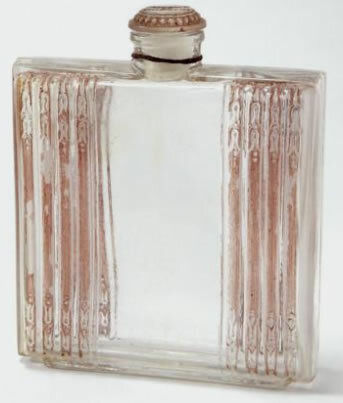 Later the New York Metropolitan Museum held an exhibition to honor his contributions to fashion "Paul Poiret: King of Fashion" that included pieces the Met had acquired at the 2005 auction. 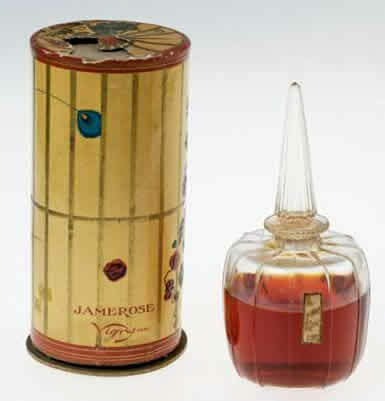 His perfumes were similarly honored at an exhibition in Grasse in 2013 by the Musée International de la Parfumerie titled "Paul Poiret: Couturier Perfumer". 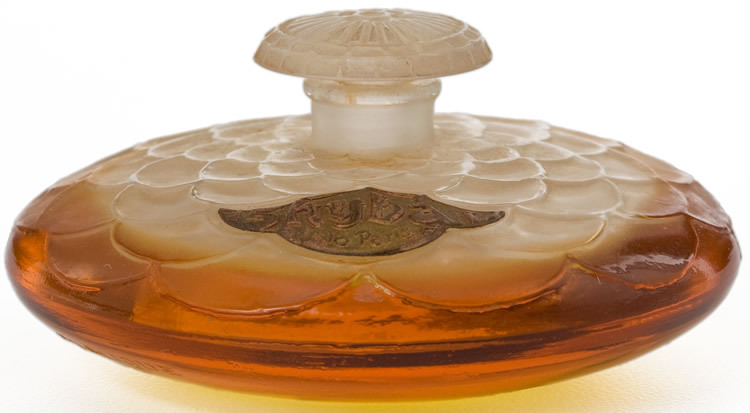 The R. Lalique bottles used by Rosine were left-over bottles from an attempted marketing push in the United States by Roger et Gallet for their fragrance Persana around 1926/1927. 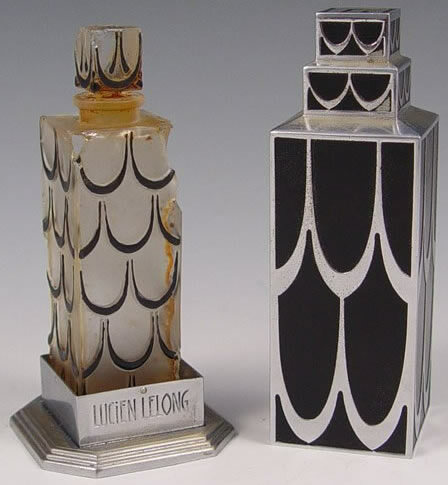 These bottles were the single design you see here for the fragrance China Night, and they were used about 1928 after Poiret had lost control of his companies. 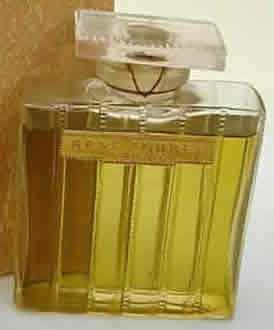 Les Parfums De Rosine exists today, having been re-launched in 1991. 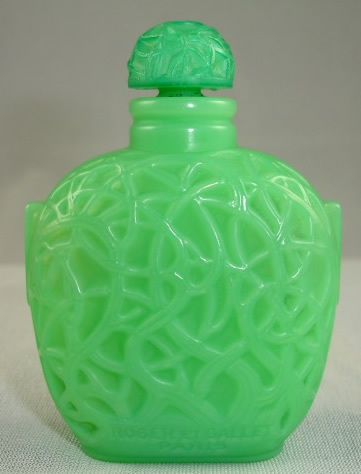 But except for the name, it has no relation to the company Poiret founded. 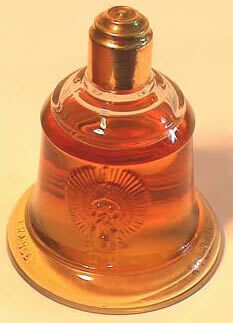 The perfumer Gueldy was founded by A. Sergent and Le Laurin in 1905. 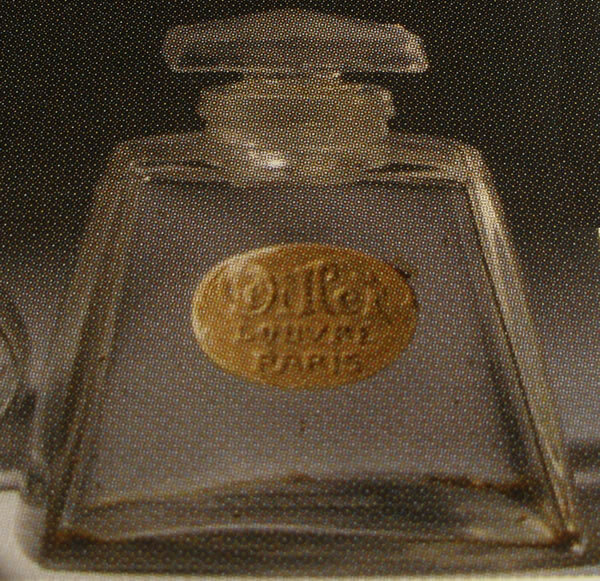 It operated in both Paris and New York also selling cosmetics and toiletries. 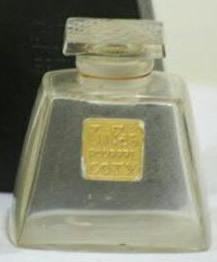 In 1930 A. Sergent founded Parfums de Sergy with the intention of marketing lower cost products under that name, but it later merged into Gueldy. 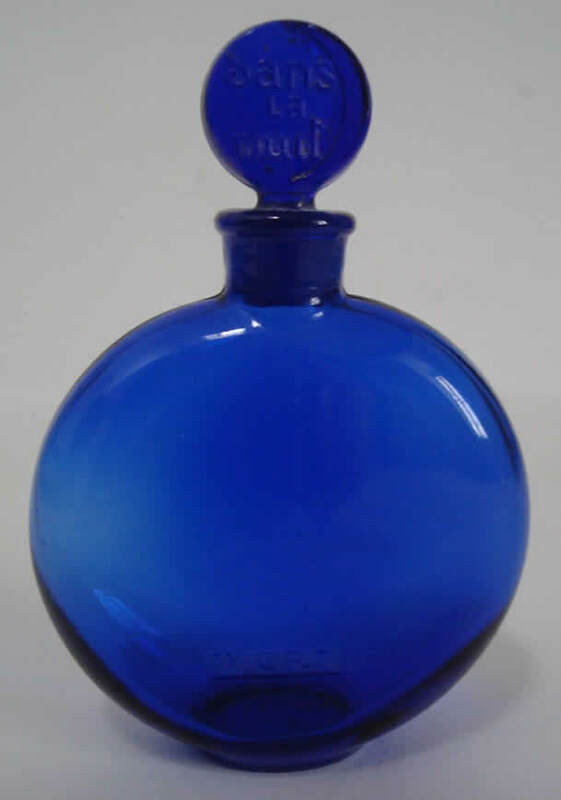 The name Sergy is reported to be the name of a Gueldy fragrance originally from 1910. 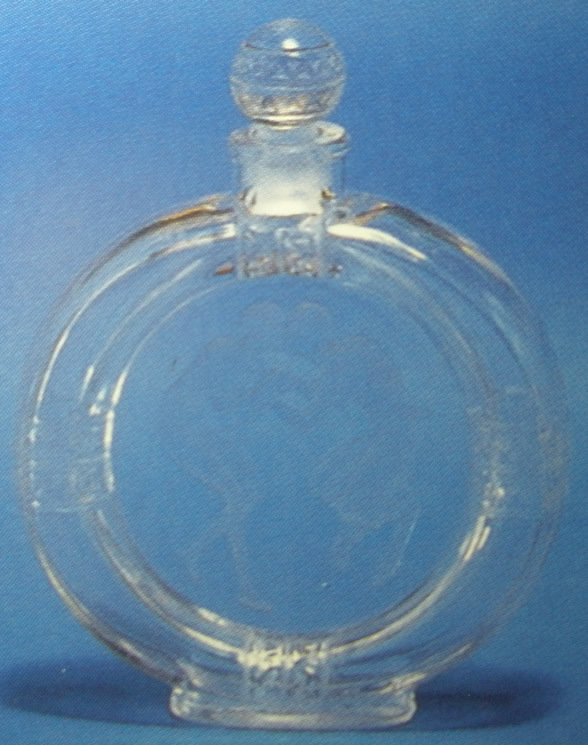 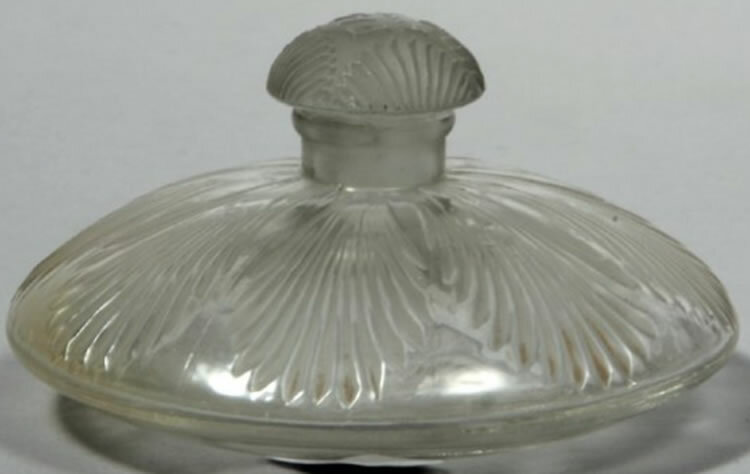 The single bottle from Rene Lalique used by Sergy is the container for Erasmic with a stopper that appears to be from Roger et Gallet's Persana. 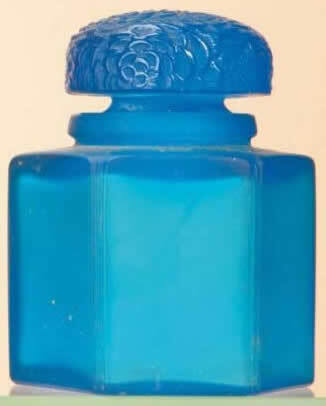 The circa date of the bottle shows as 1925, but that's when it was created for Erasmic. 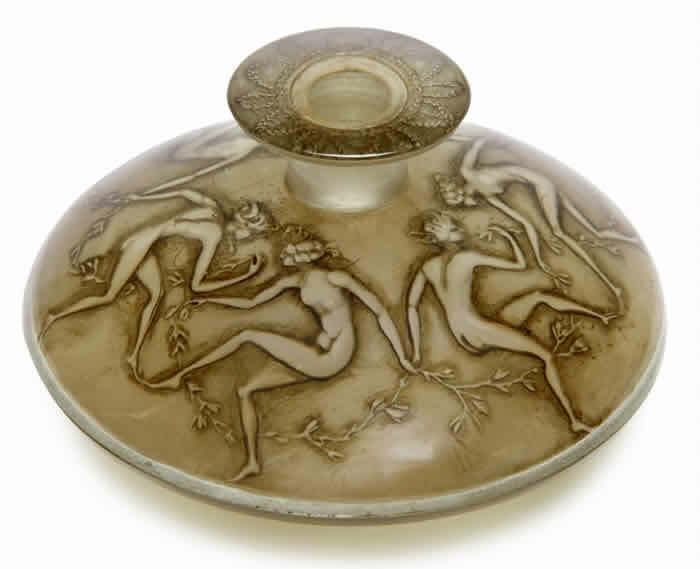 Sergy's use could not have occurred until the 1930's. 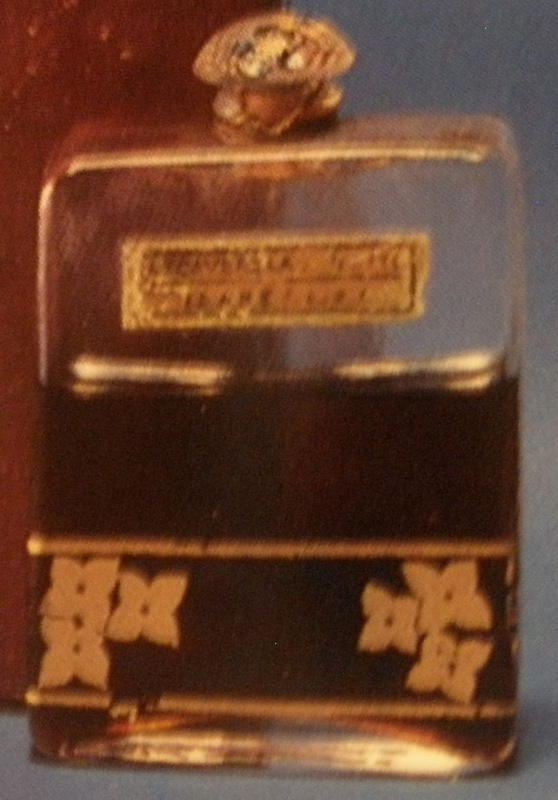 Eventually Lever Brothers acquired Gueldy, but the Sergy name was being used on new fragrances at least until 1953. 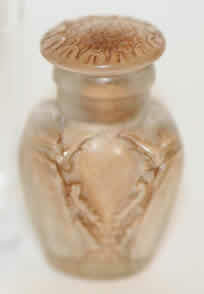 Tokalon was founded by Ewing Virgil Neal. 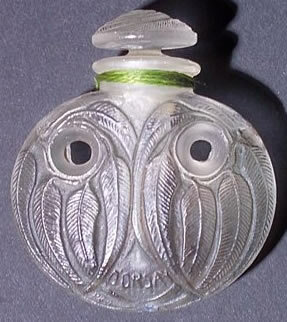 Neal was many things including a performing hypnotist. 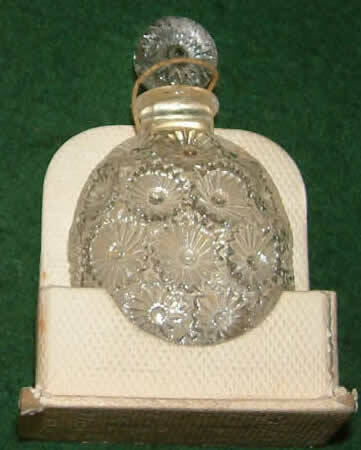 Befitting a guy that sold "Nuxated Iron" he also had more than one name, and was also known as (aka) Xenophon LaMotte Sage! 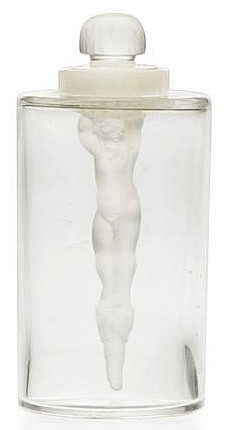 His life was not without controversy. 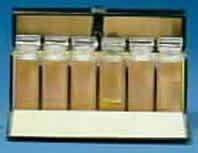 He was accused of being a a con man for selling phony health products using the U.S. mail. 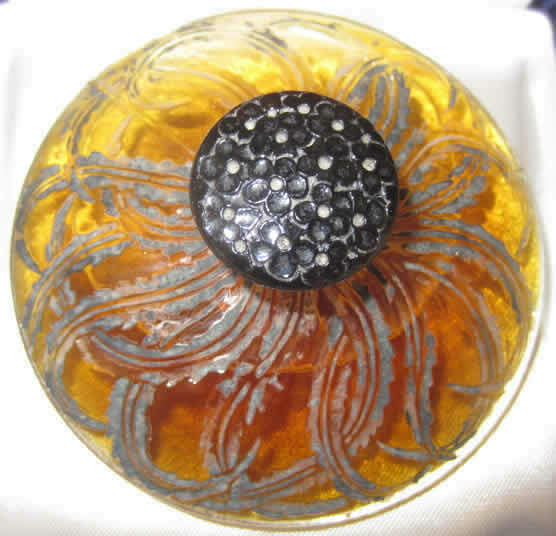 And having moved to France prior to the start of World War II, because of his activities during the war, he was thought to be collaborating with the Nazis. 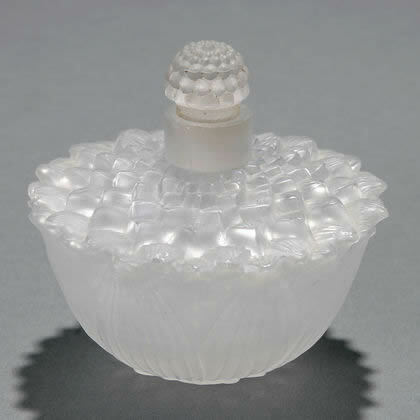 But he was also a pretty good businessman and Tokalon was a successful venture marketing all manner of toiletries. 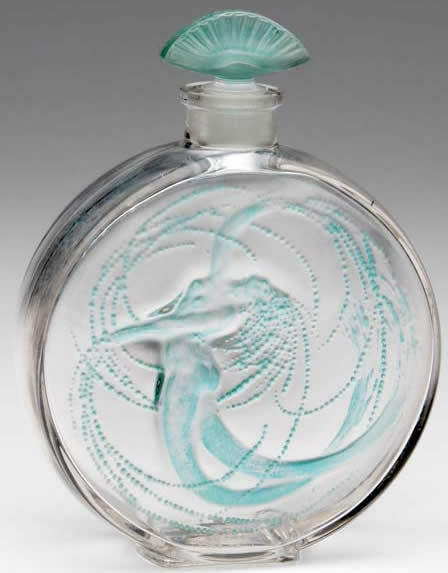 It released over 30 fragrances between 1910 and 1928 including Petalia(s) And Captivant de Tokalon, for which they used the single bottle created for them by Rene Lalique that is shown below. 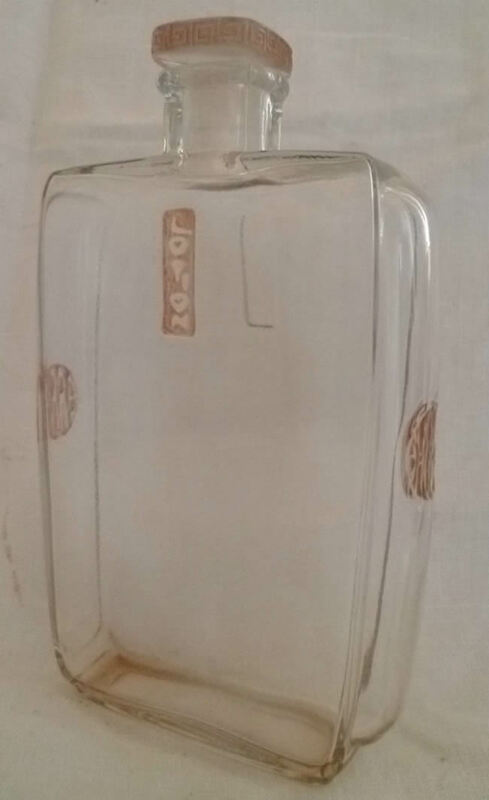 Tokalon is still in business today under the ownership of the Swiss company Cooper Cosmetics SA. 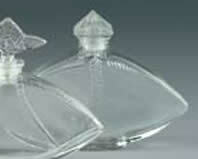 We are seeking information and/or documentation on the bottles pictured below. 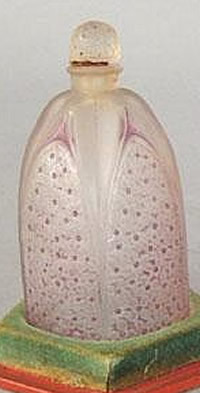 All have the early intaglio molded long-tail L signature to the underside. 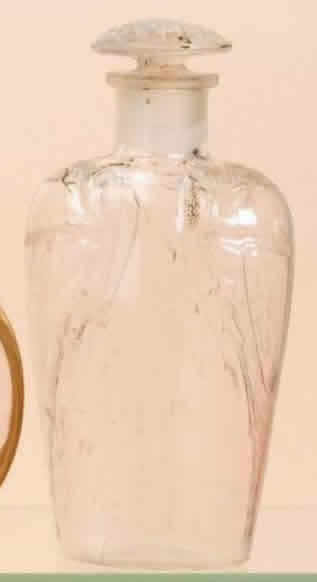 Whatever information we have about these bottles is included in the listing for each bottle.